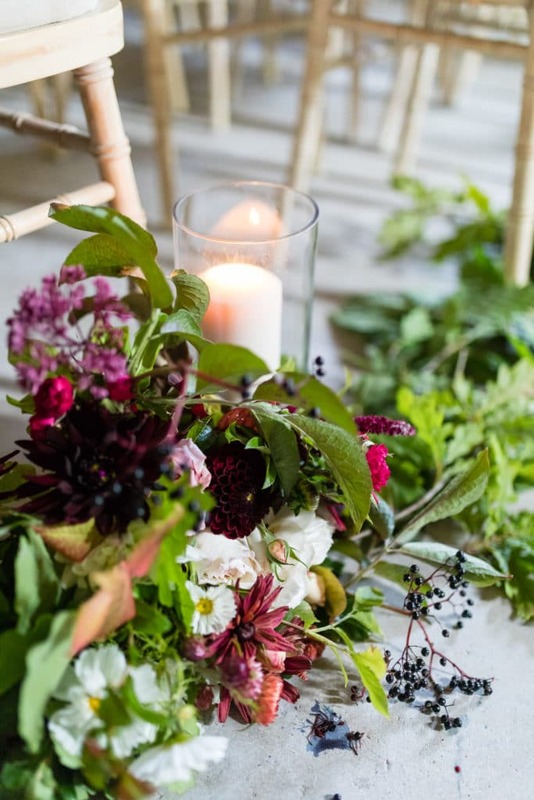 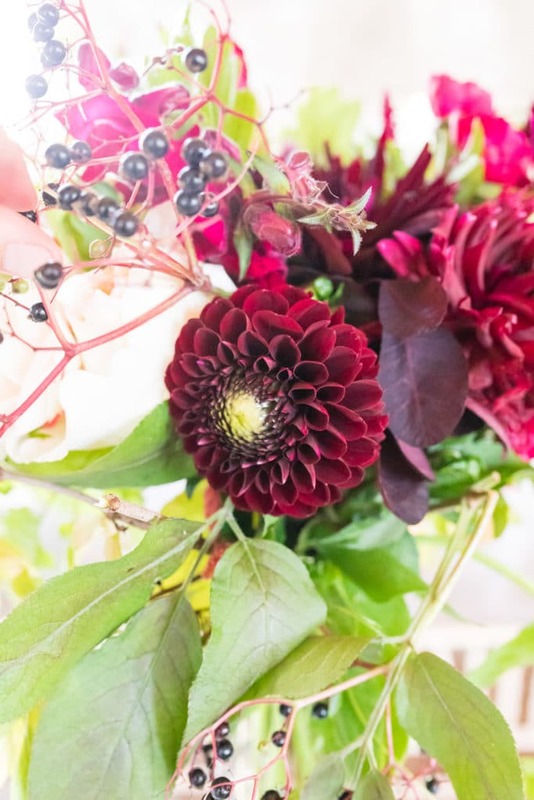 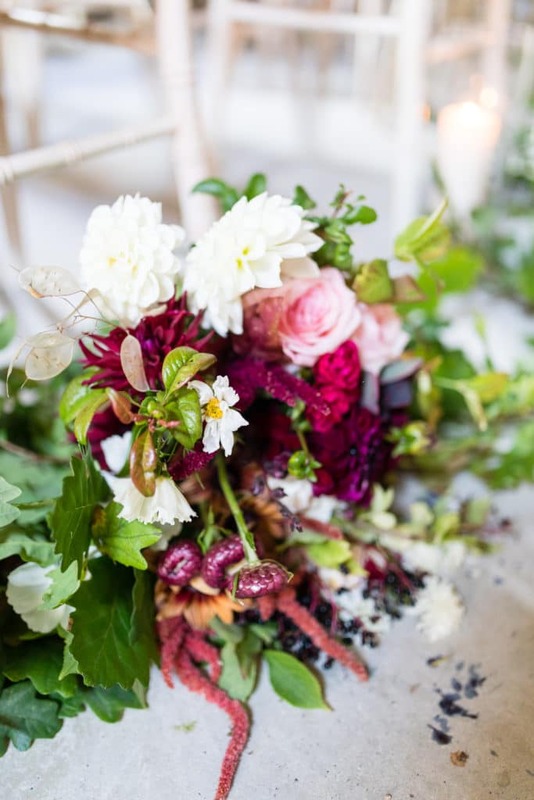 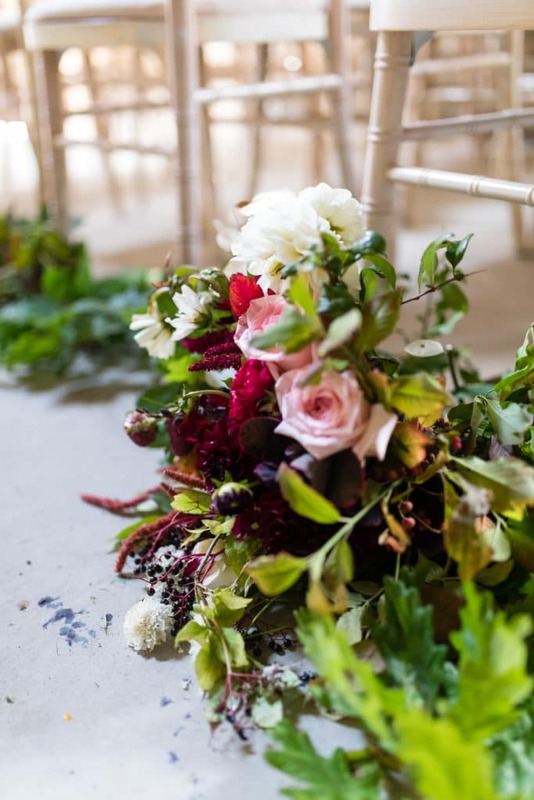 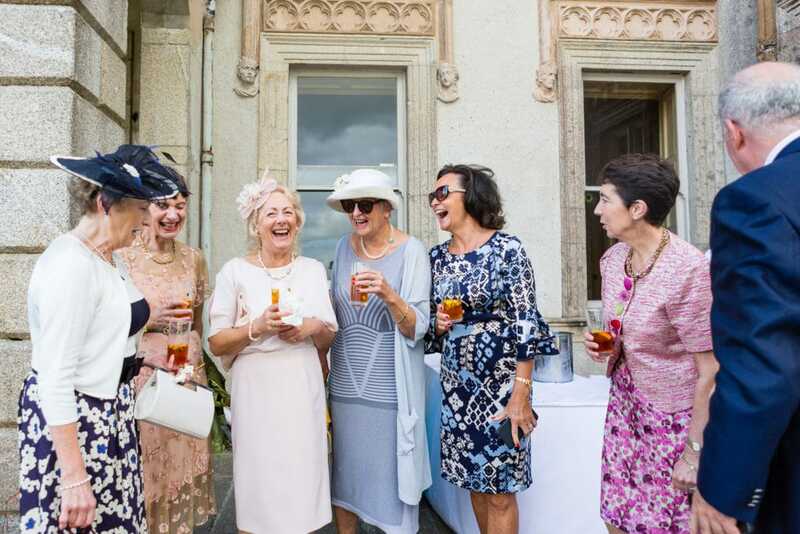 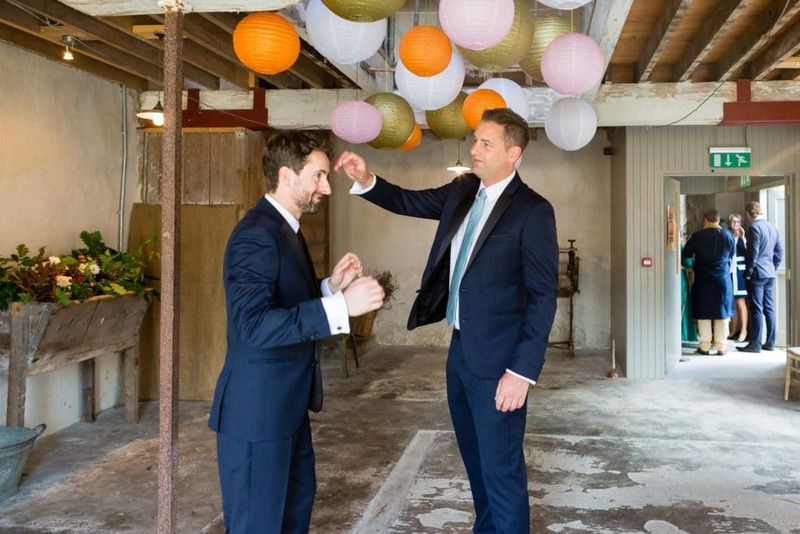 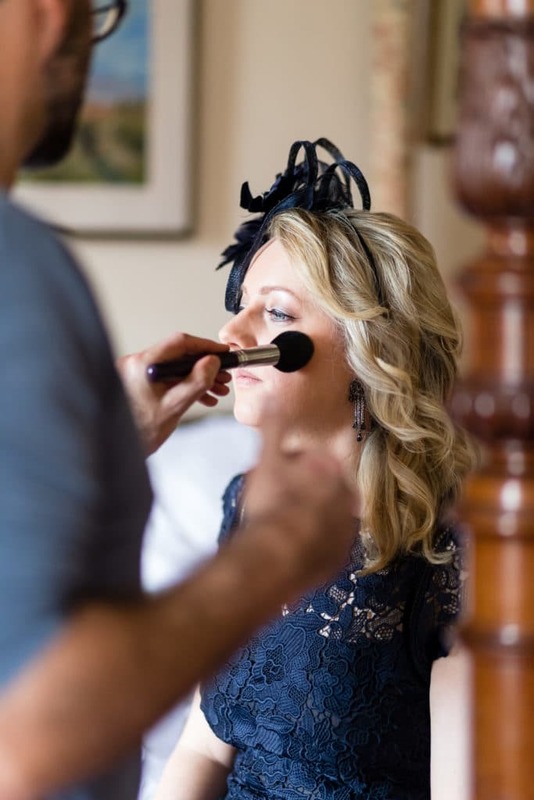 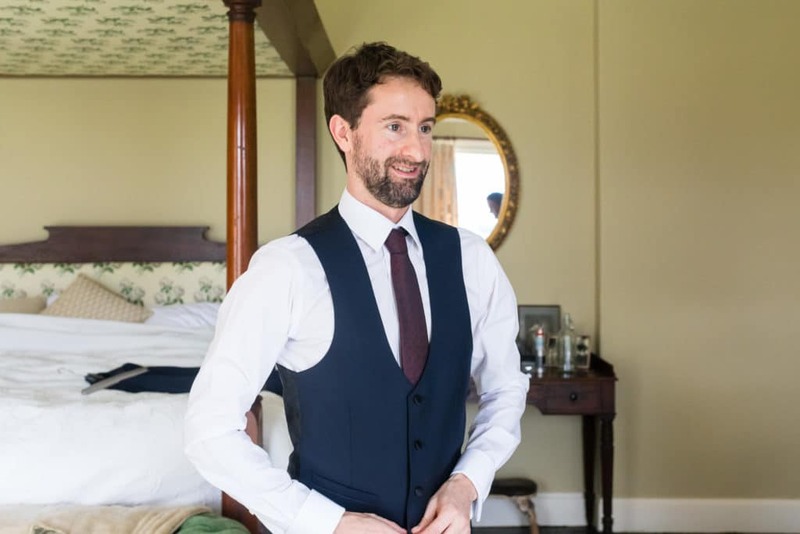 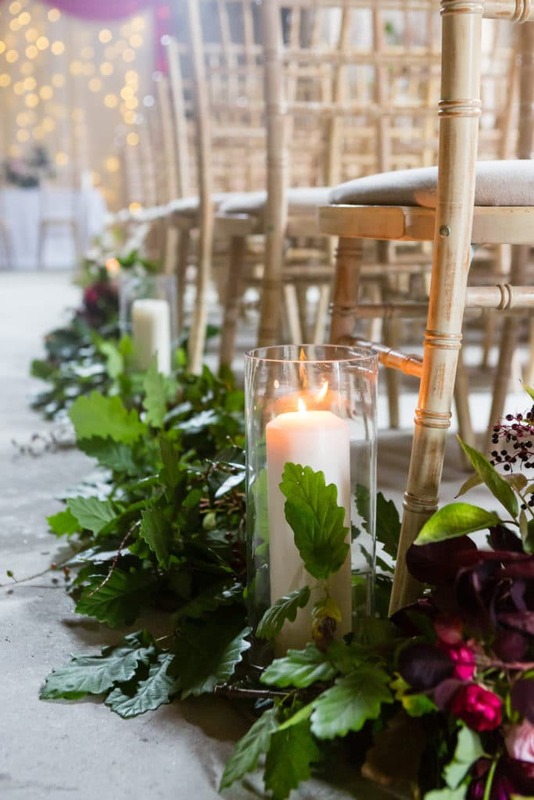 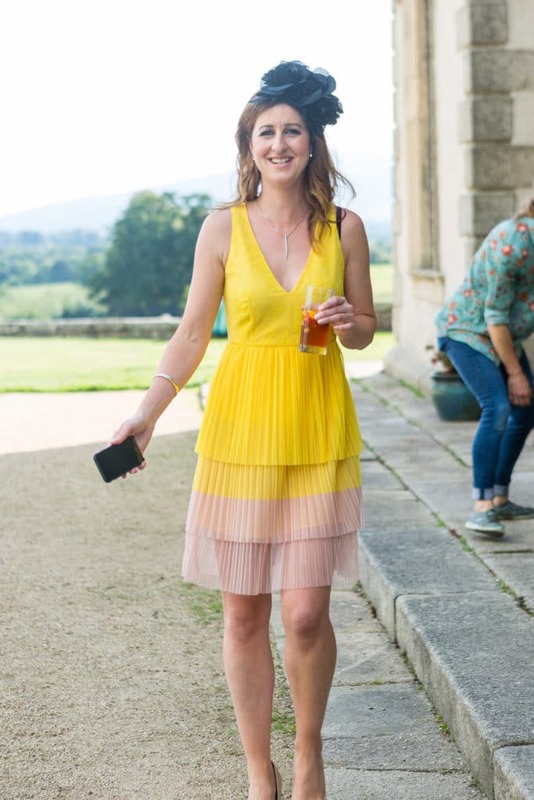 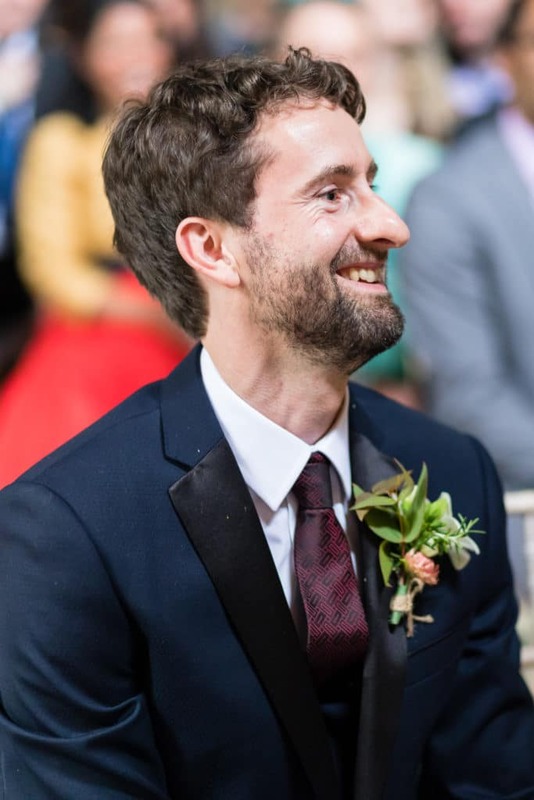 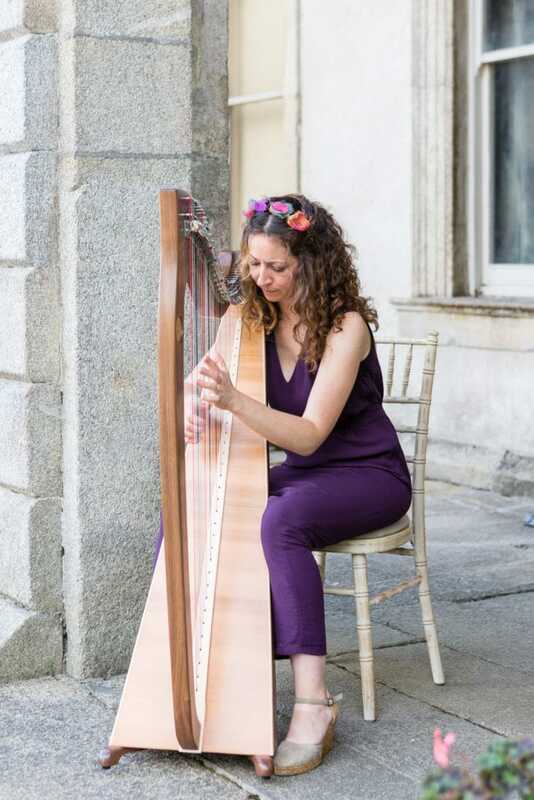 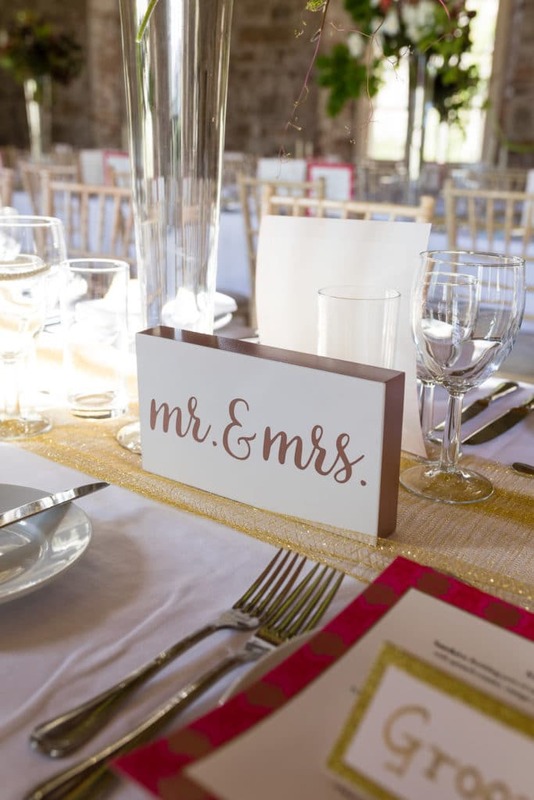 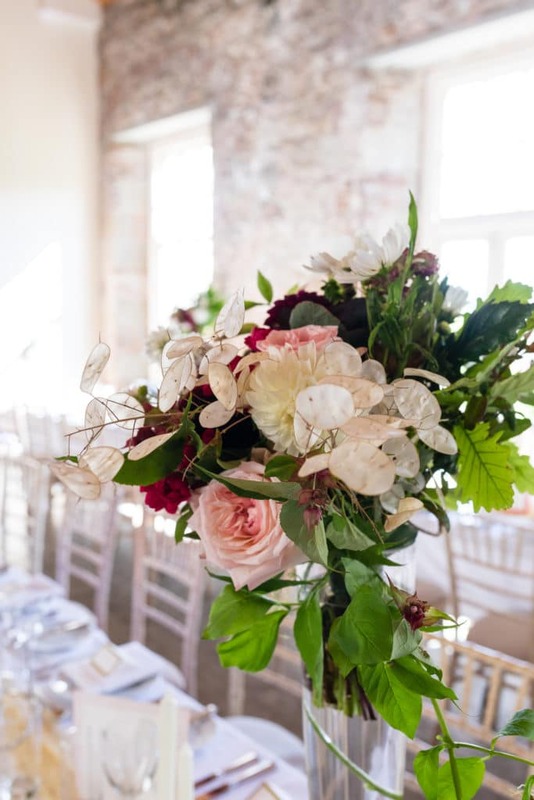 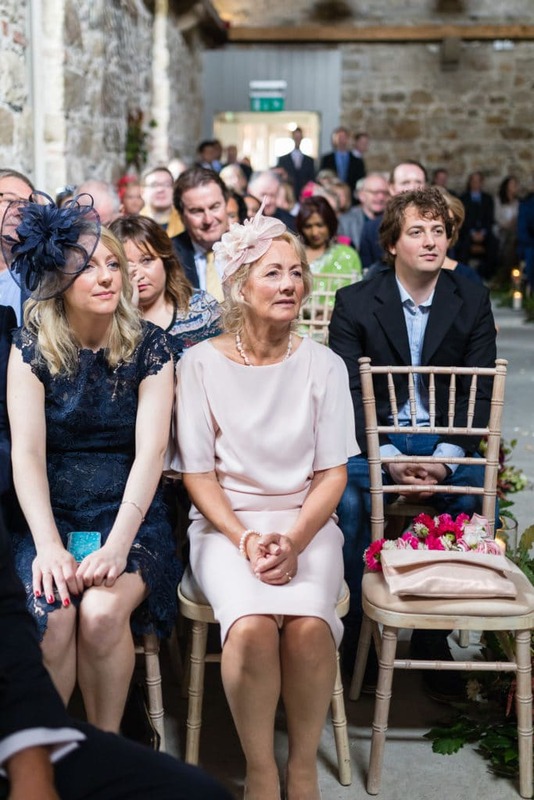 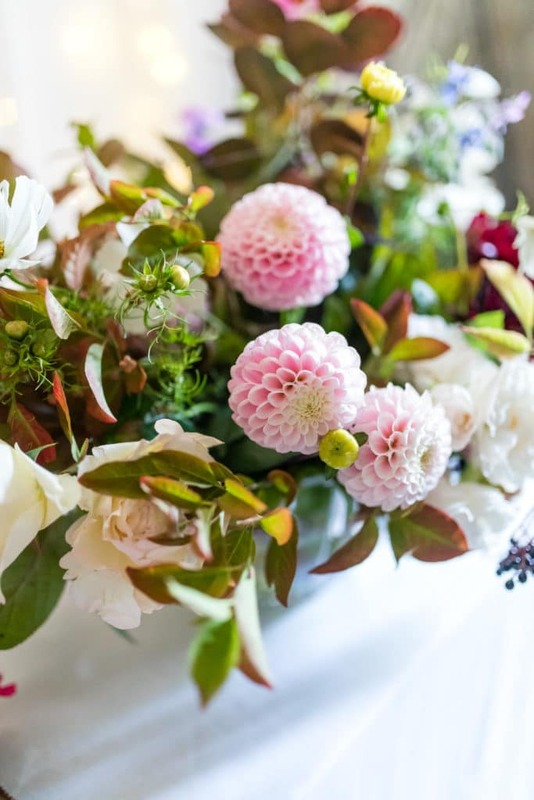 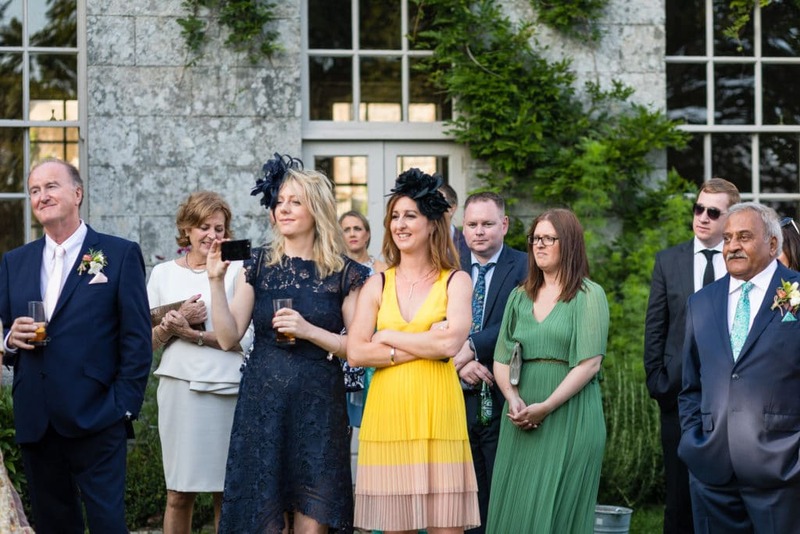 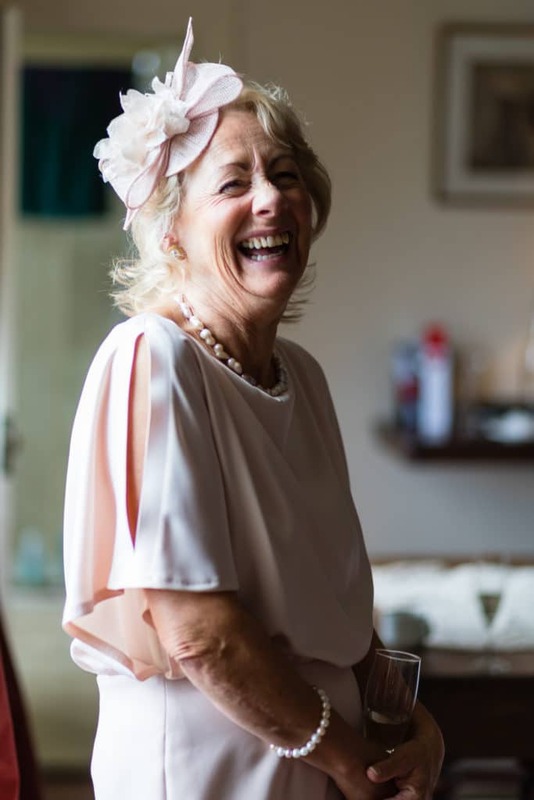 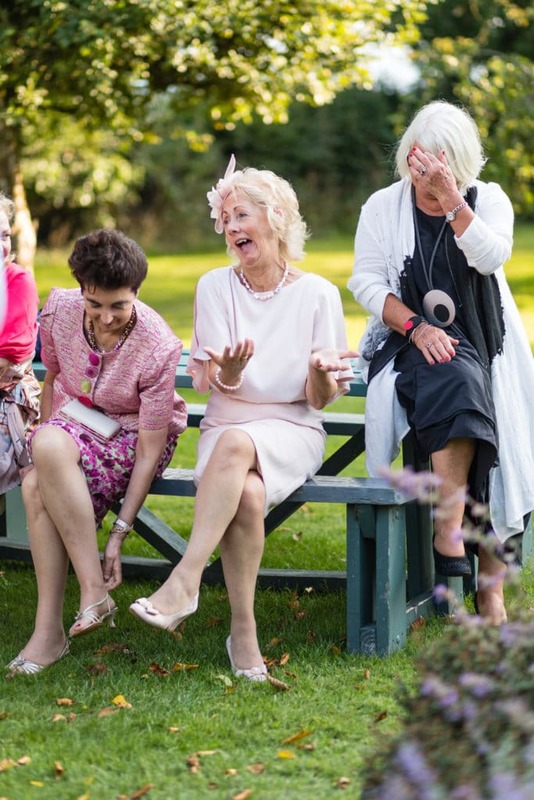 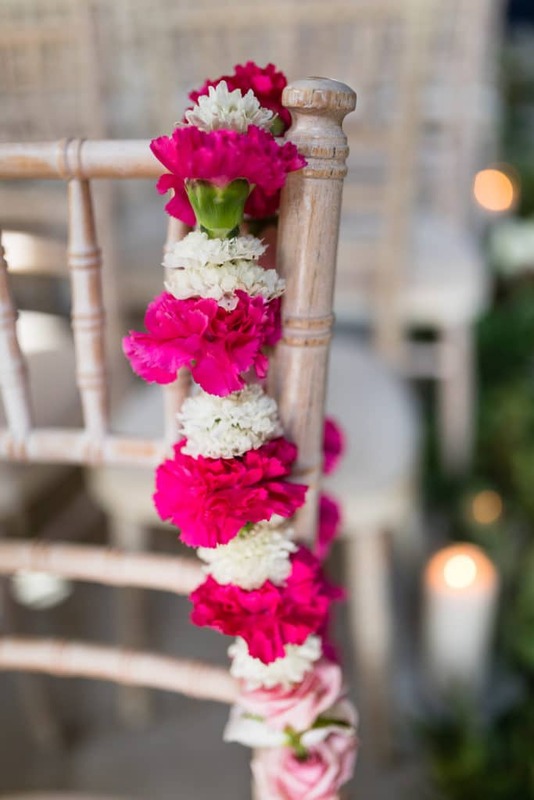 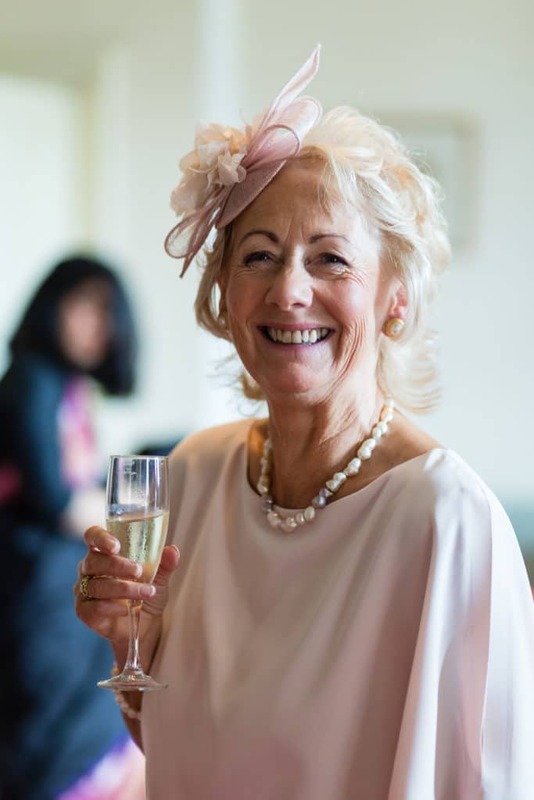 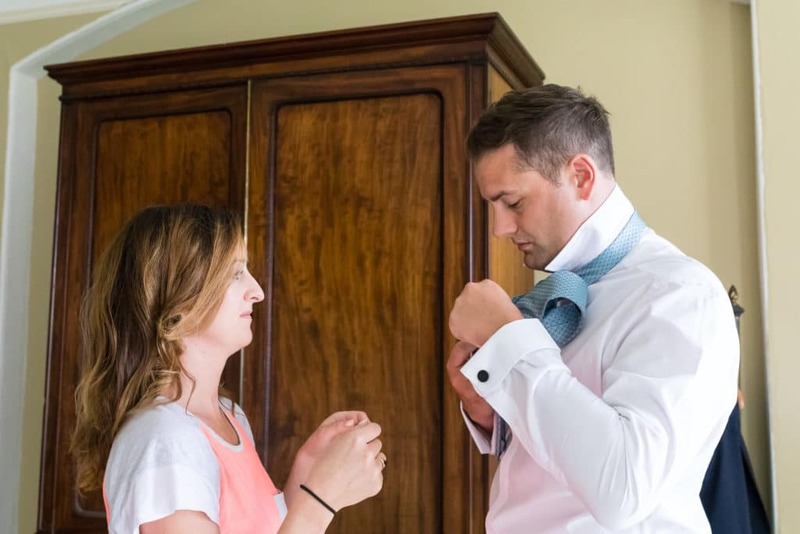 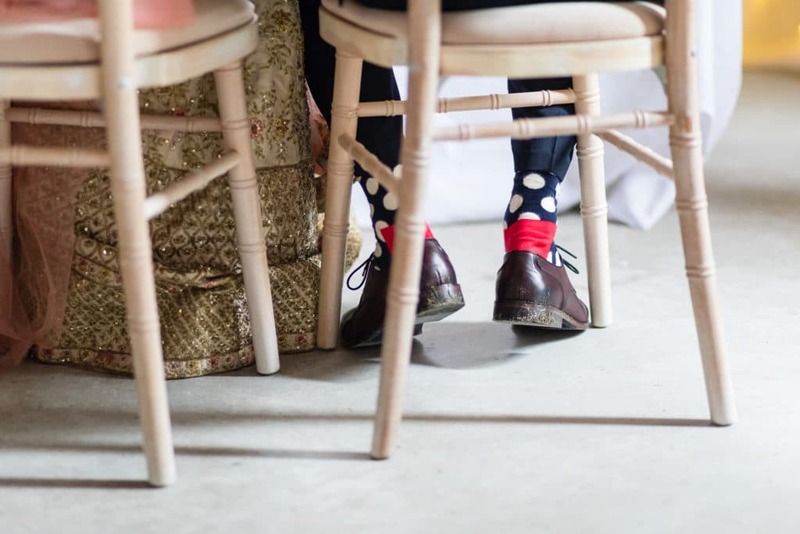 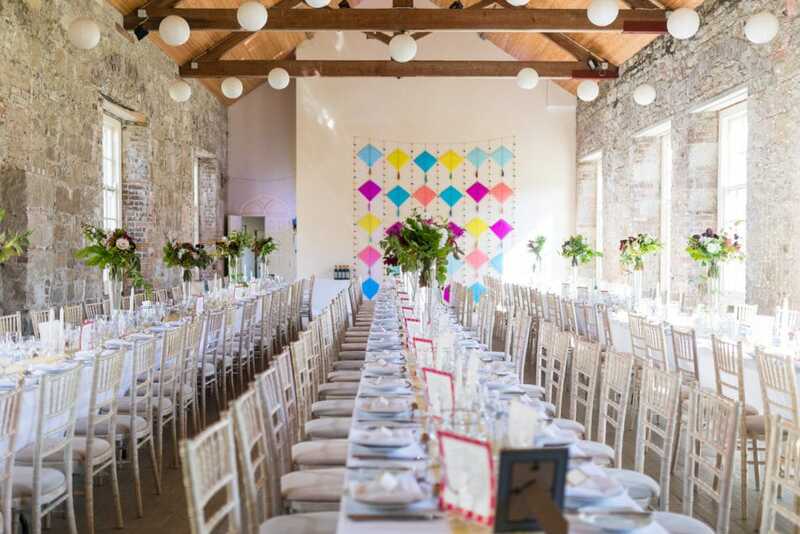 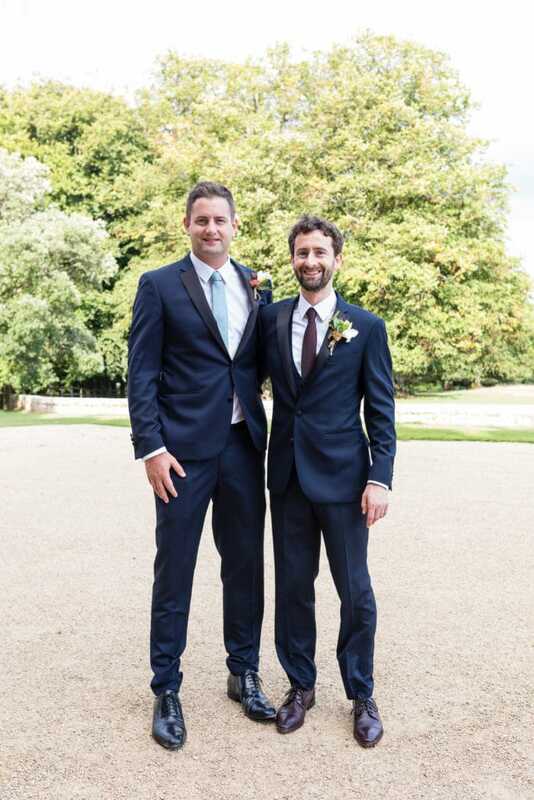 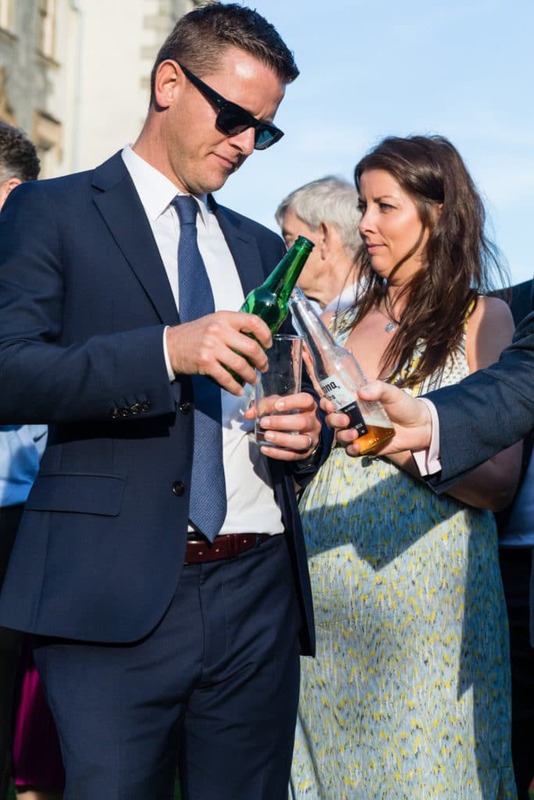 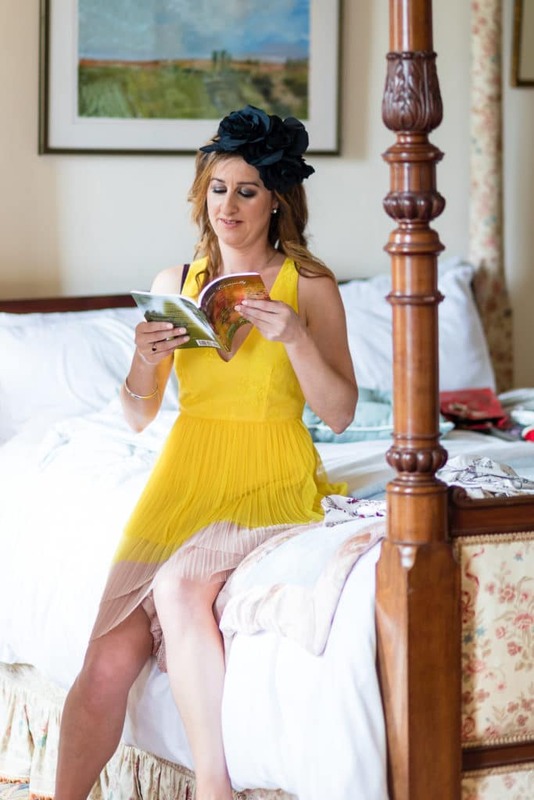 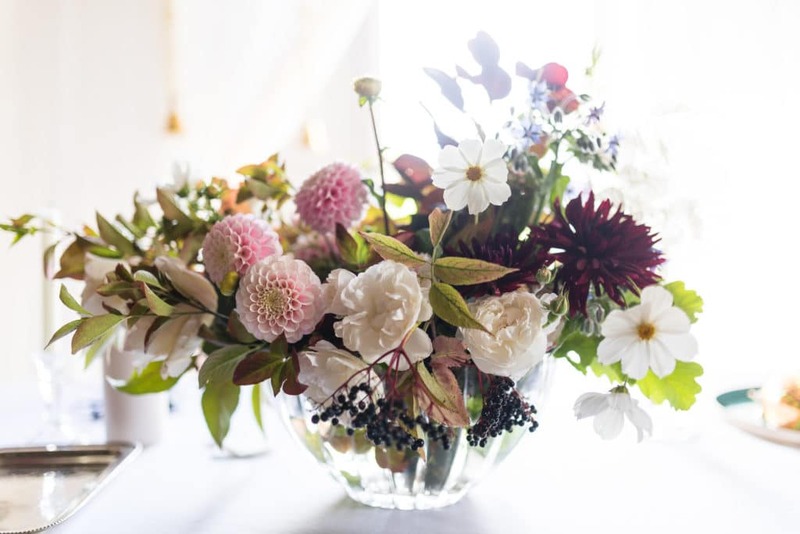 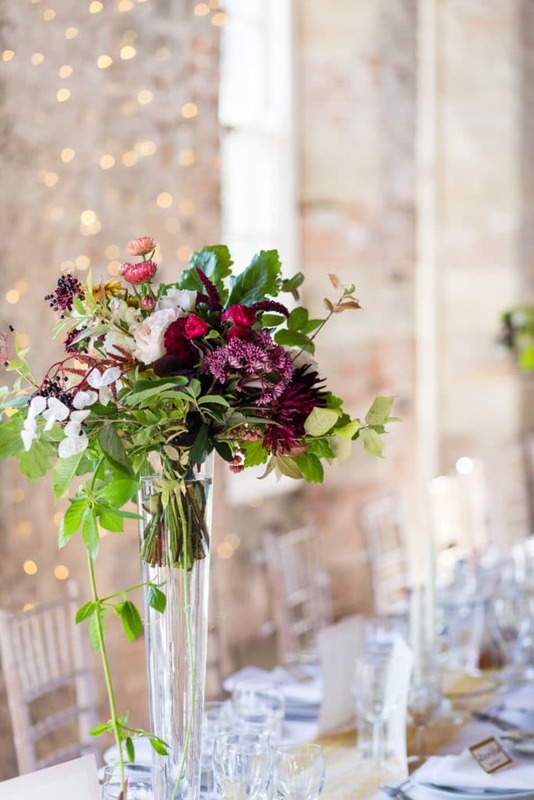 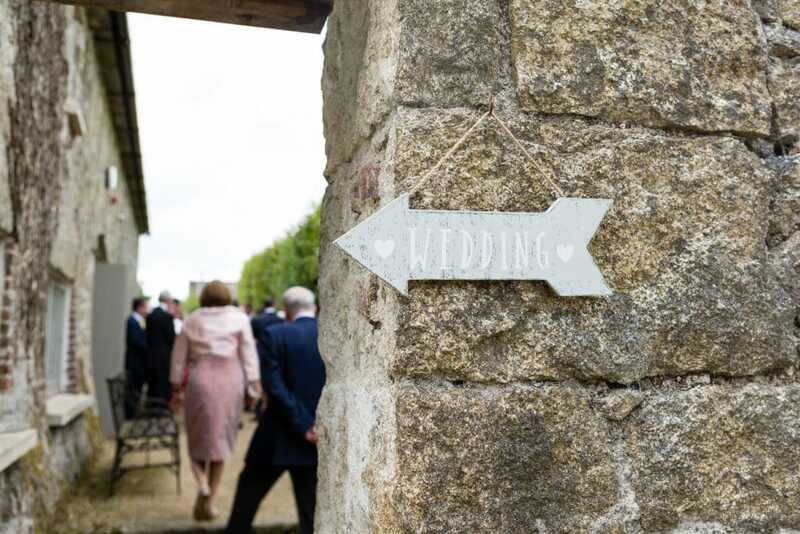 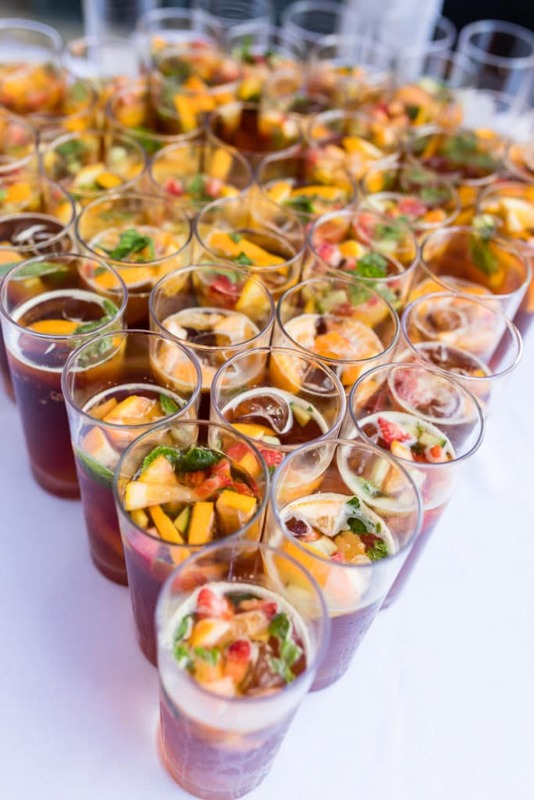 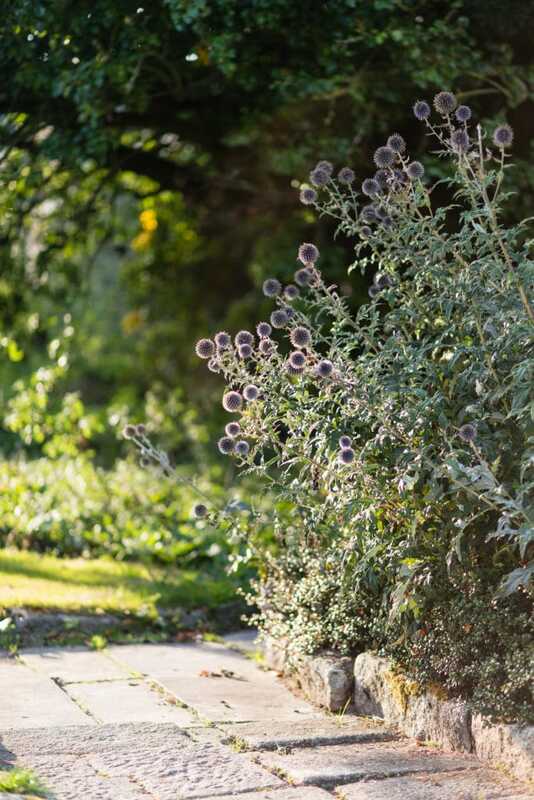 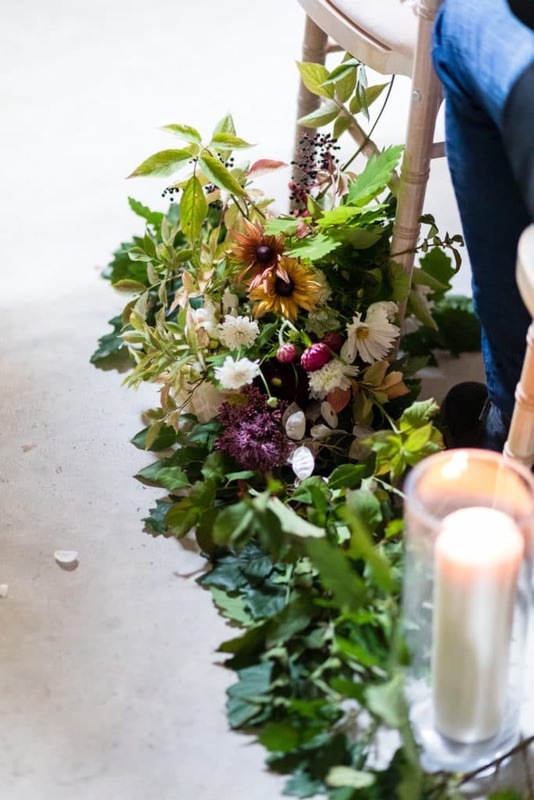 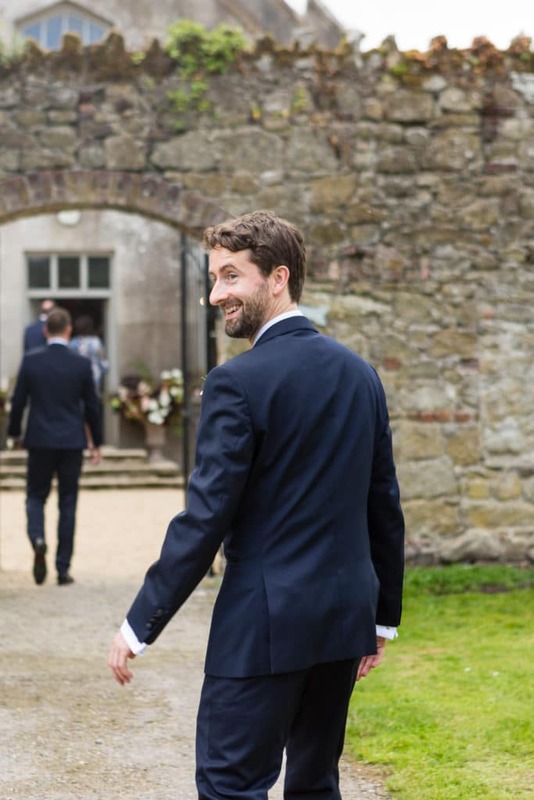 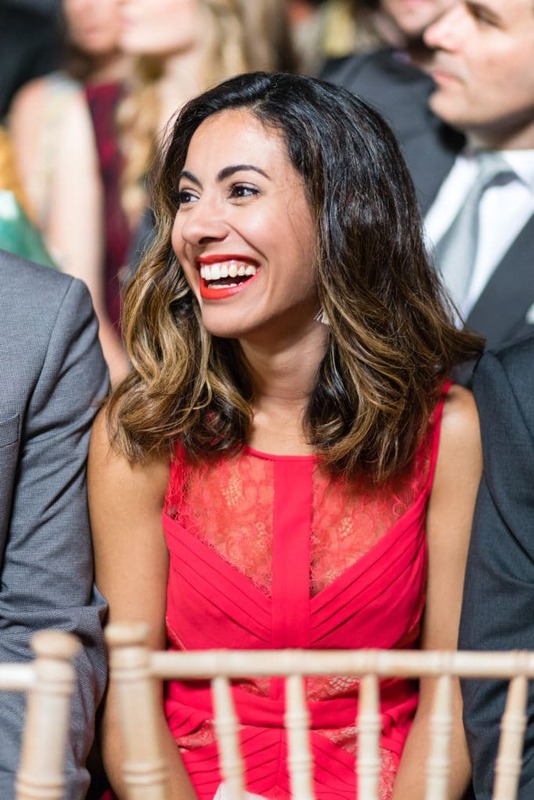 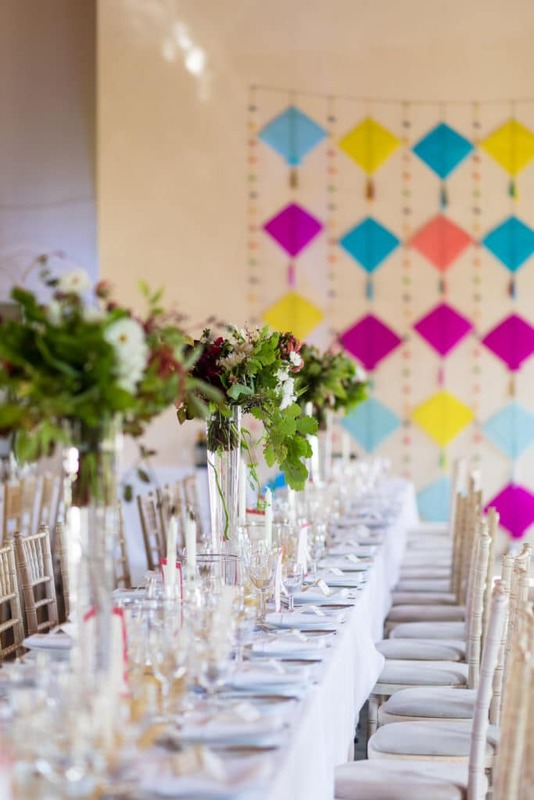 Fun, Relaxed, Colourful and Welcoming are the words that come to mind when I look at this wedding. 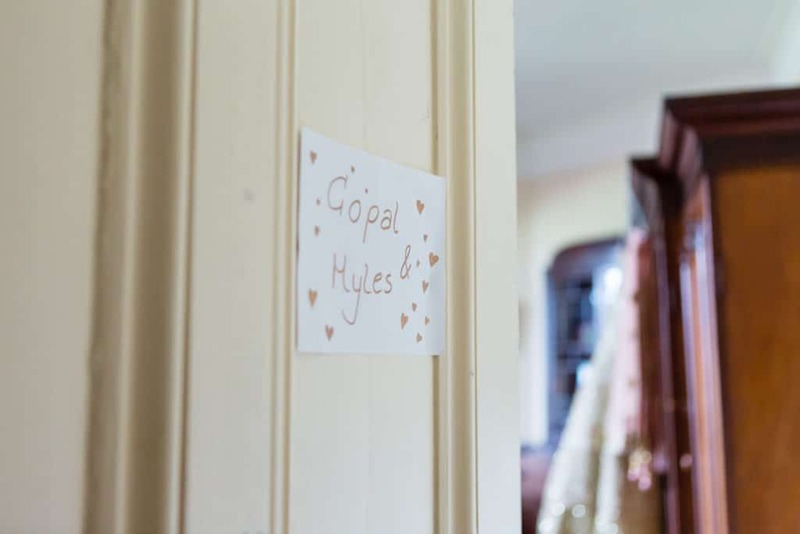 Copal & Myles had guests coming from all over the world. 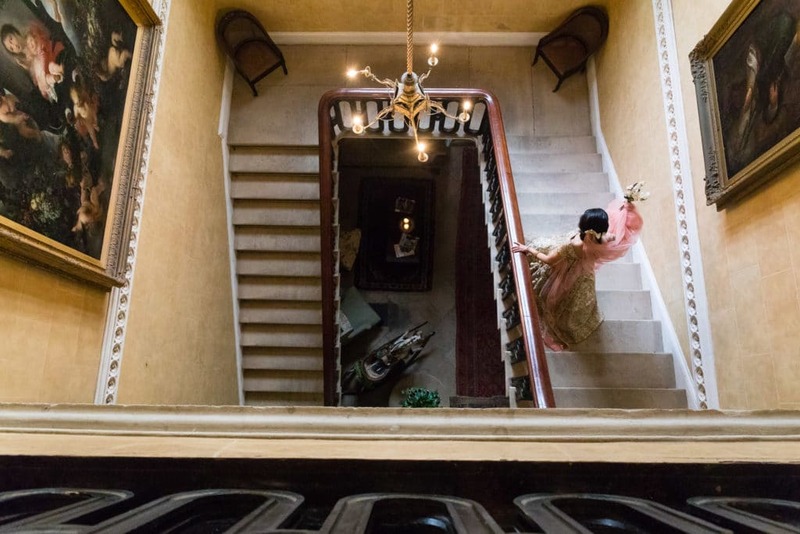 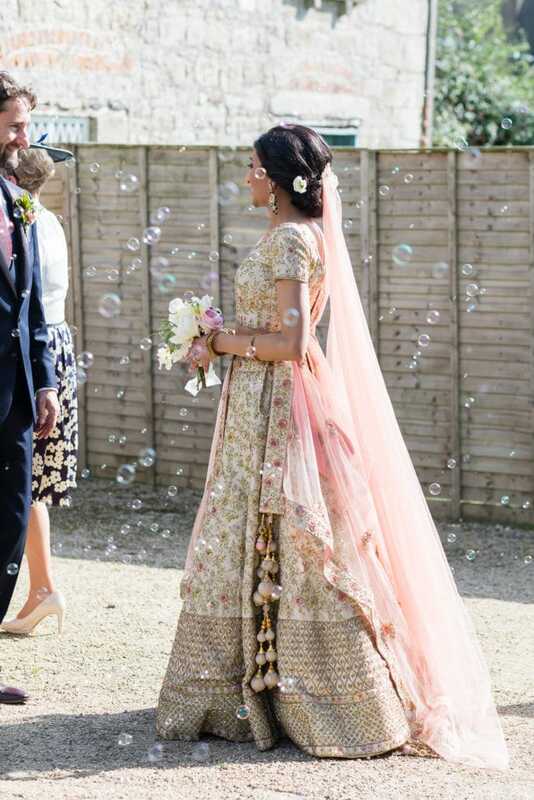 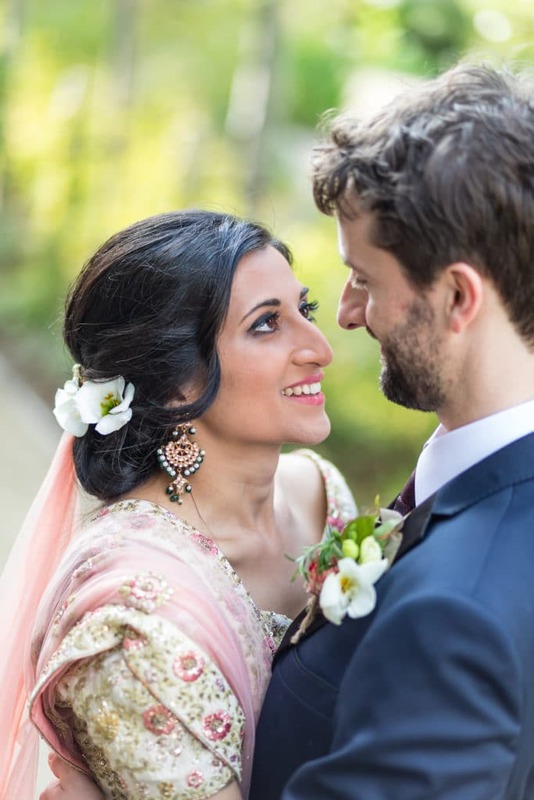 They wanted to create a unique wedding which would bring together their different cultures. 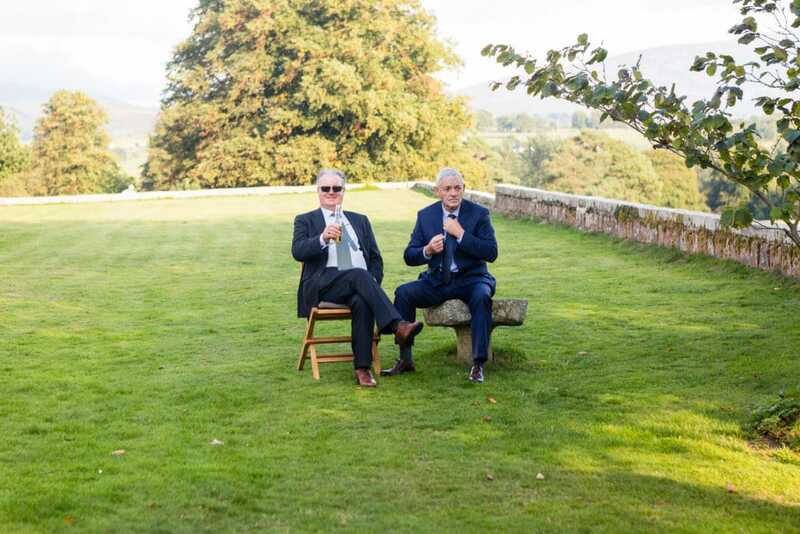 Enjoying the lead up as well as the day was very important to them. 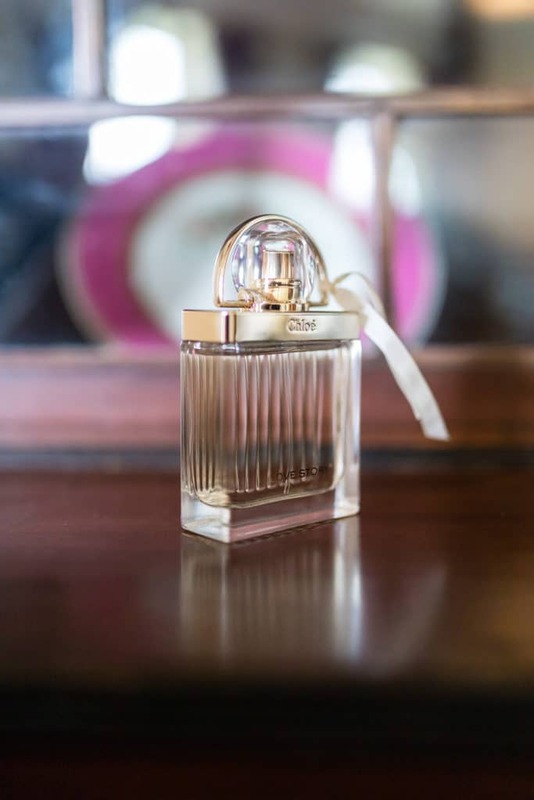 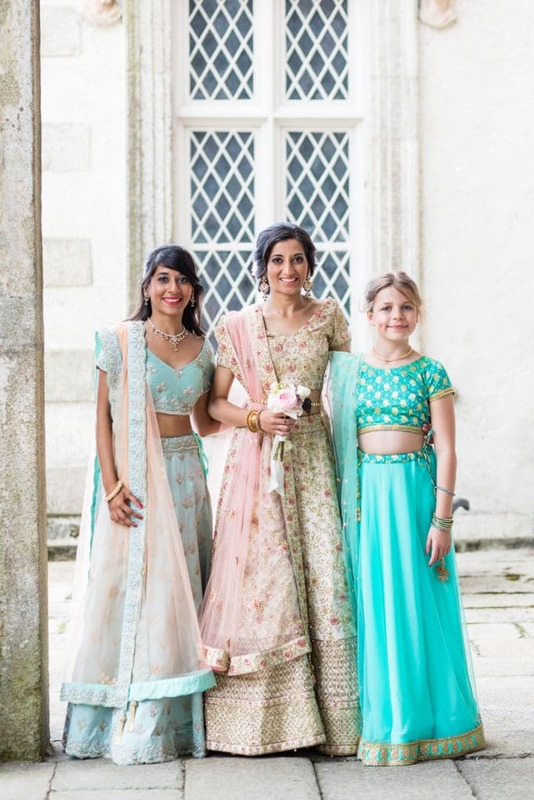 Copal says they didn’t really have a colour palette in mind! 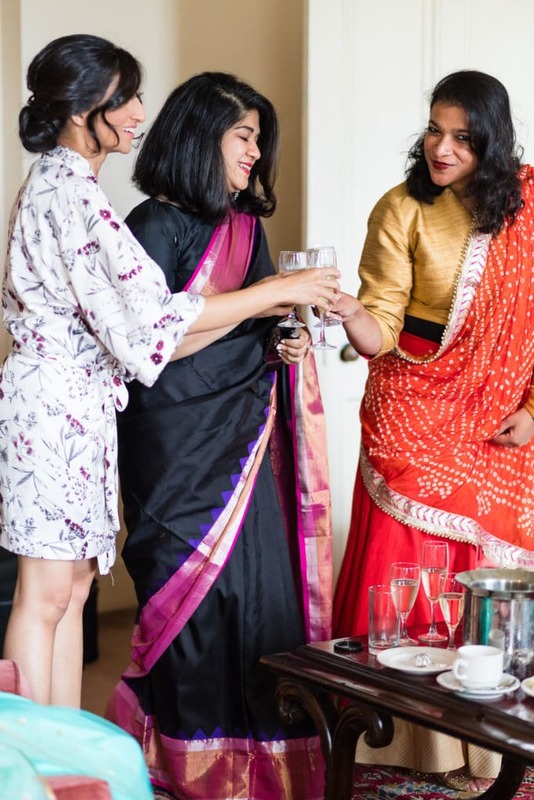 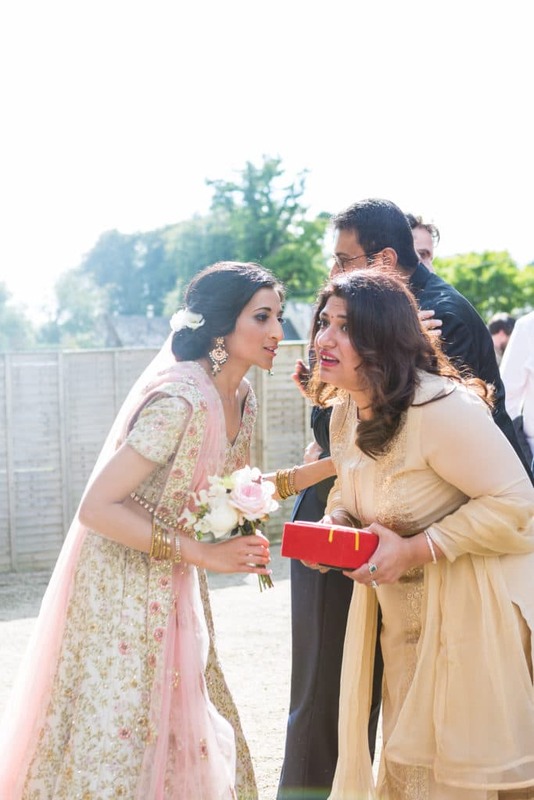 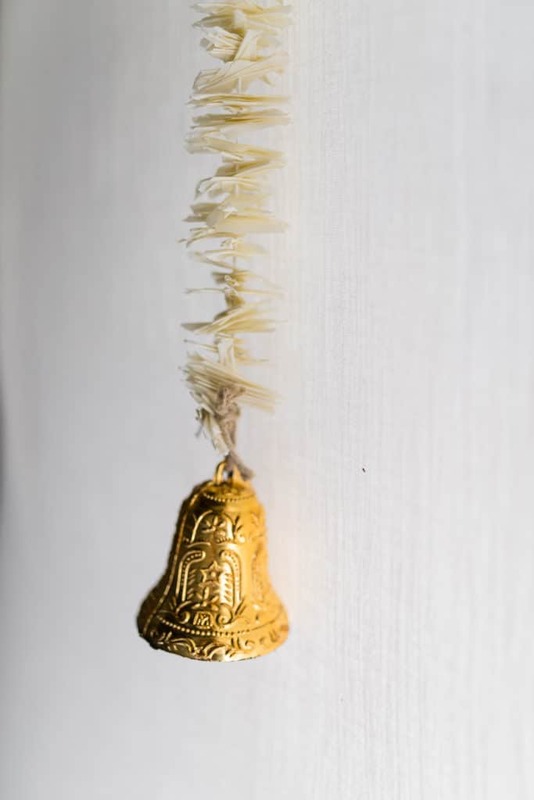 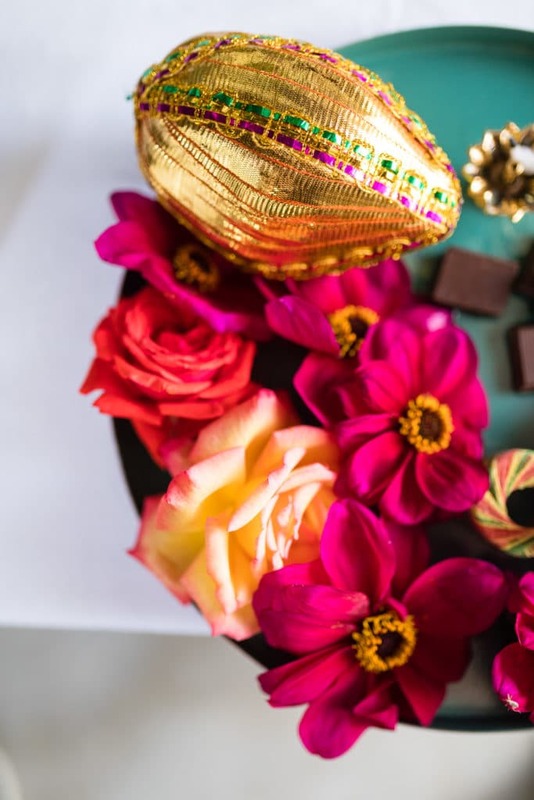 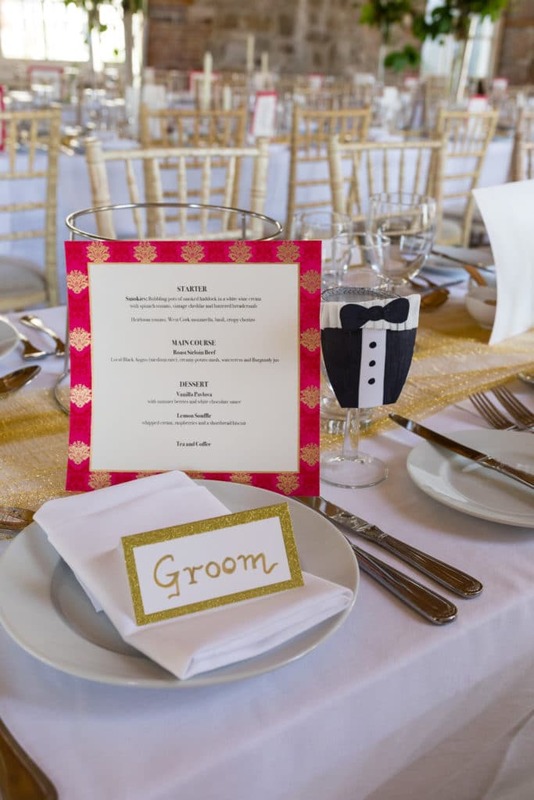 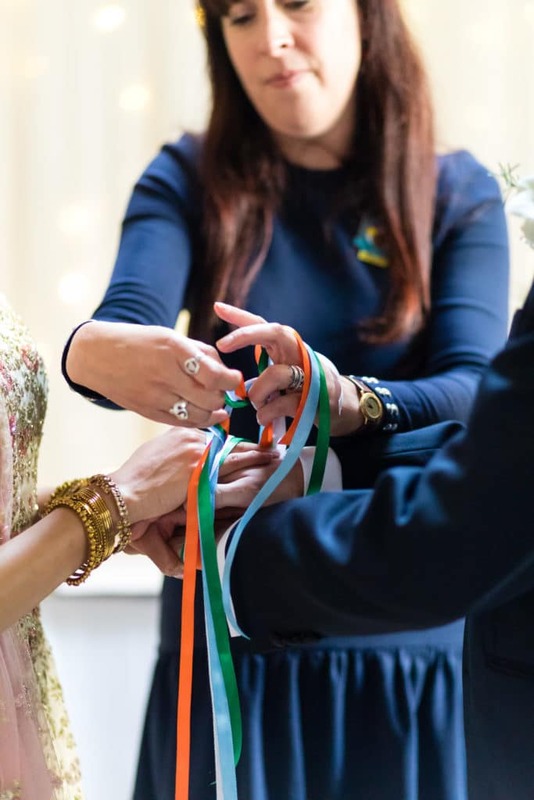 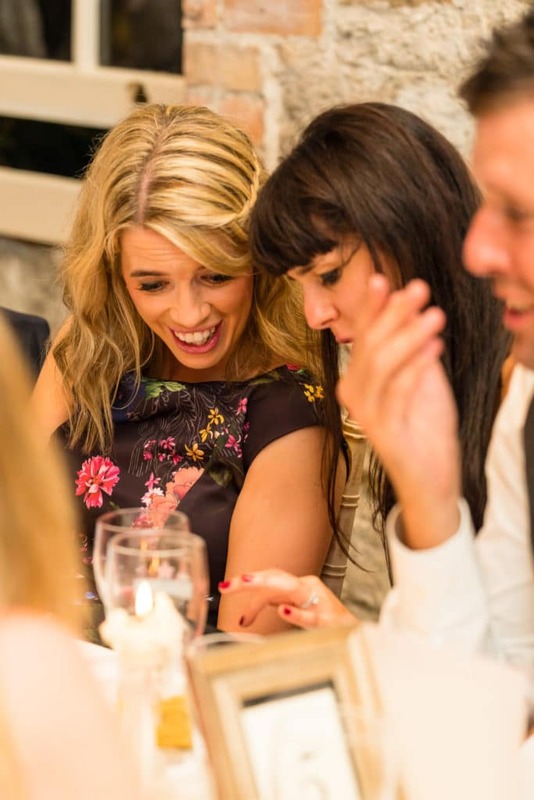 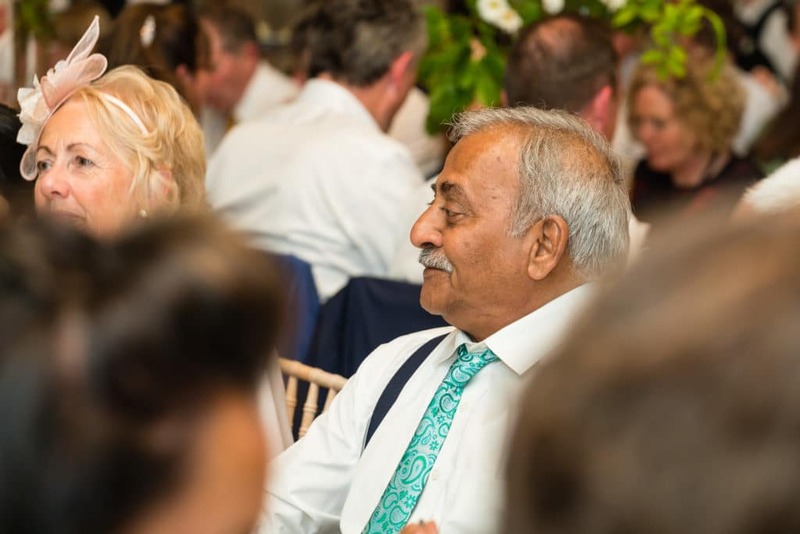 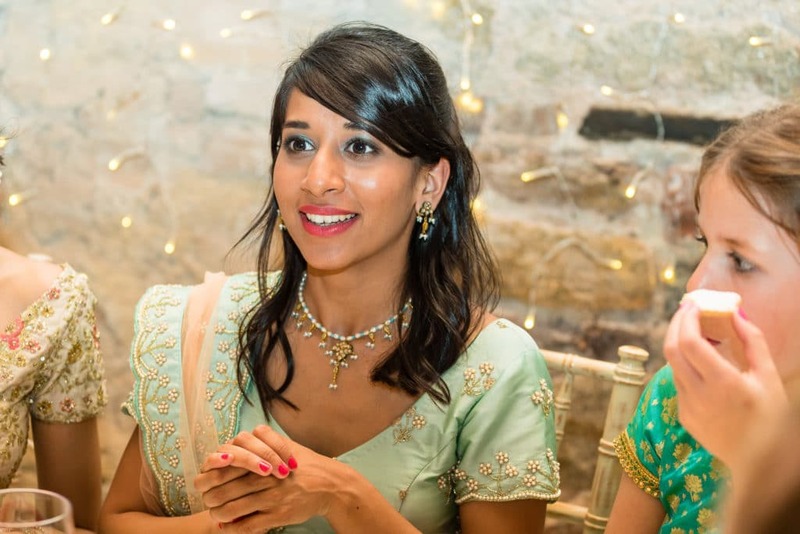 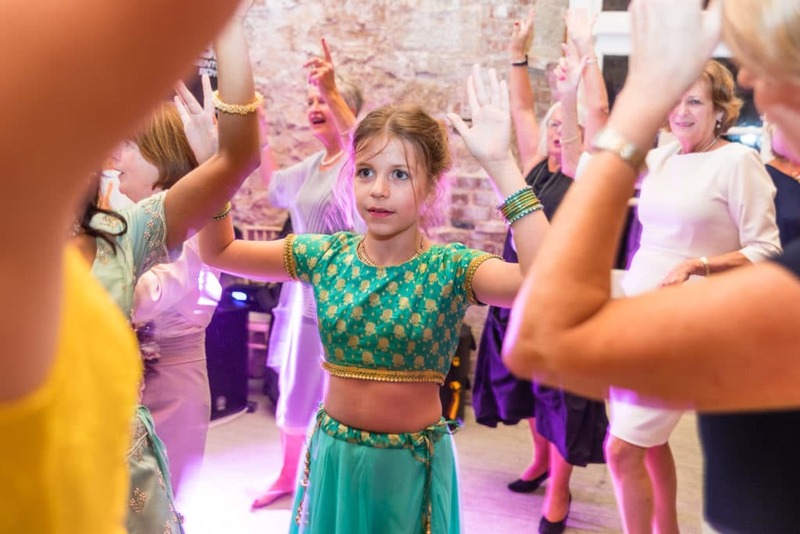 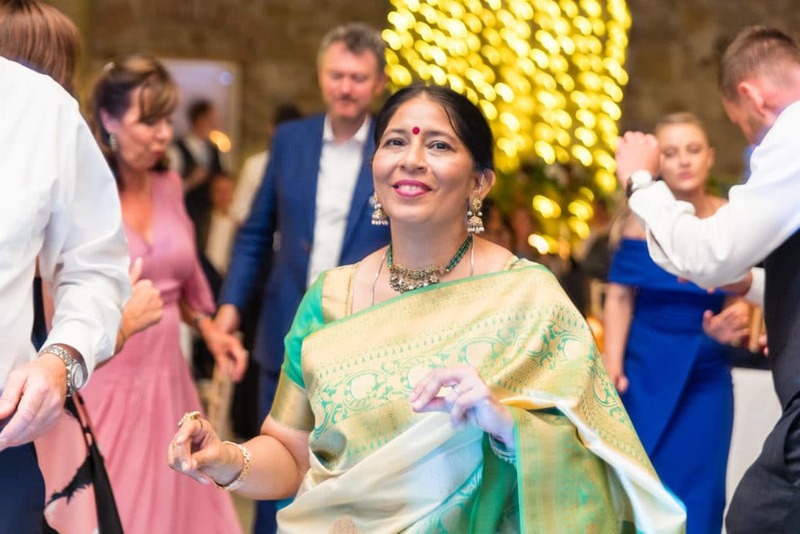 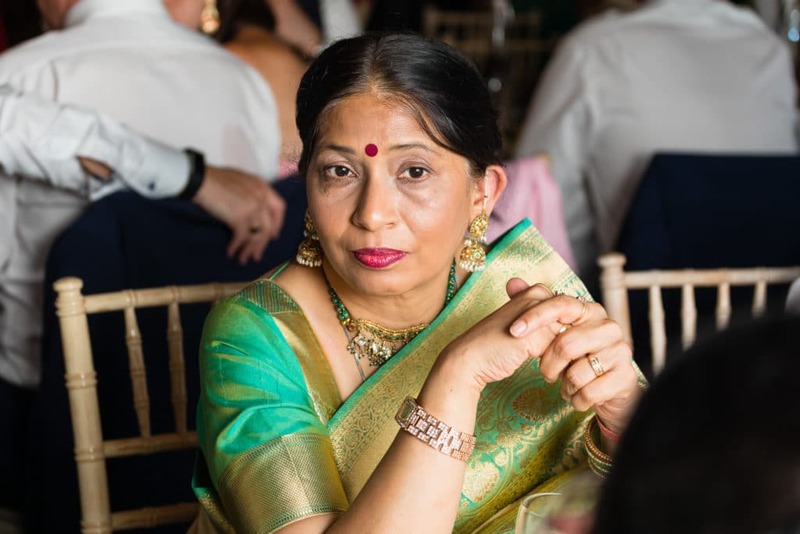 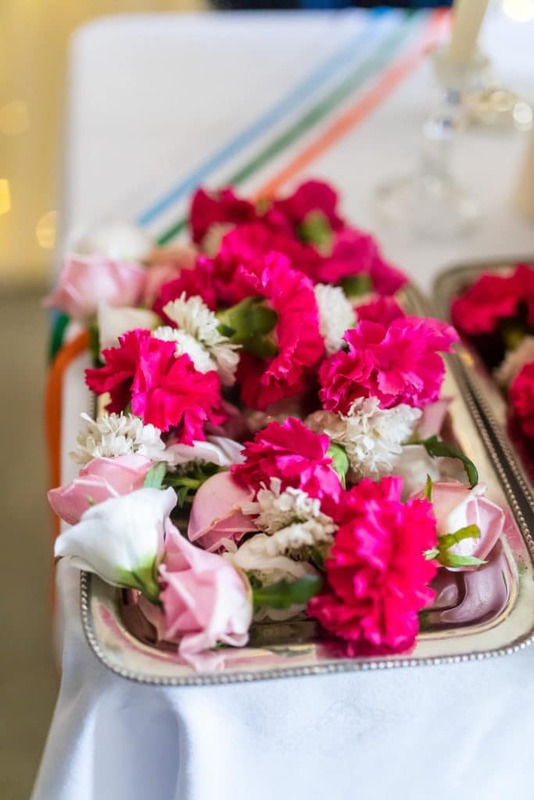 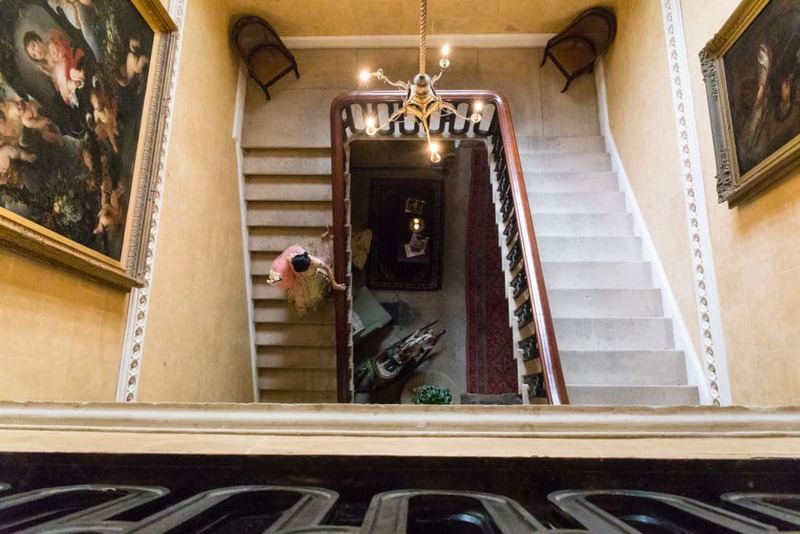 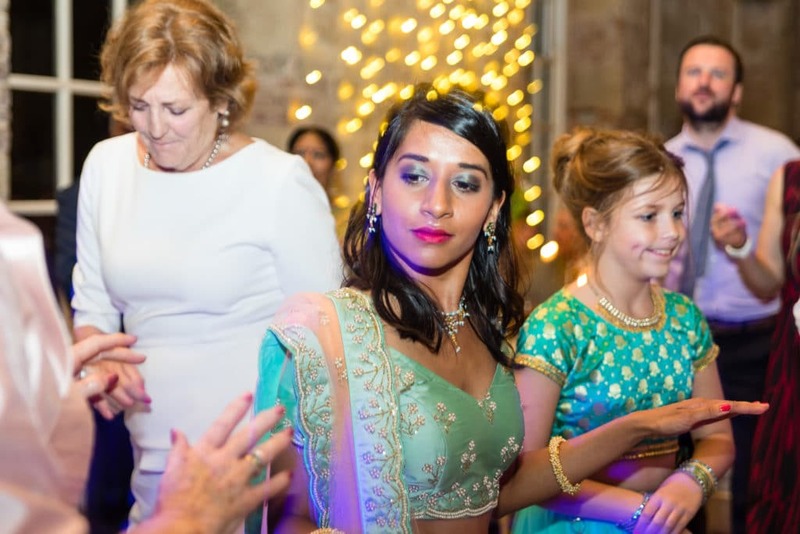 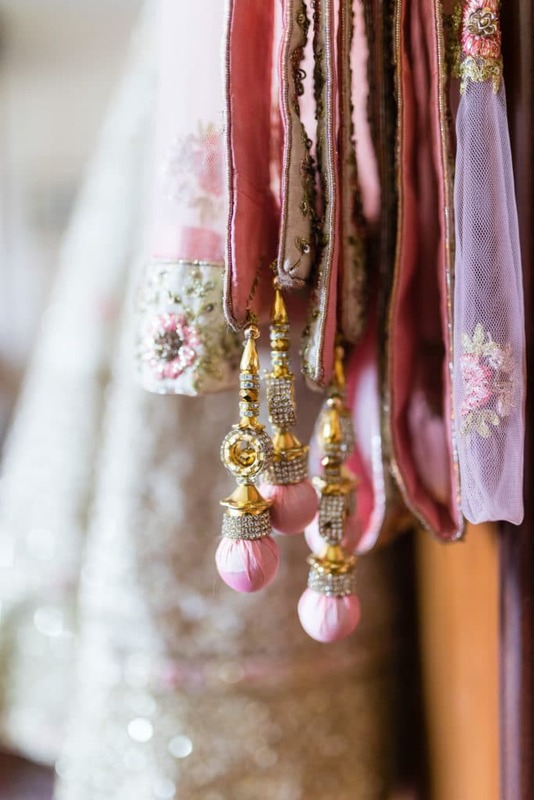 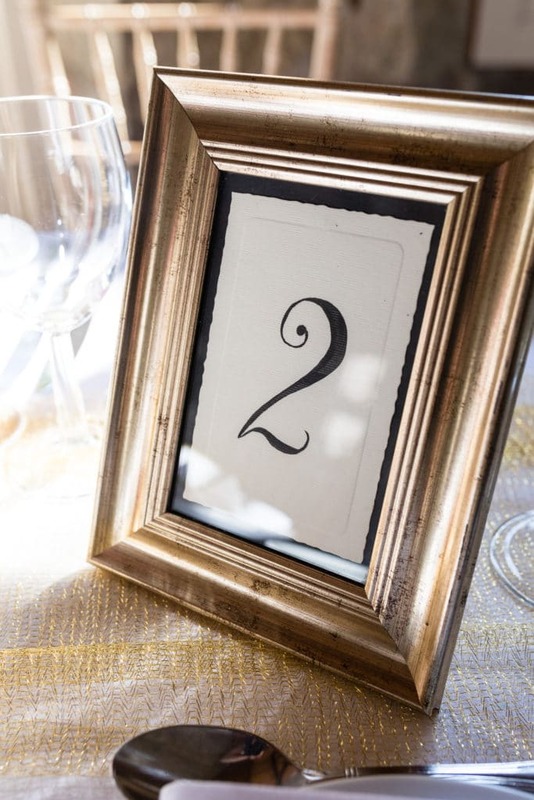 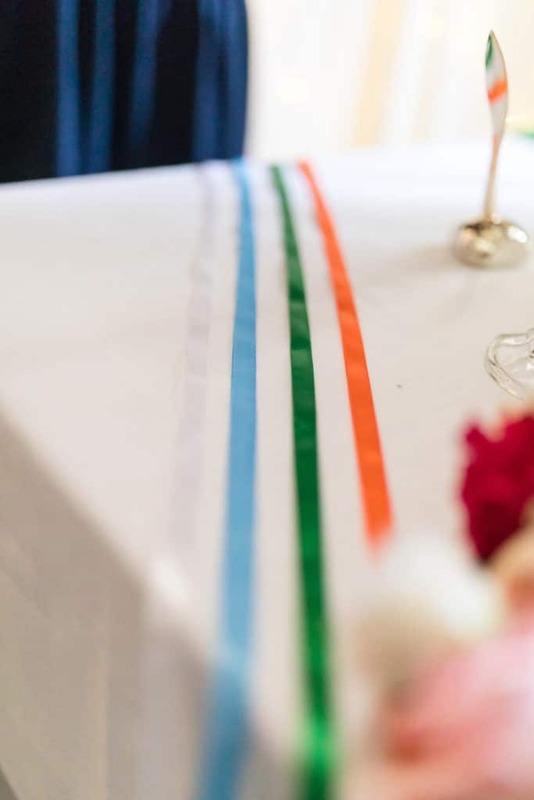 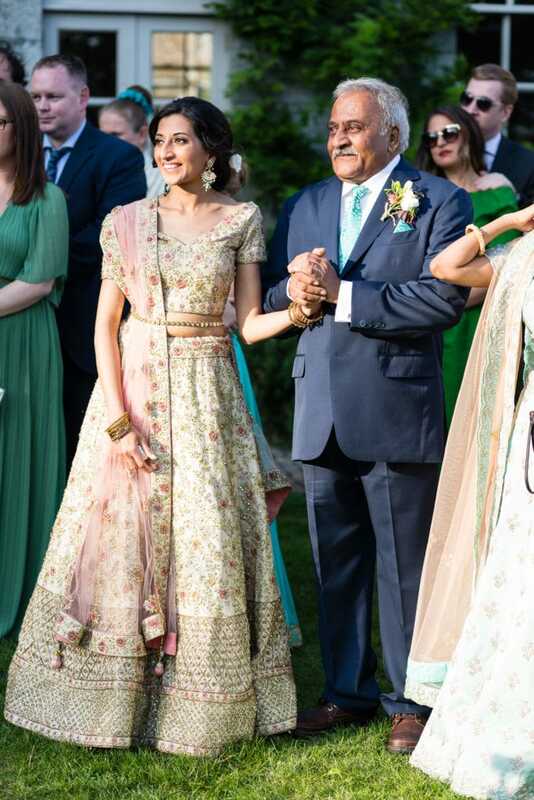 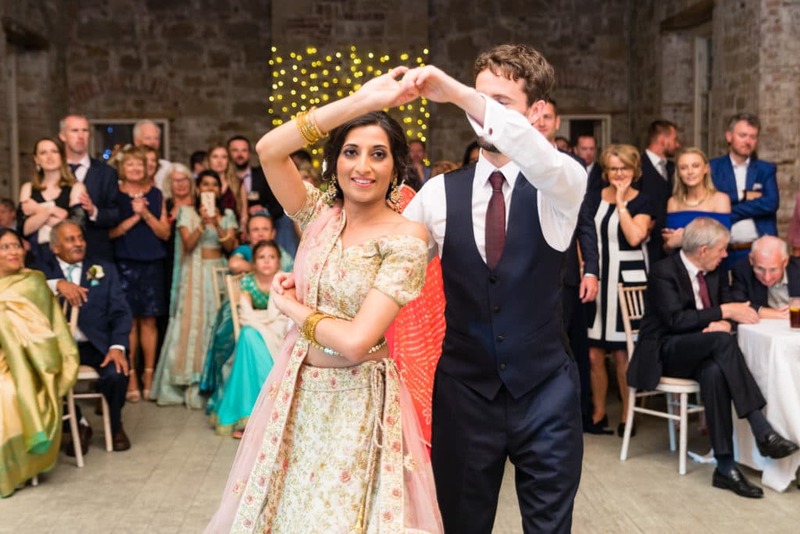 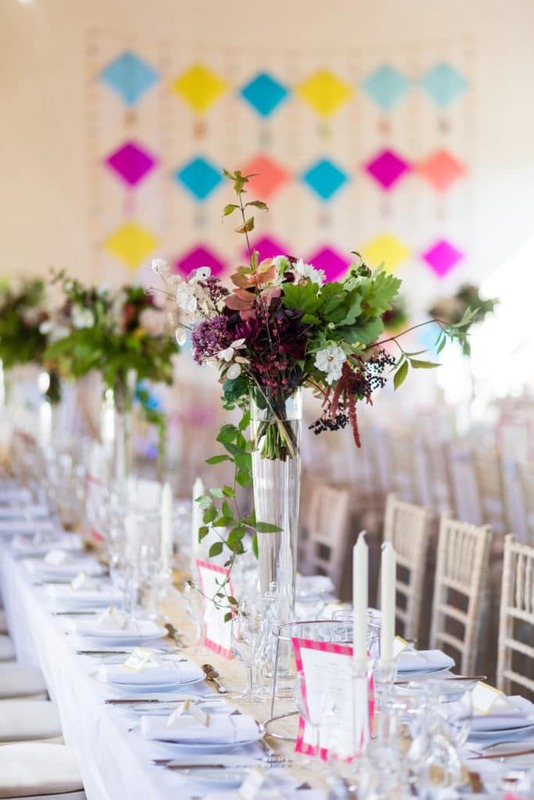 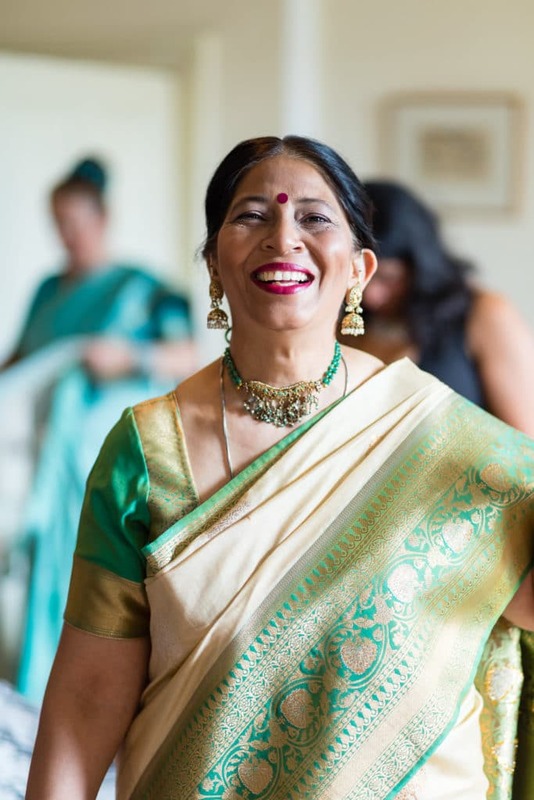 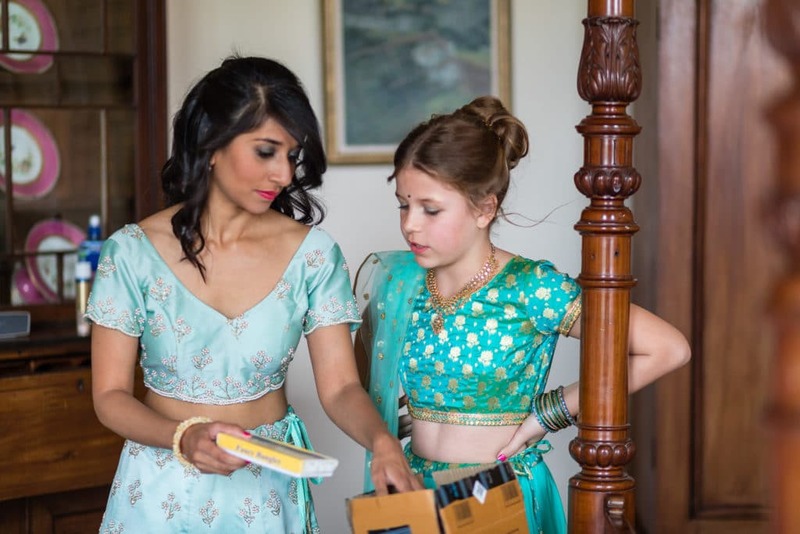 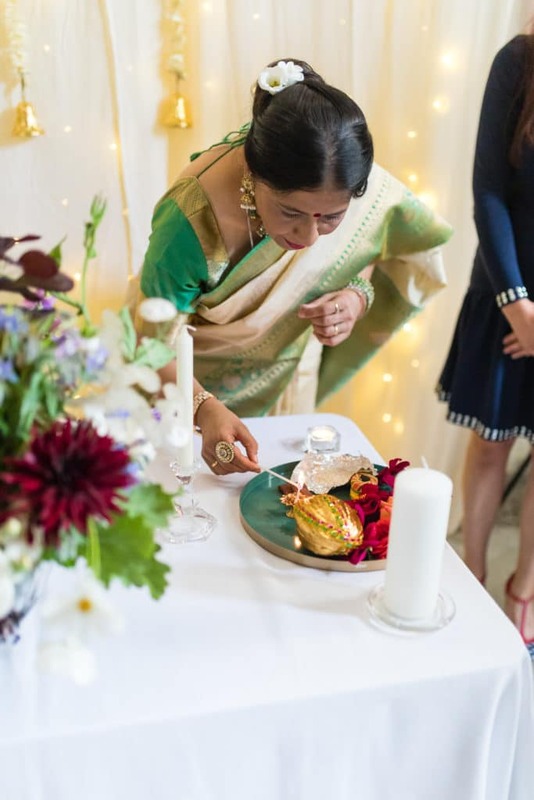 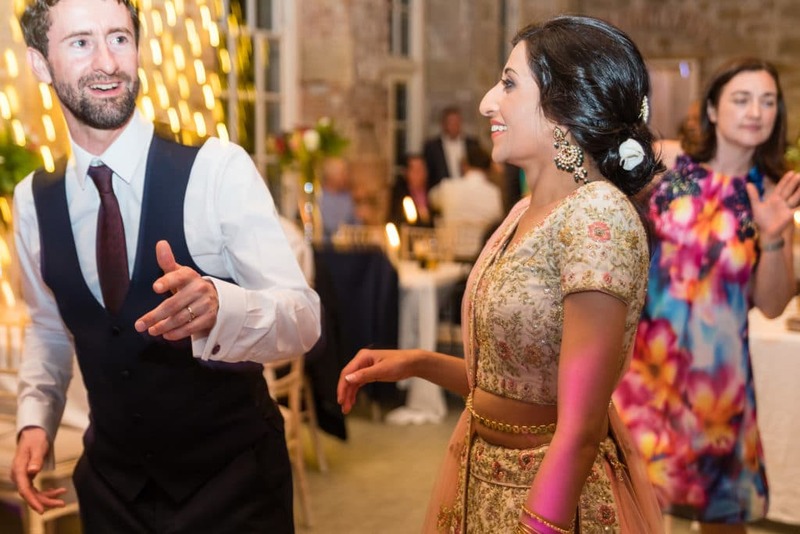 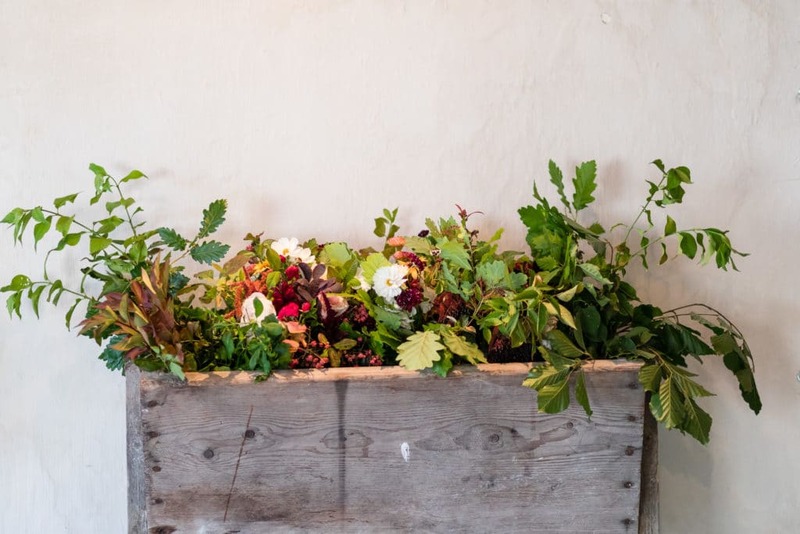 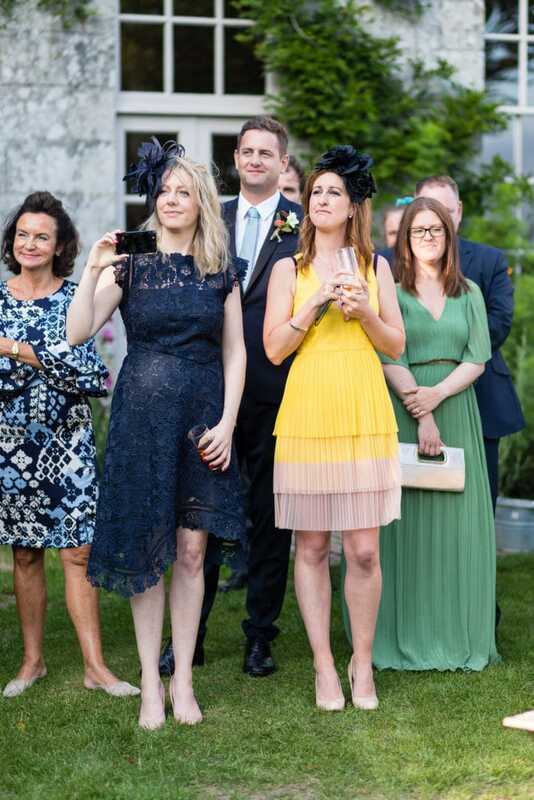 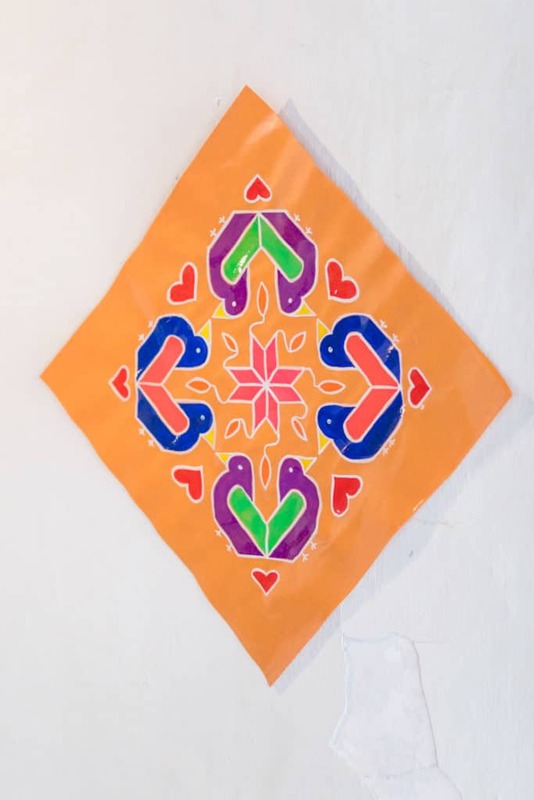 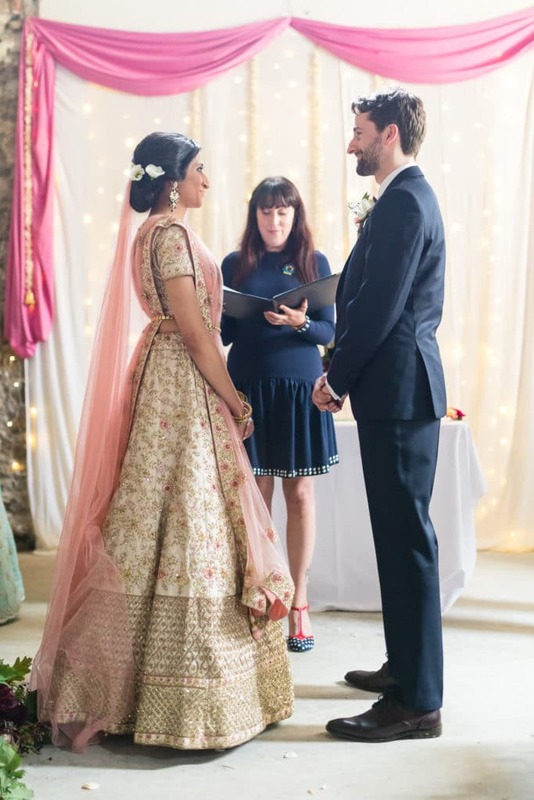 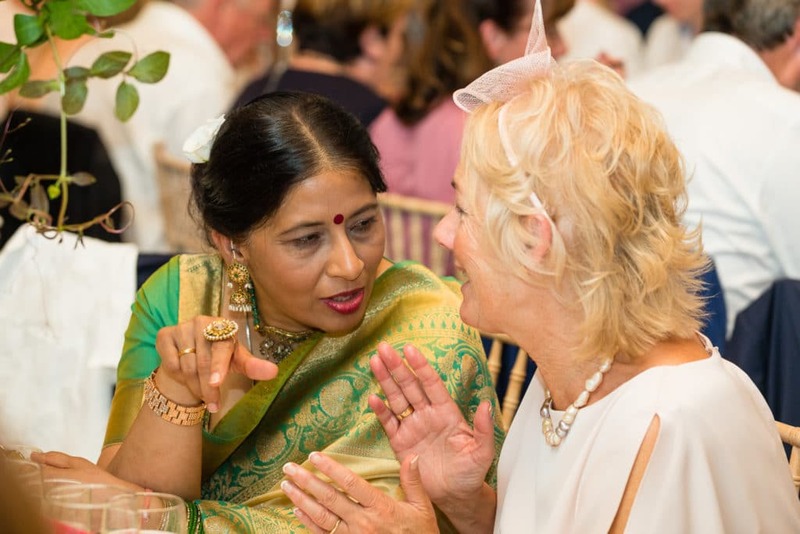 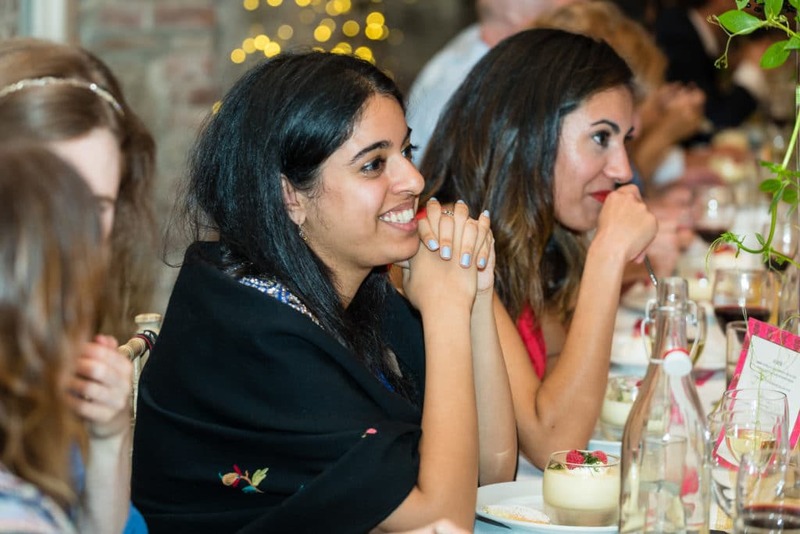 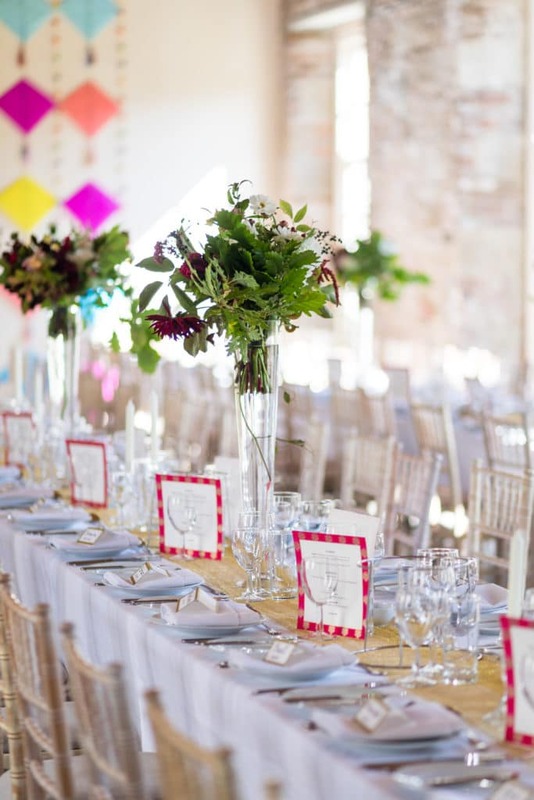 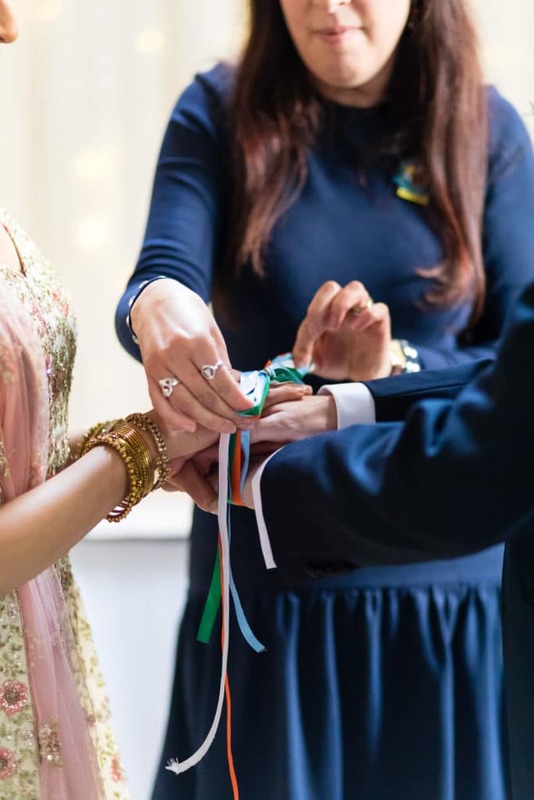 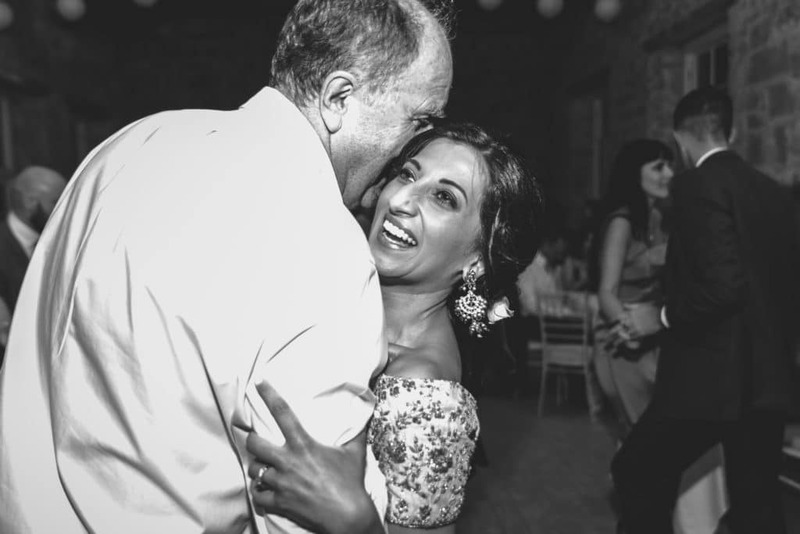 It developed as they went along – “I like to call our style ‘Elegantly Eclectic’!” Their invites and menu cards were sourced in India and were fuschia pink, orange and gold- they carried that theme into the decor but also introduced some blues, greens and yellows (in the kite wall). 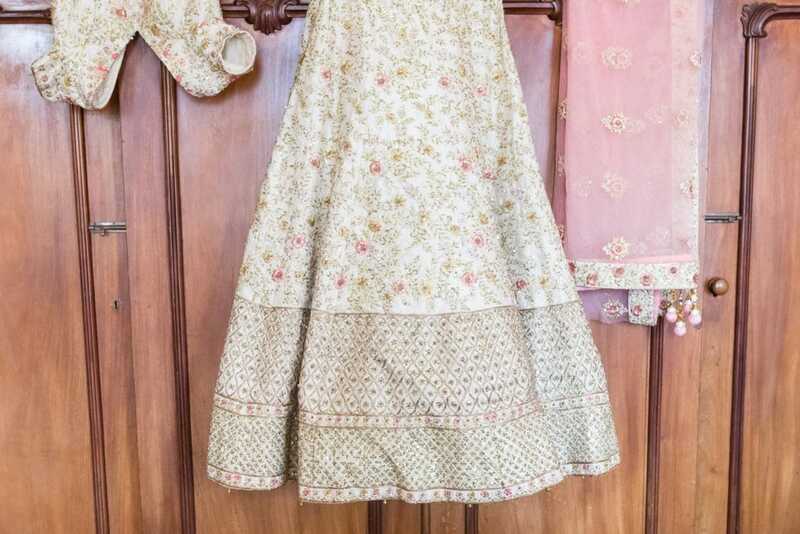 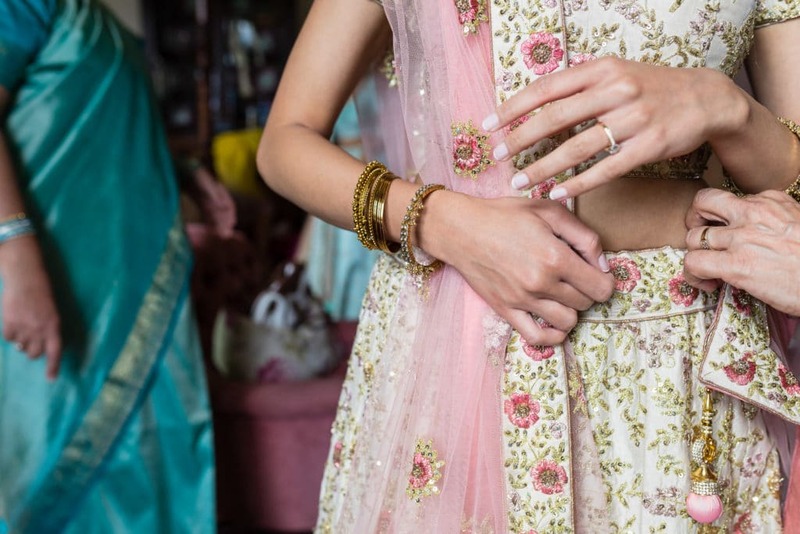 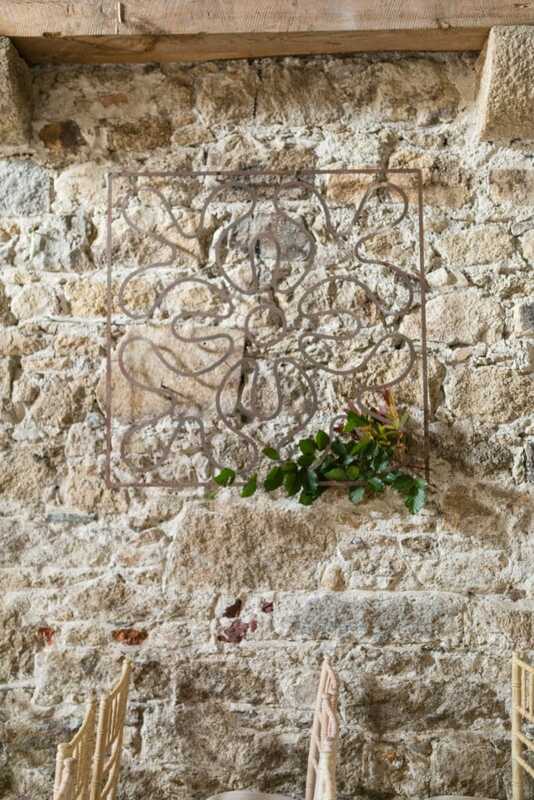 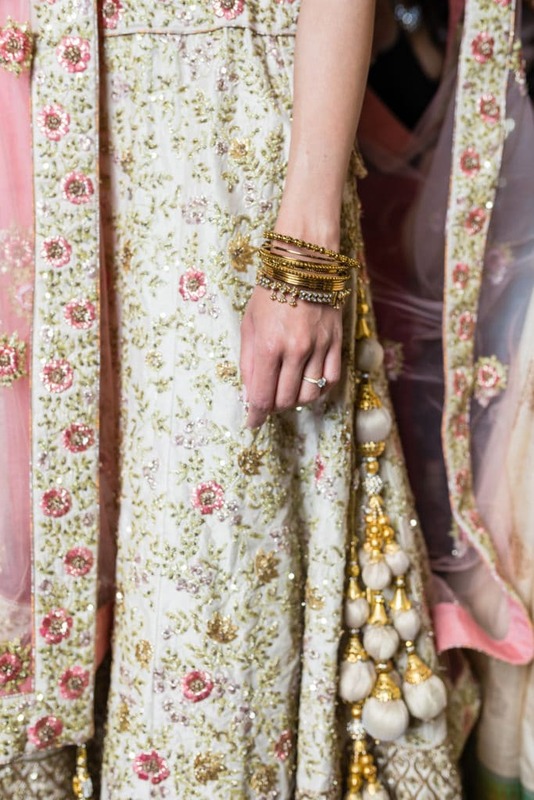 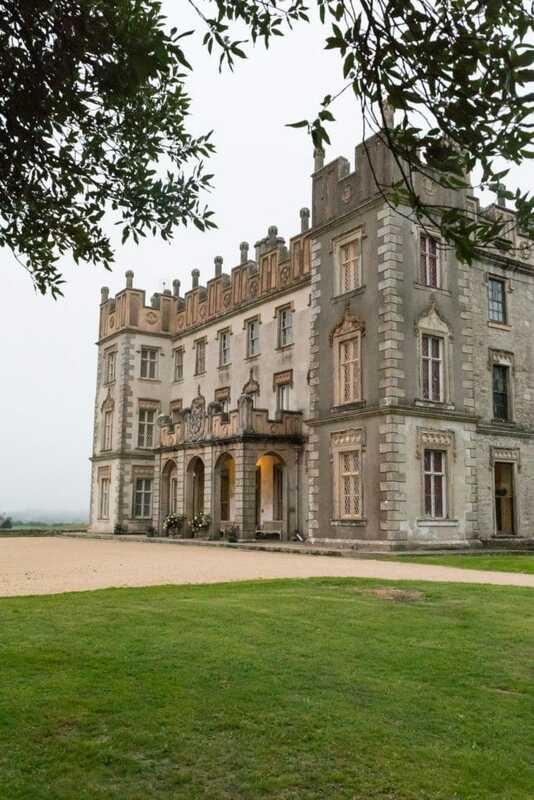 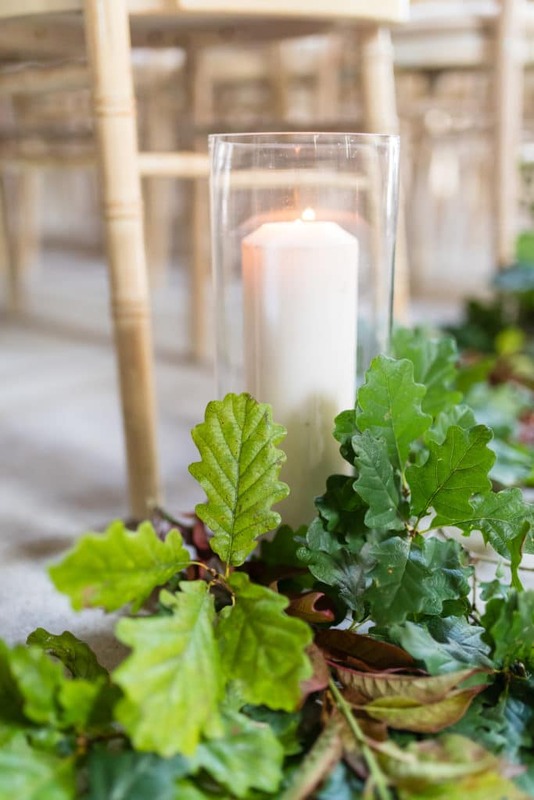 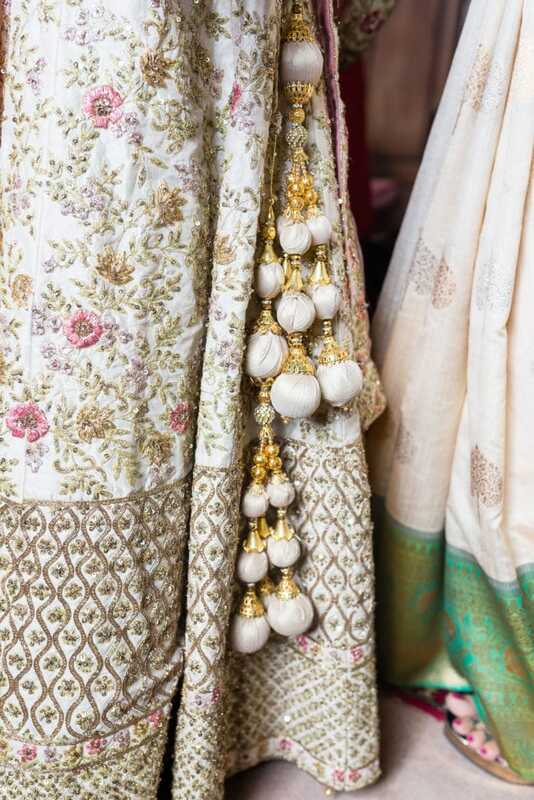 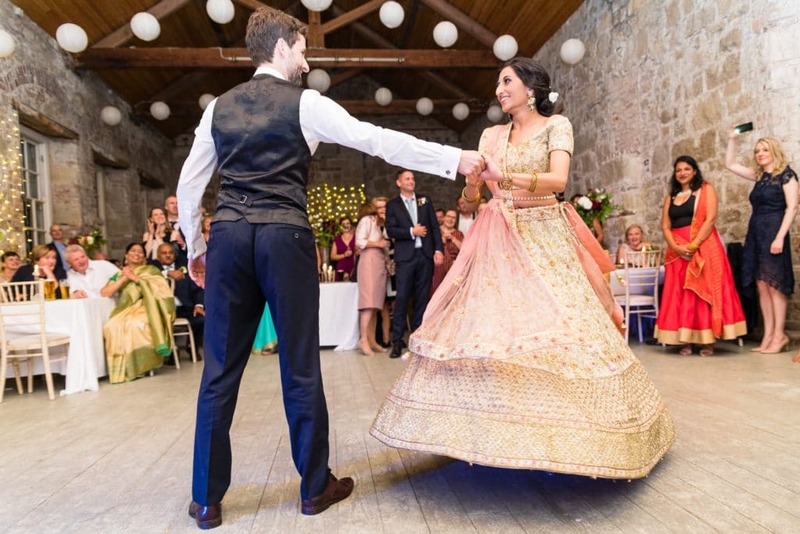 They knew they wanted to have a fusion of elements from both Indian and Irish cultures. 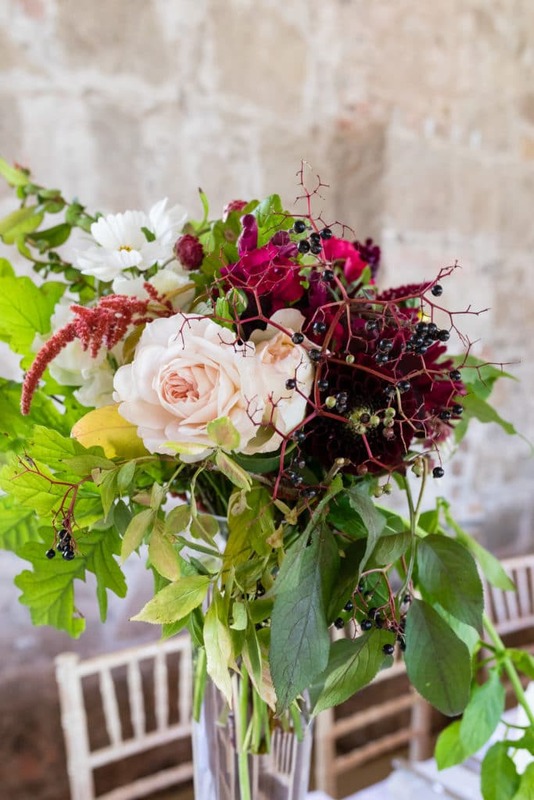 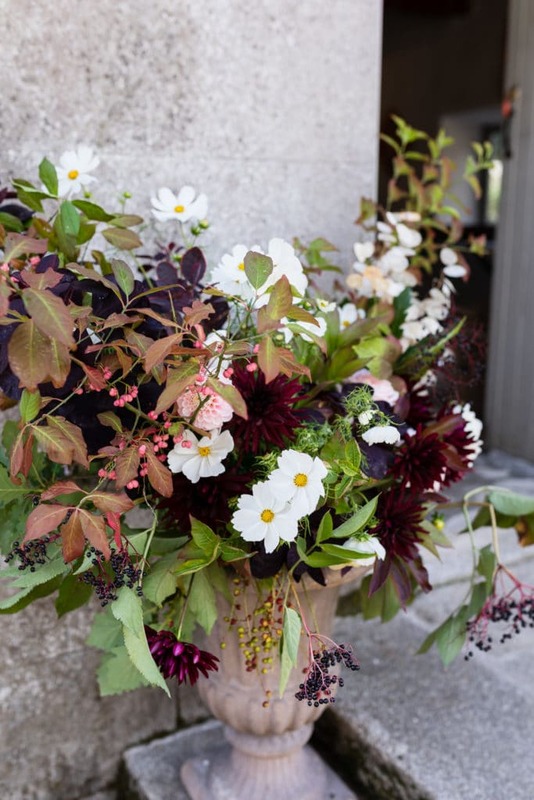 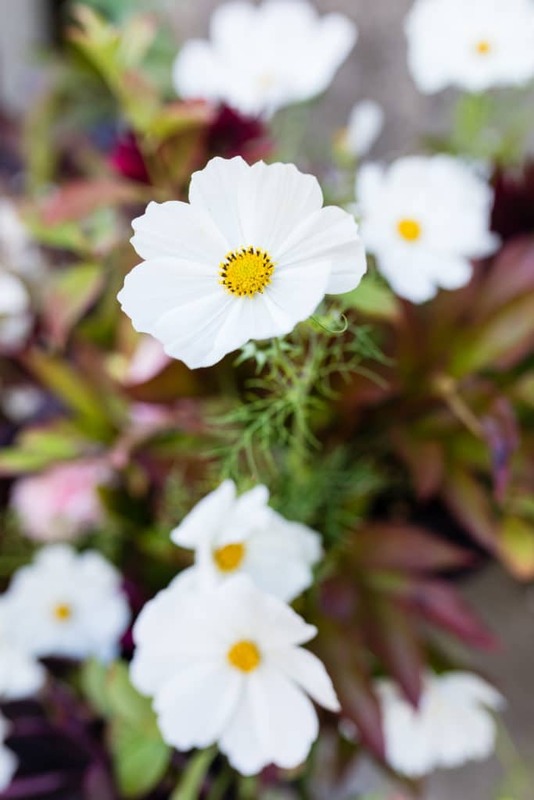 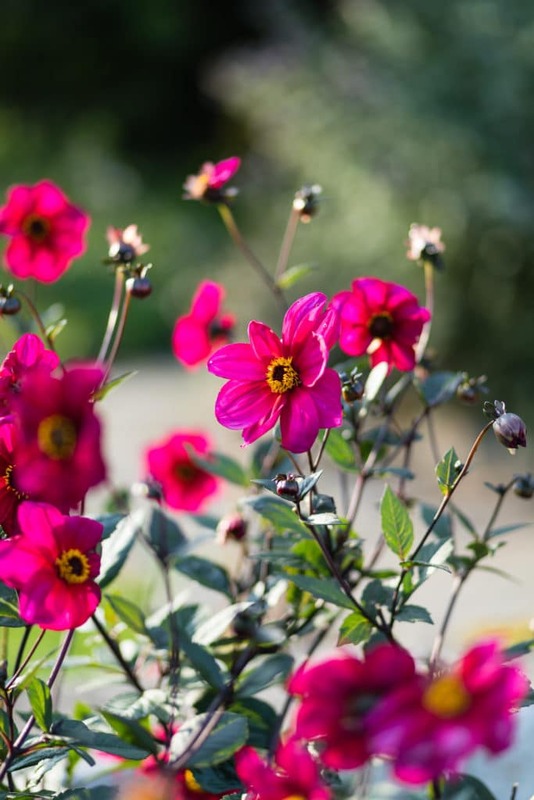 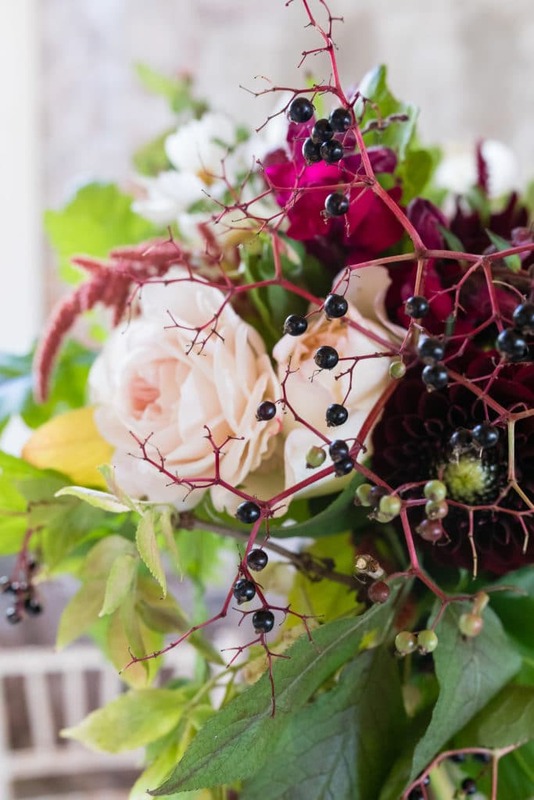 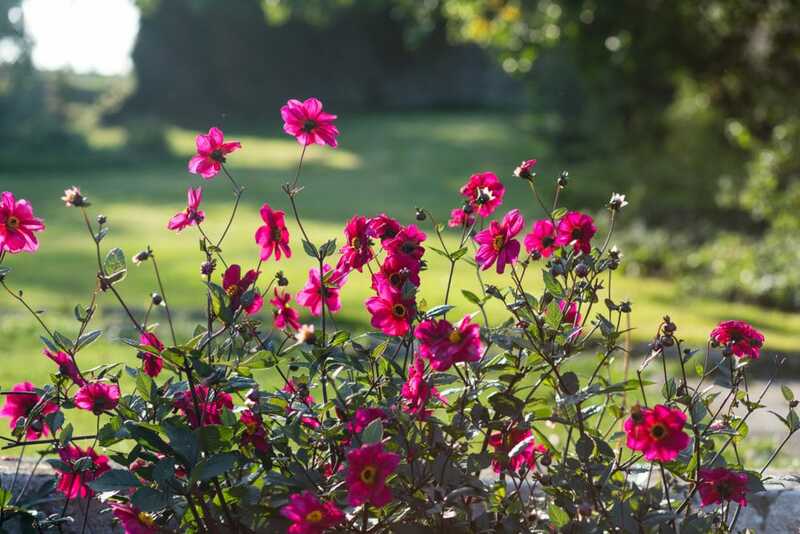 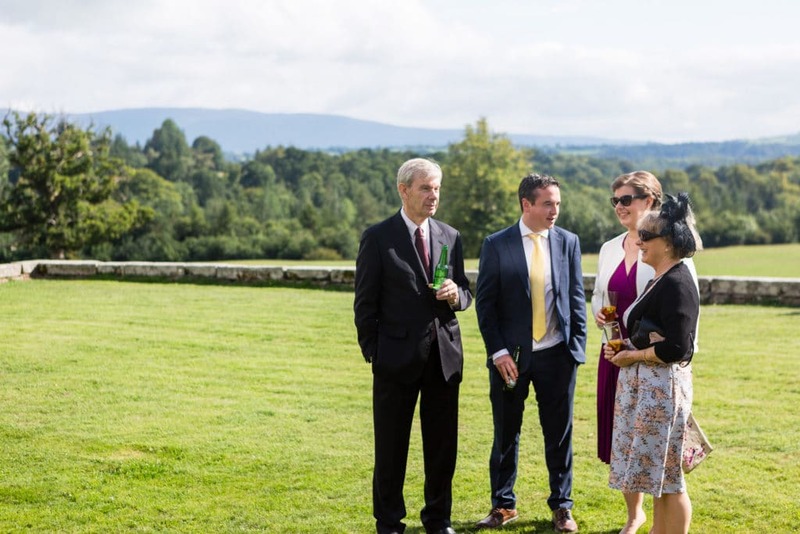 So, the flowers were in Irish Autumnal shades. 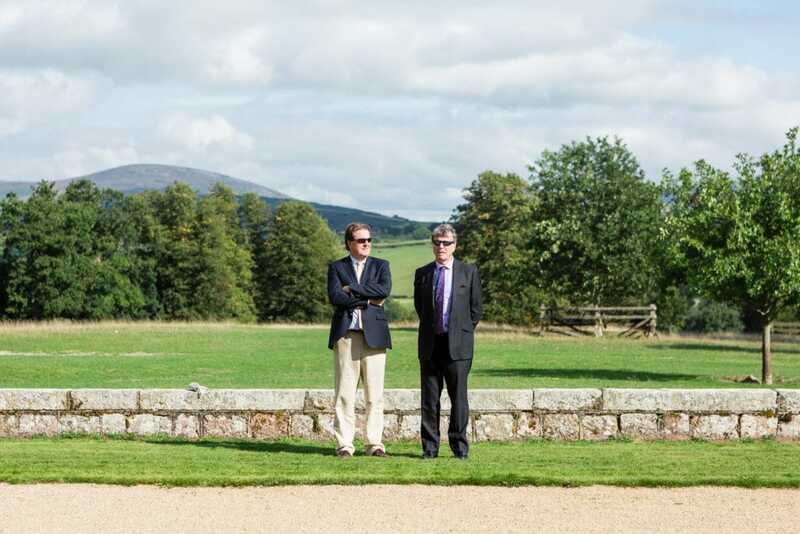 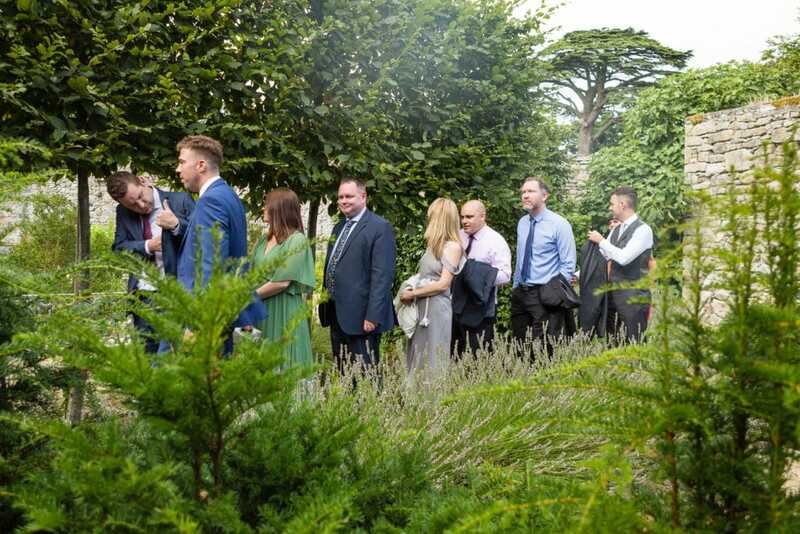 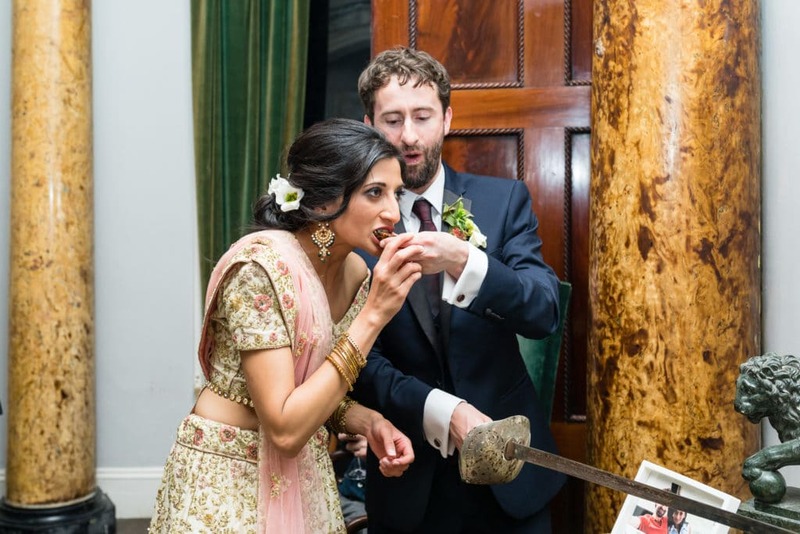 For the food- they had Indian Canapés at the drinks reception, followed by a nice hearty Irish dinner. 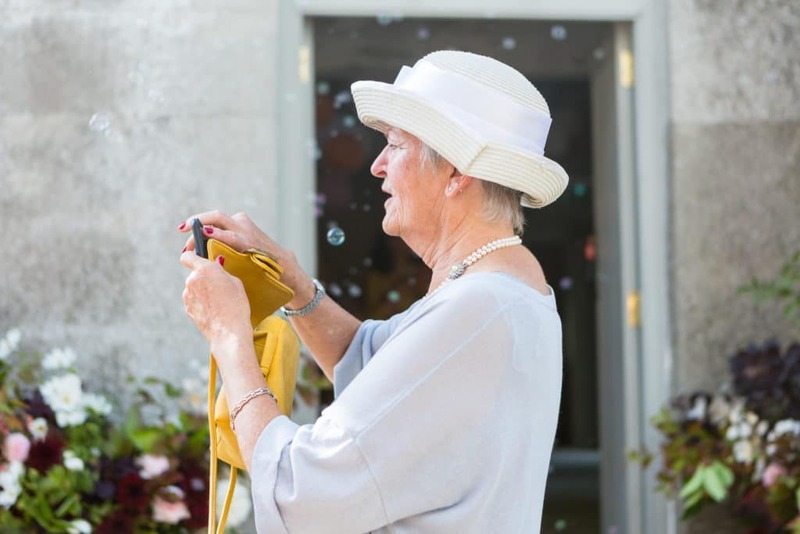 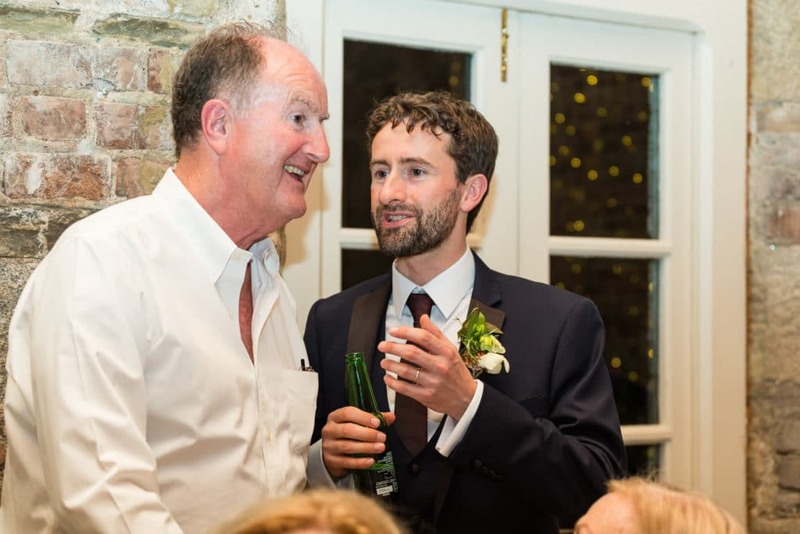 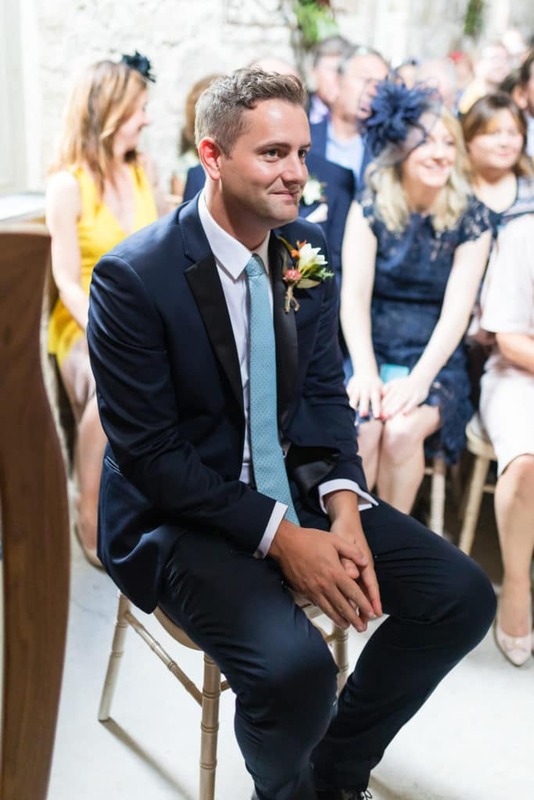 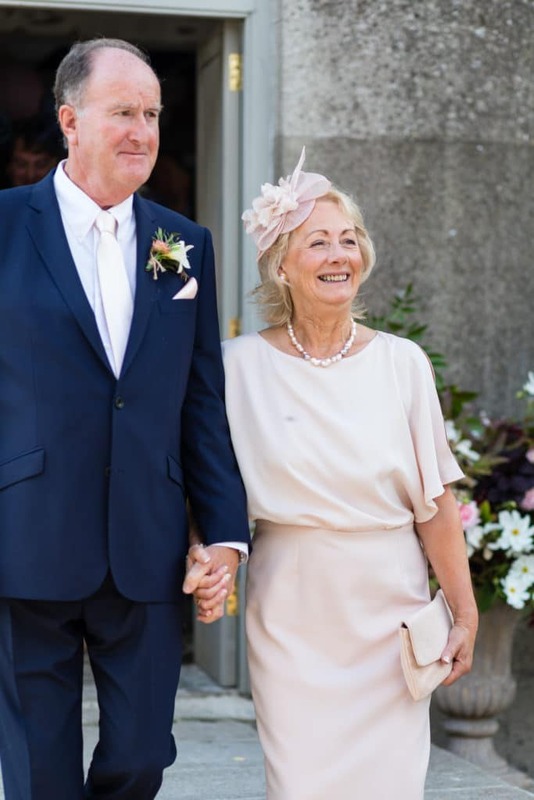 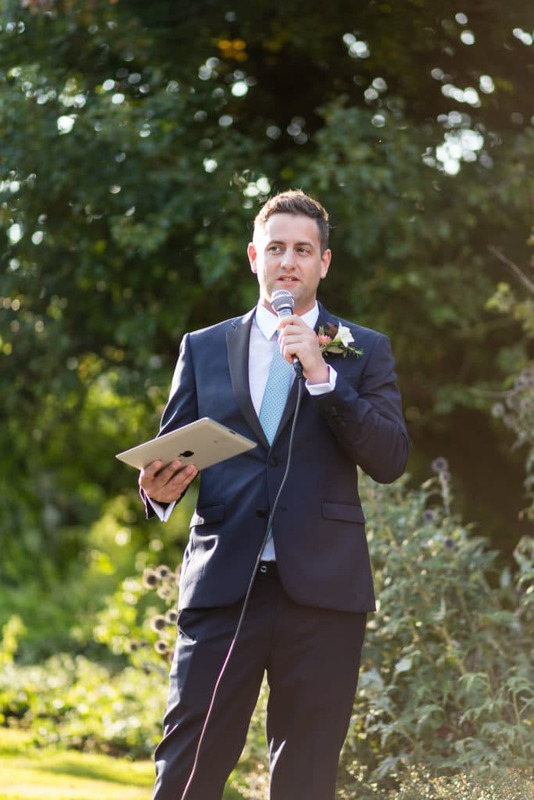 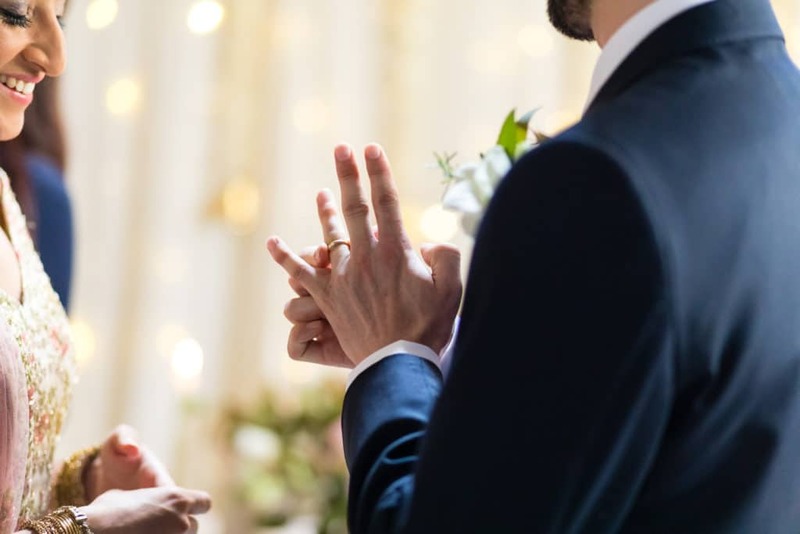 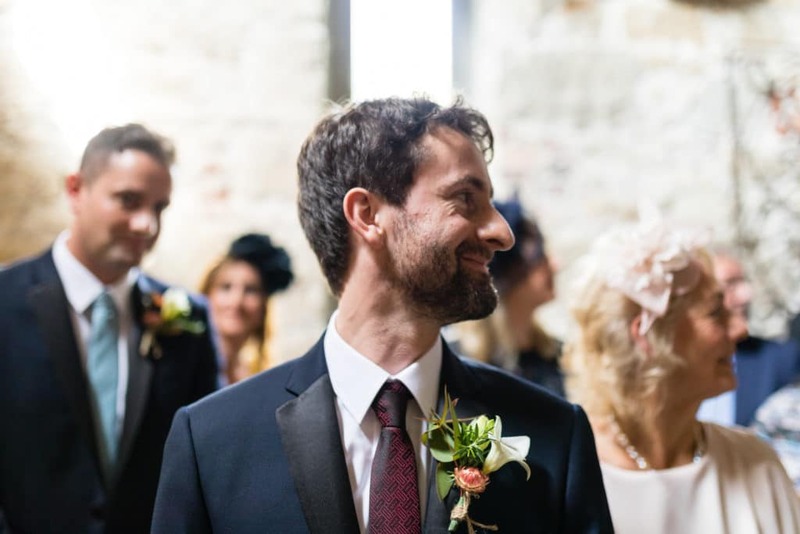 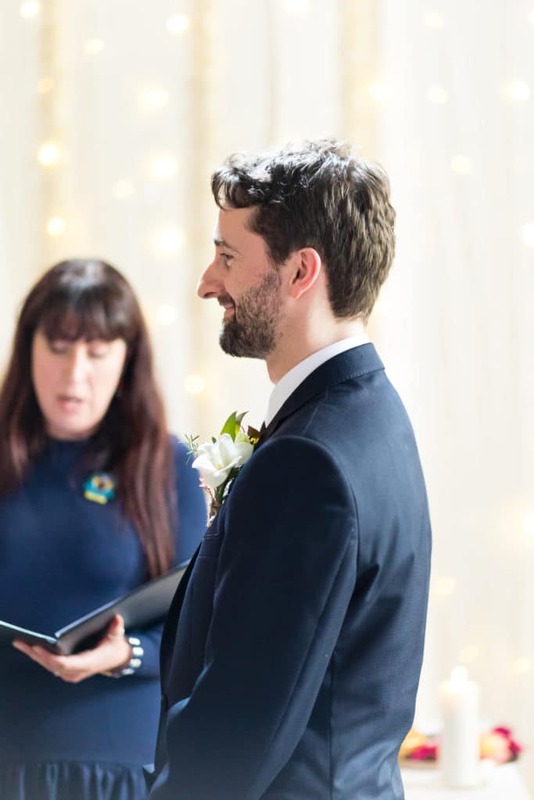 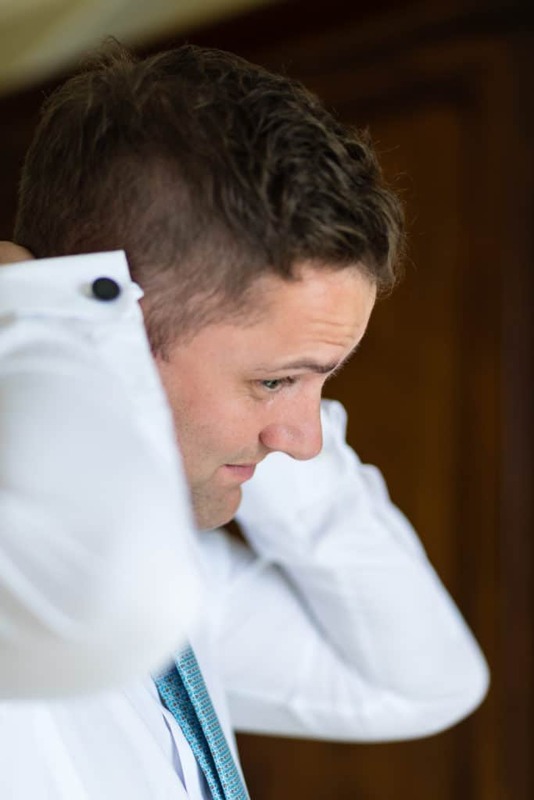 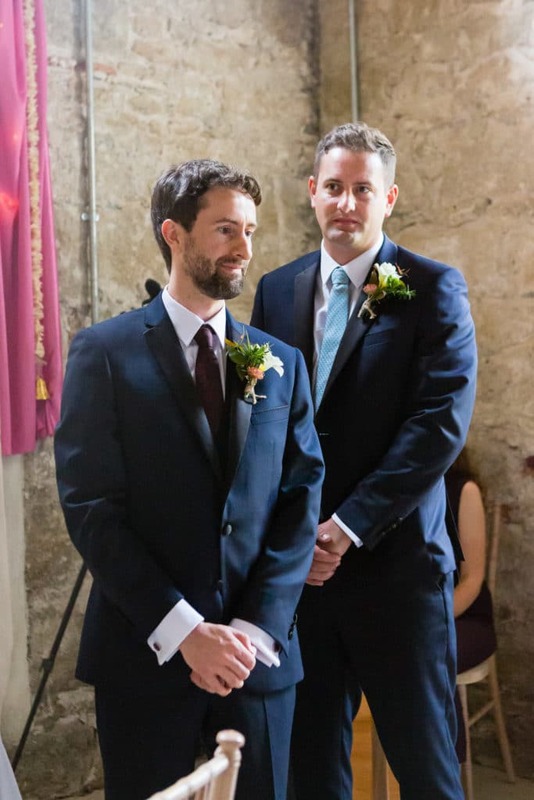 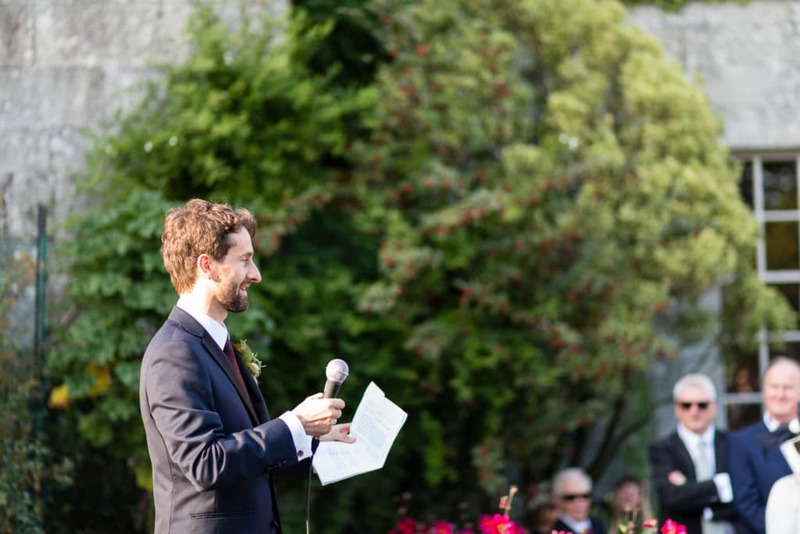 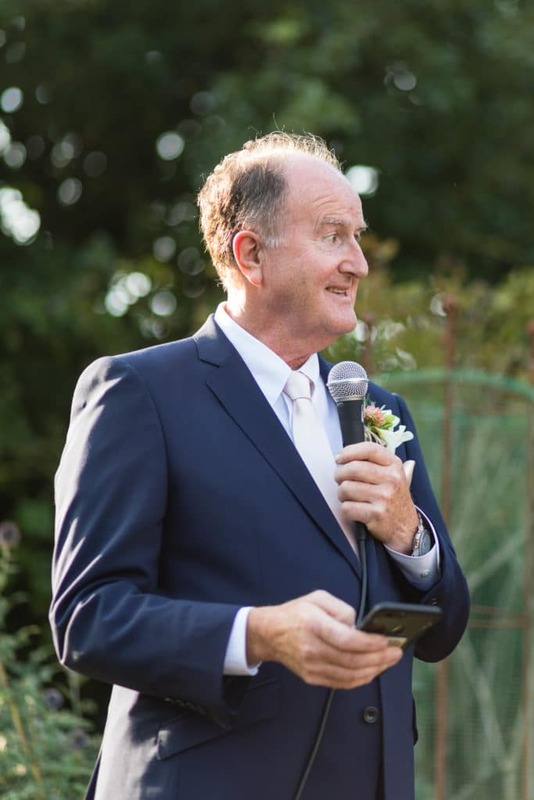 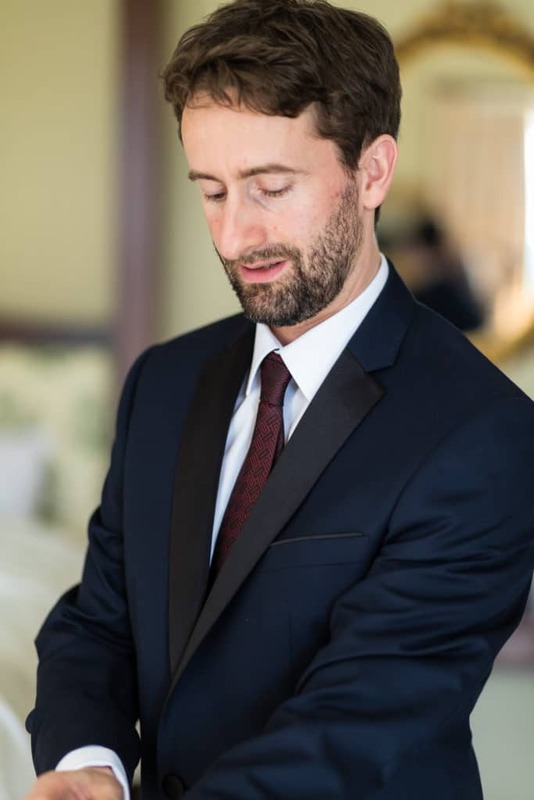 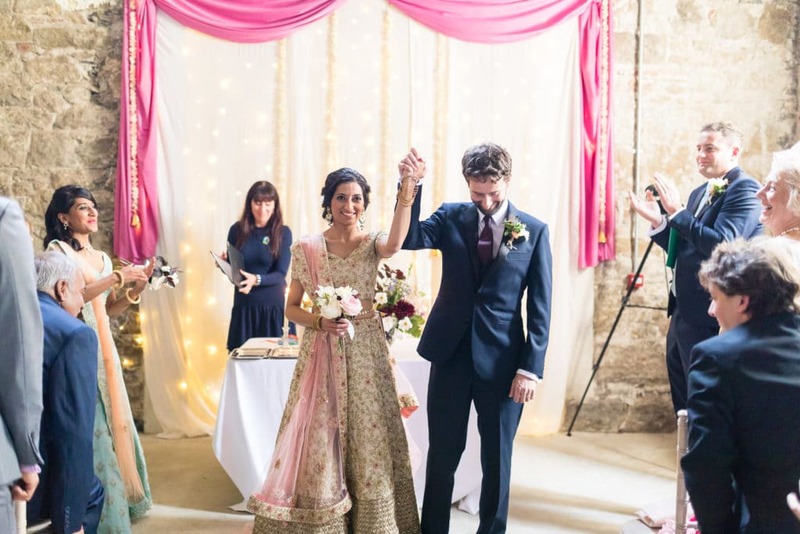 They both agree that their favourite part was the ceremony, which was unique and specially written for them by their celebrant Tara Carroll. 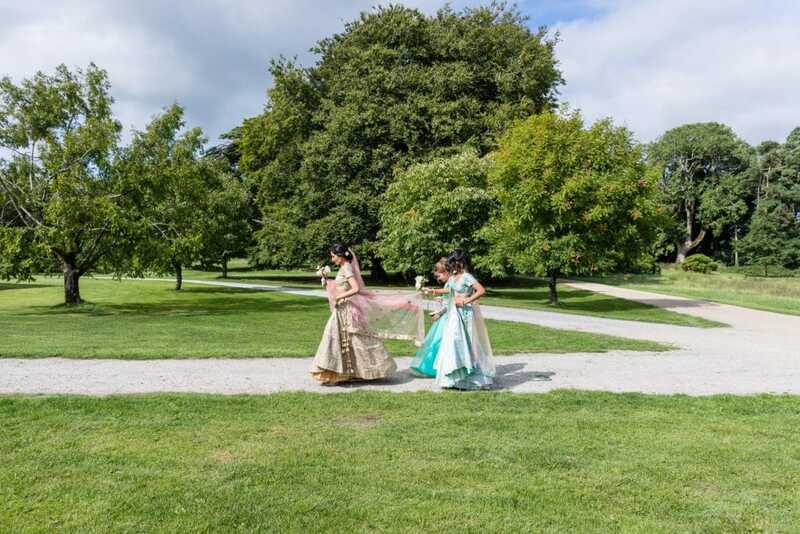 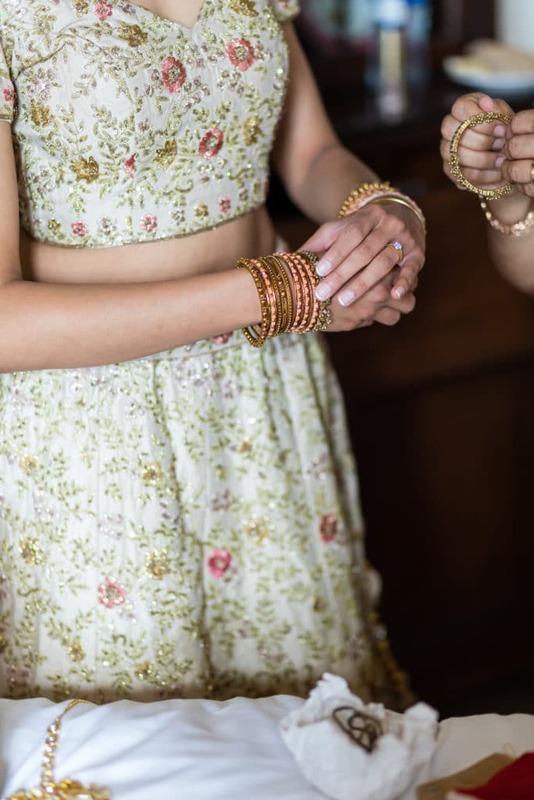 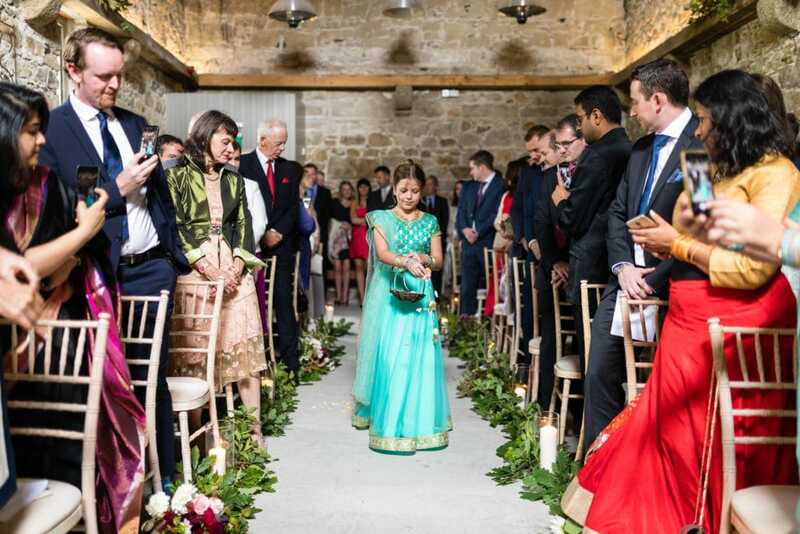 It was the perfect way to bring the two cultures together as it included 2 Celtic traditions of Unity candle and Hand binding and 2 Indian traditions of ‘Aarti’ (welcoming the grooms family into the brides family) and Varmala (it is one of the oldest traditions followed in the Indian wedding ceremony and signifies the affection between the bride and groom). 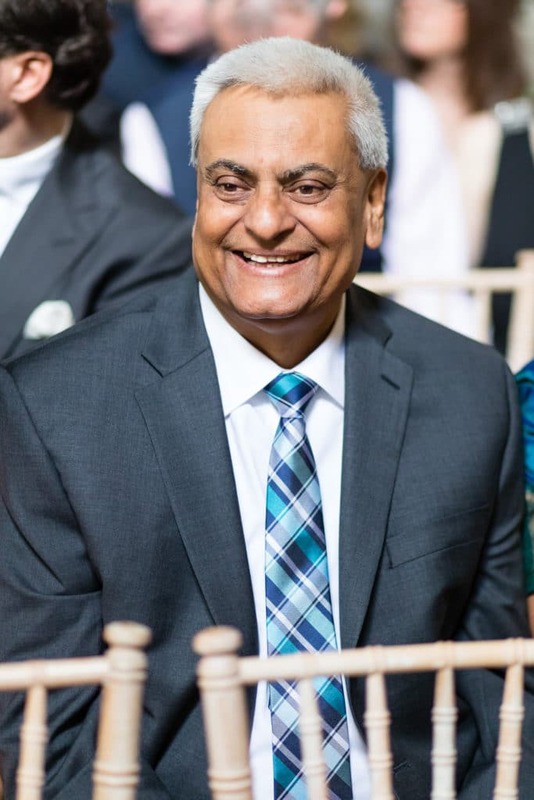 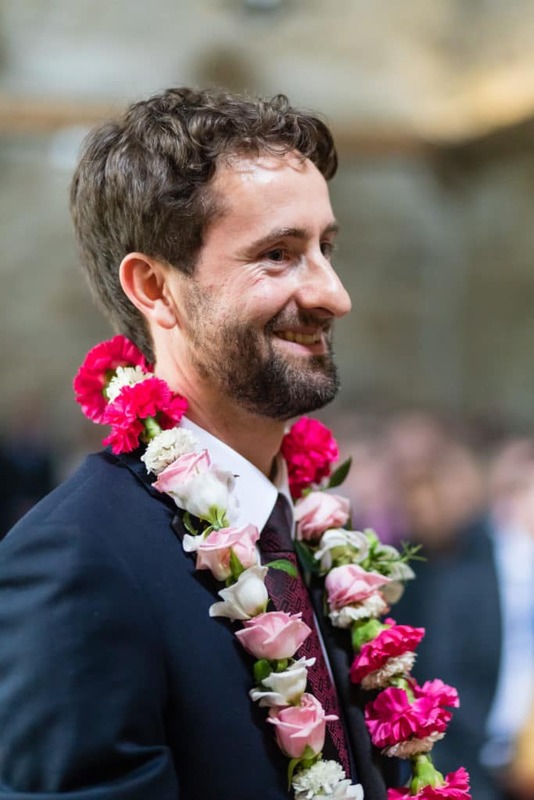 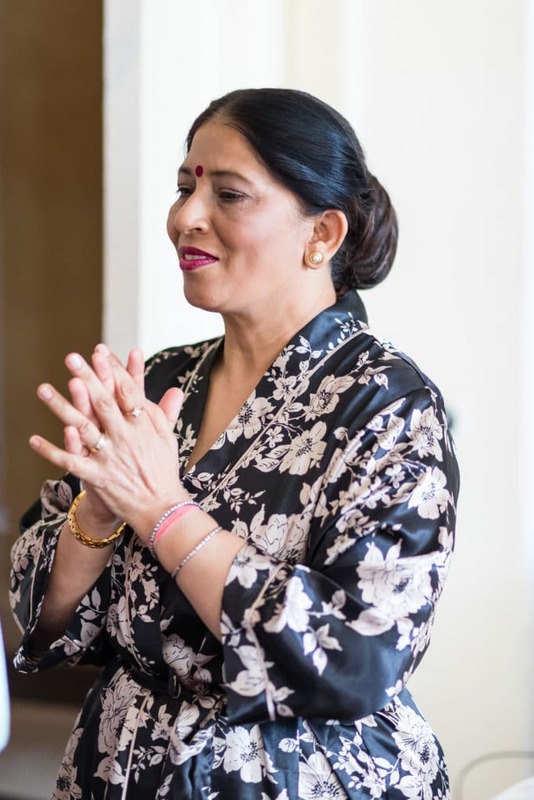 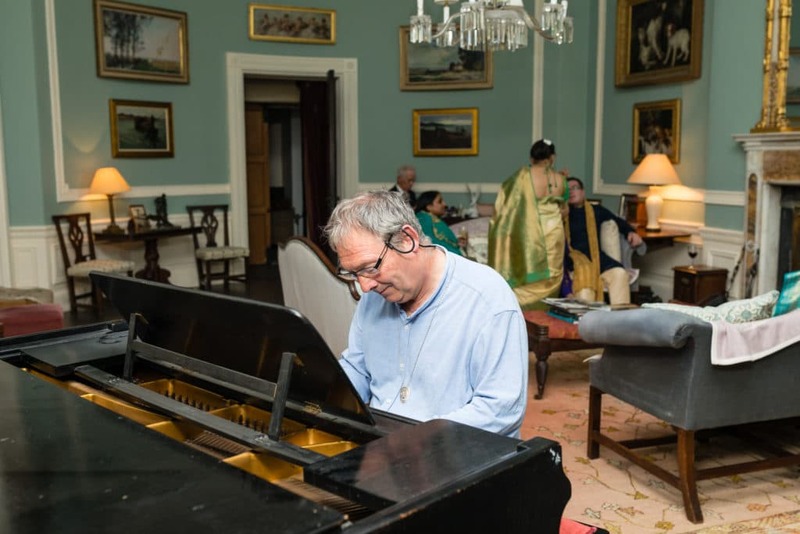 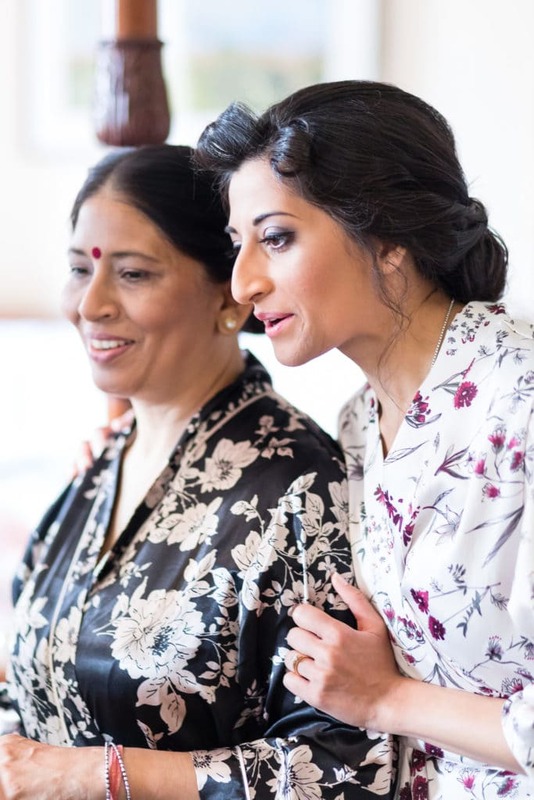 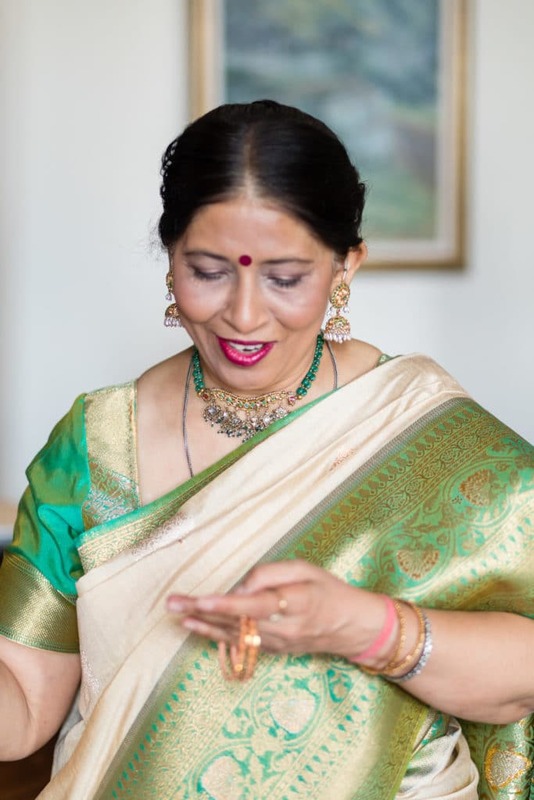 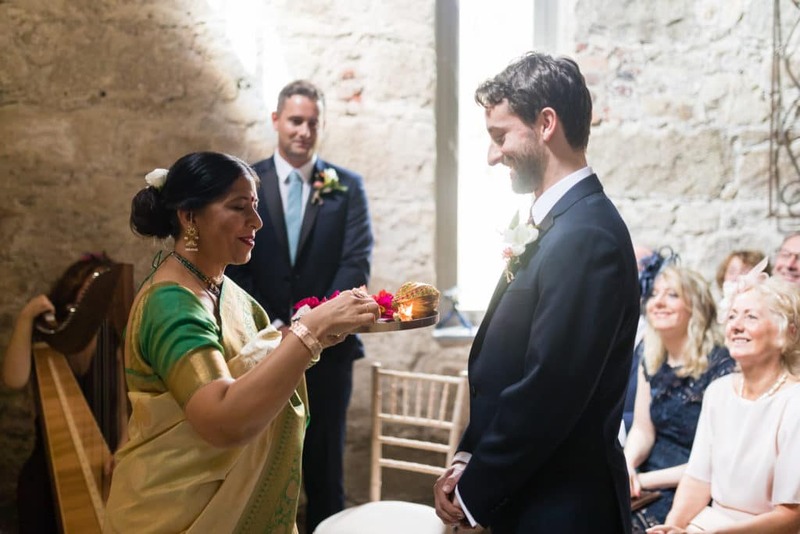 The readings included a special poem written by the groom’s aunt and an Indian love poem. 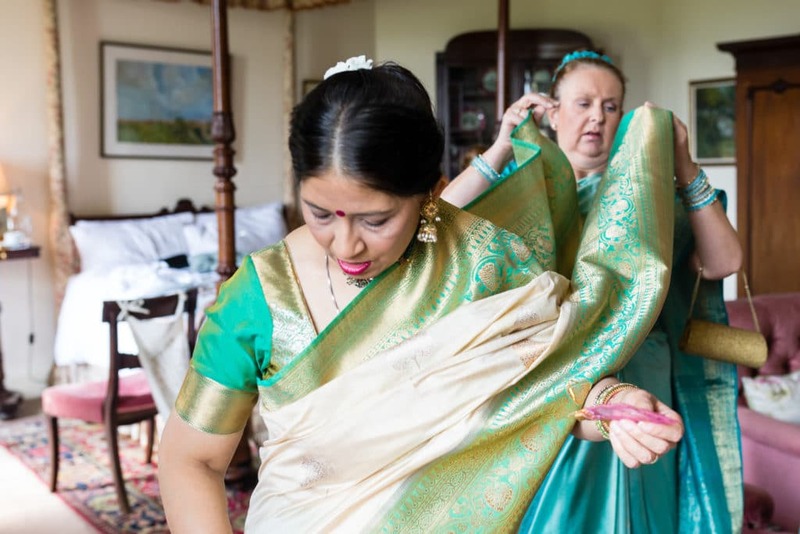 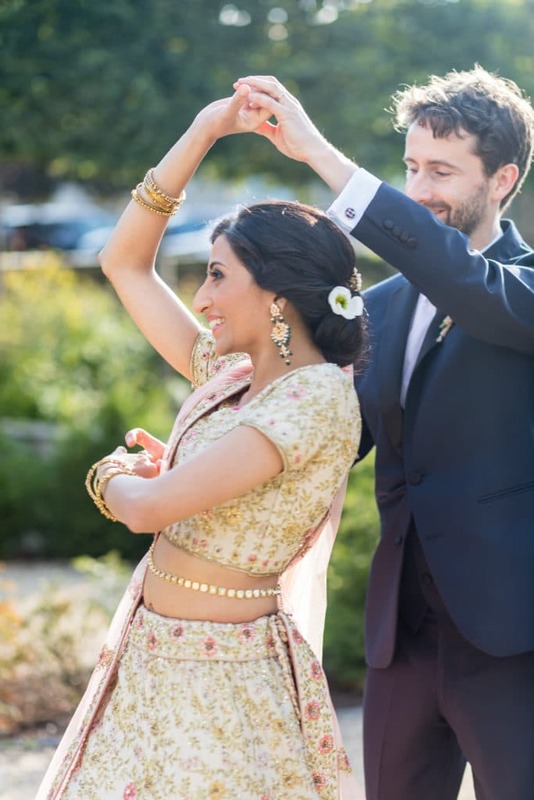 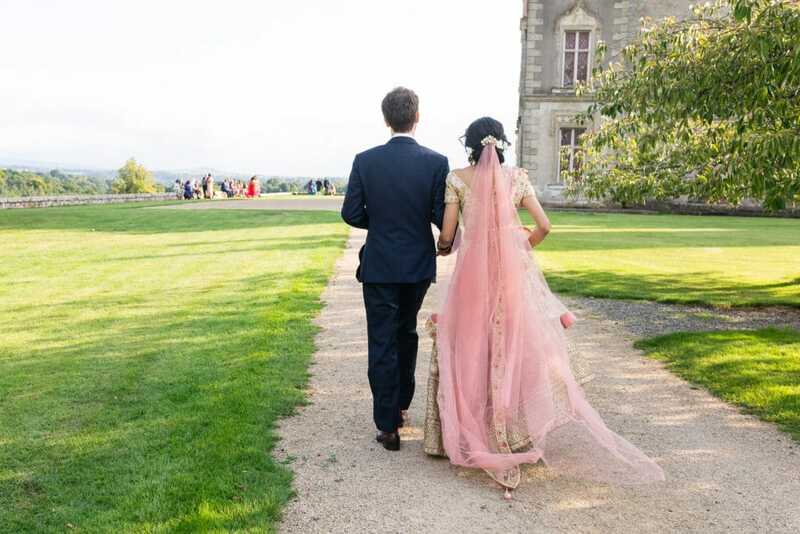 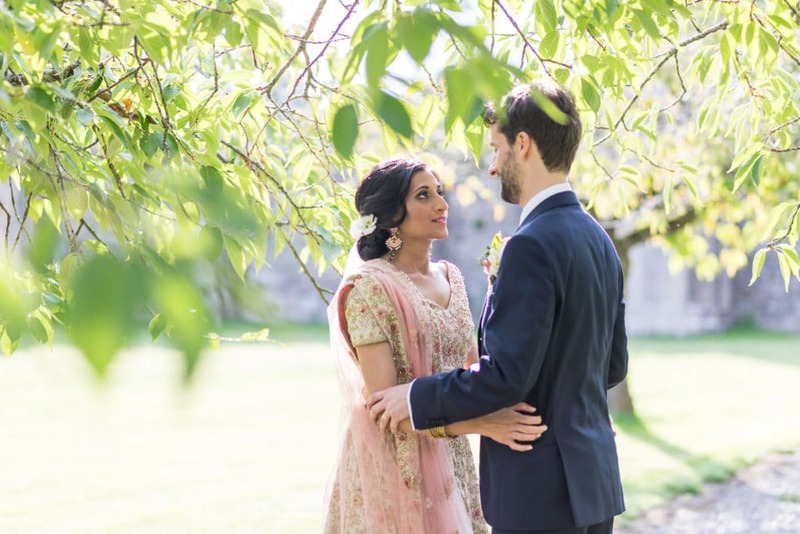 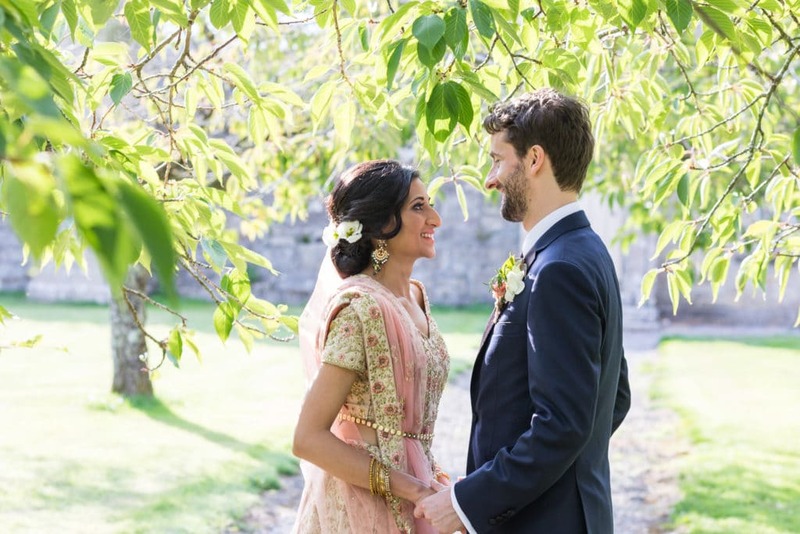 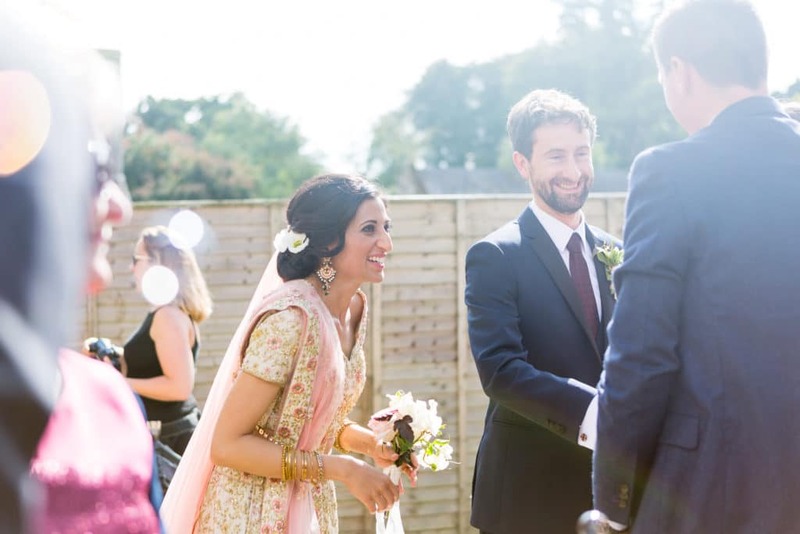 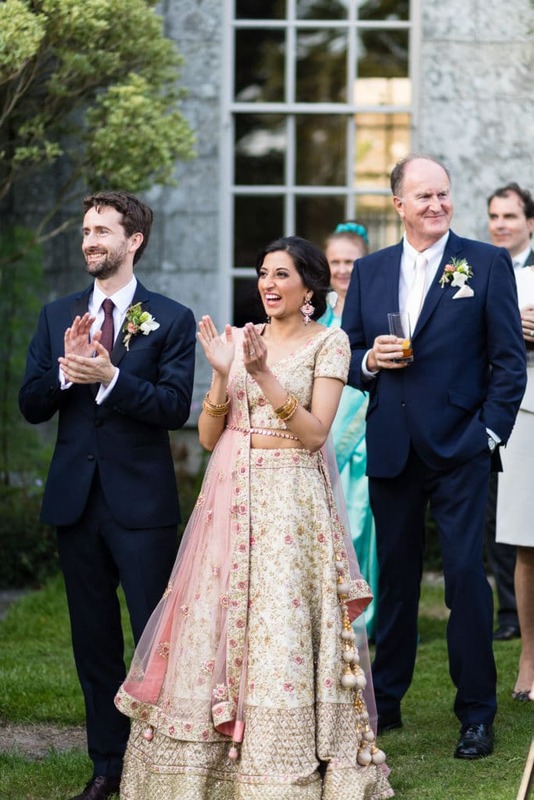 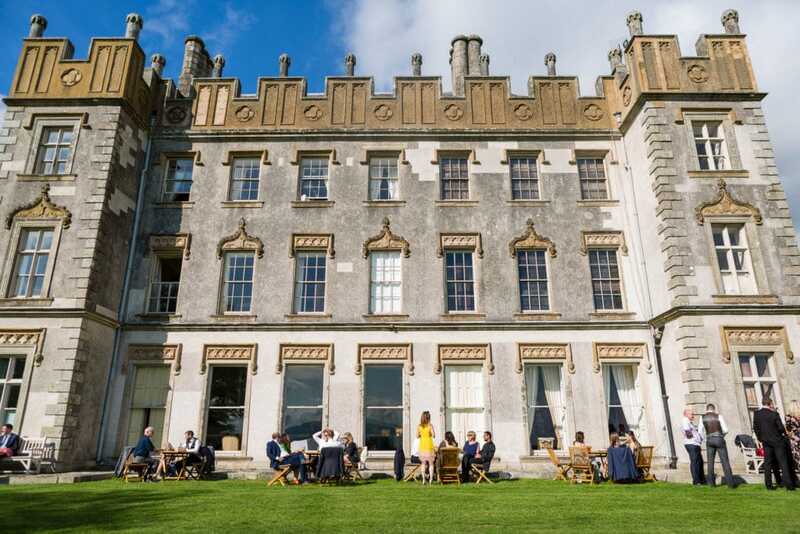 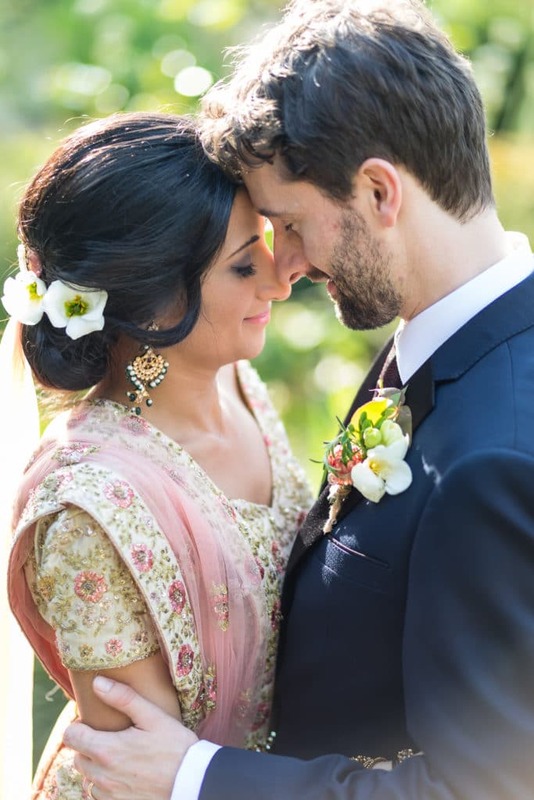 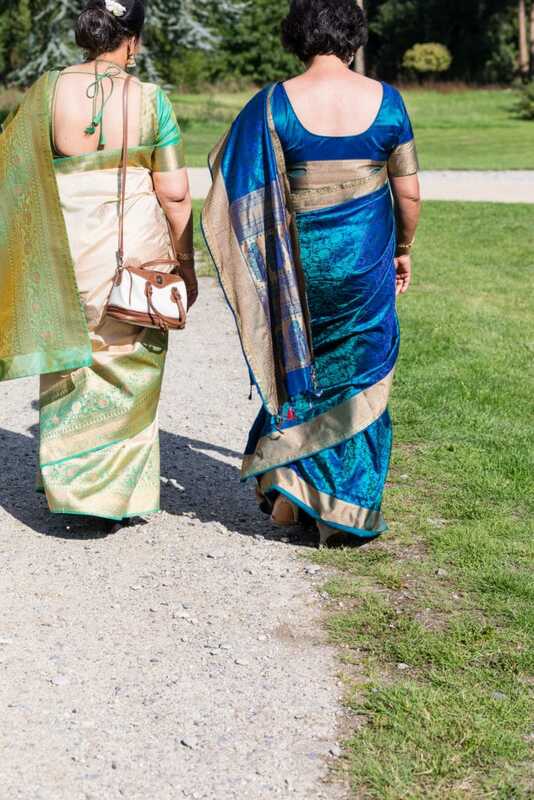 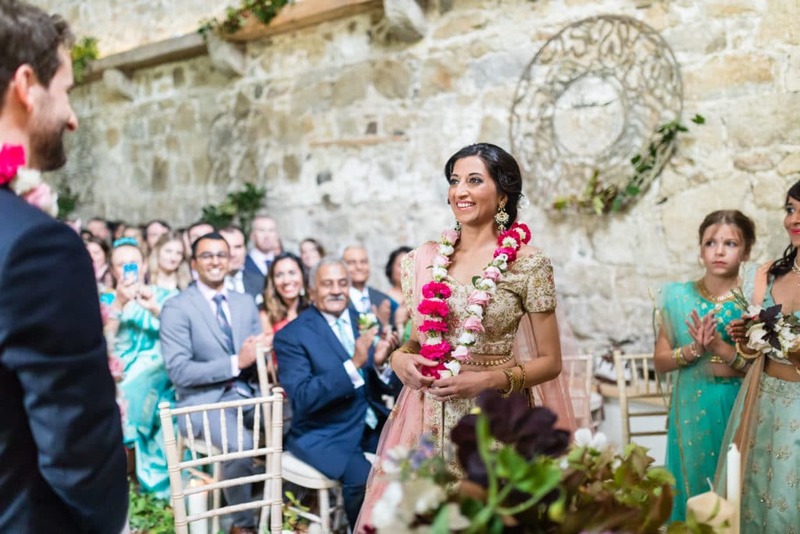 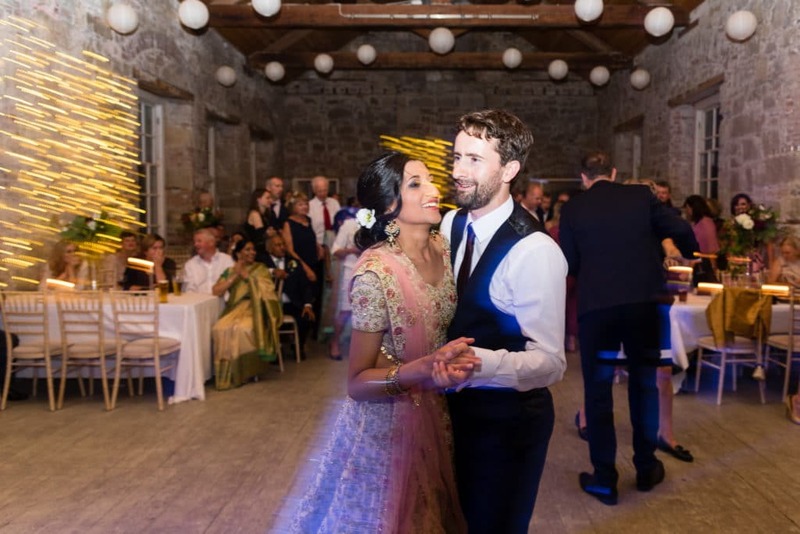 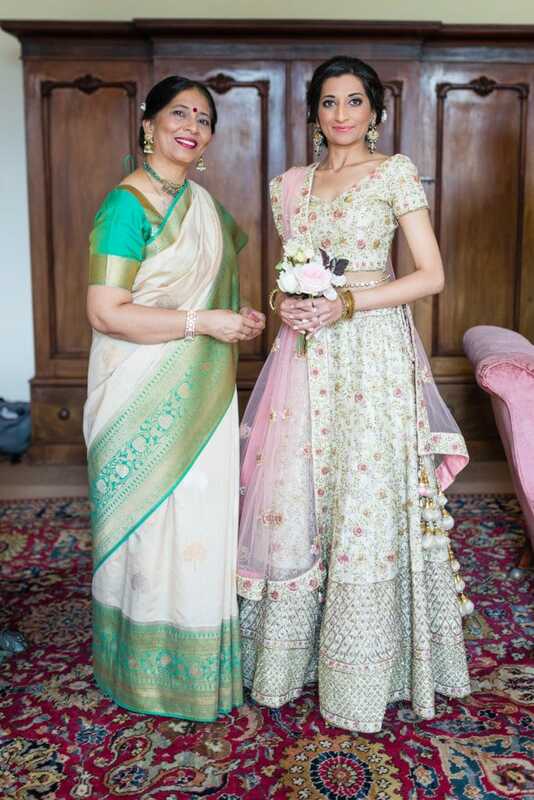 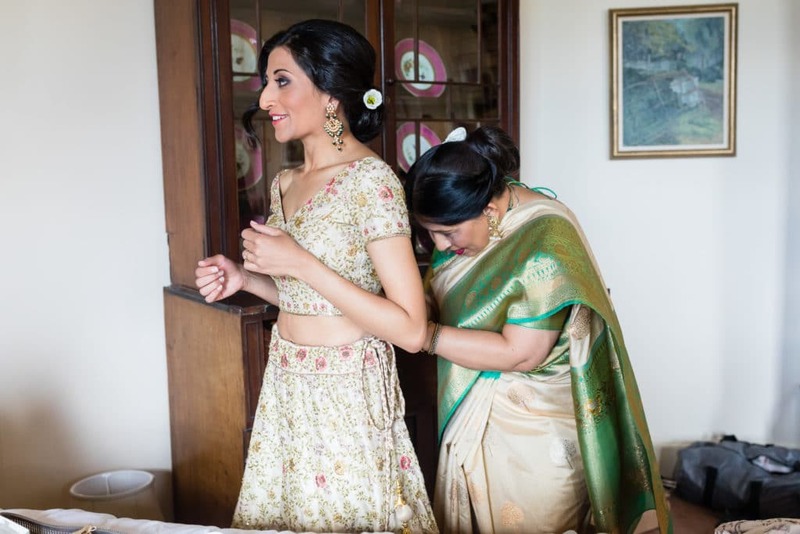 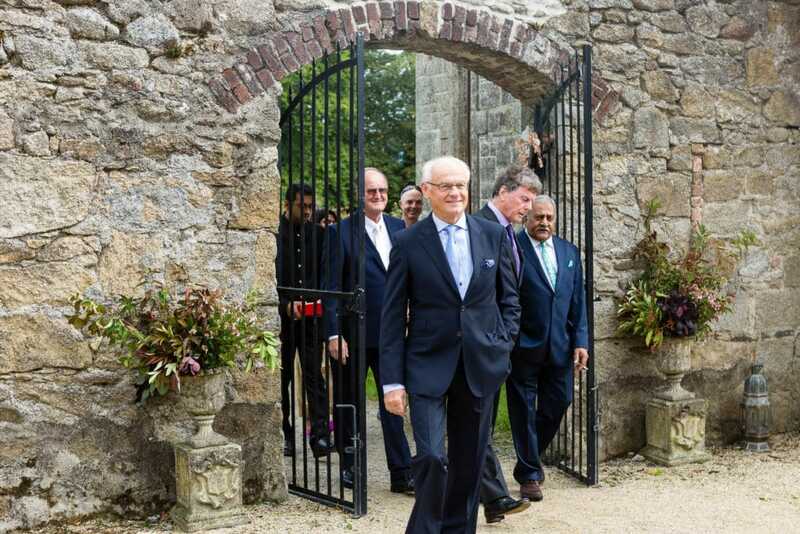 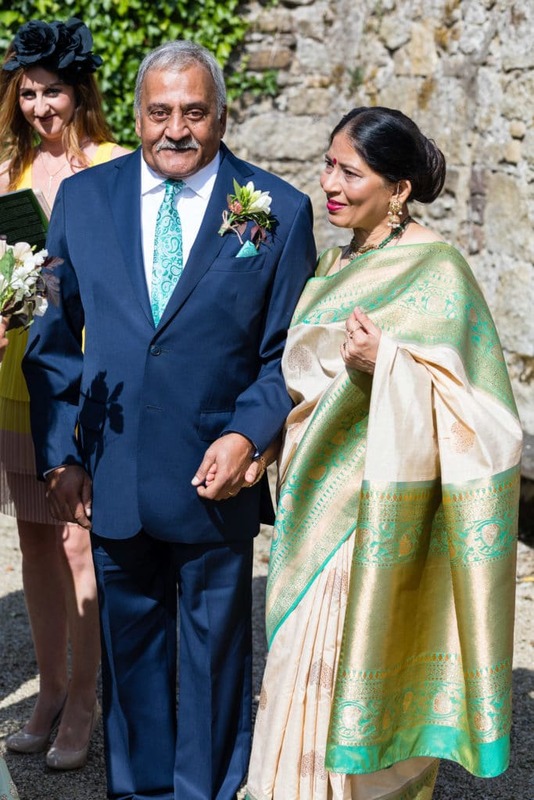 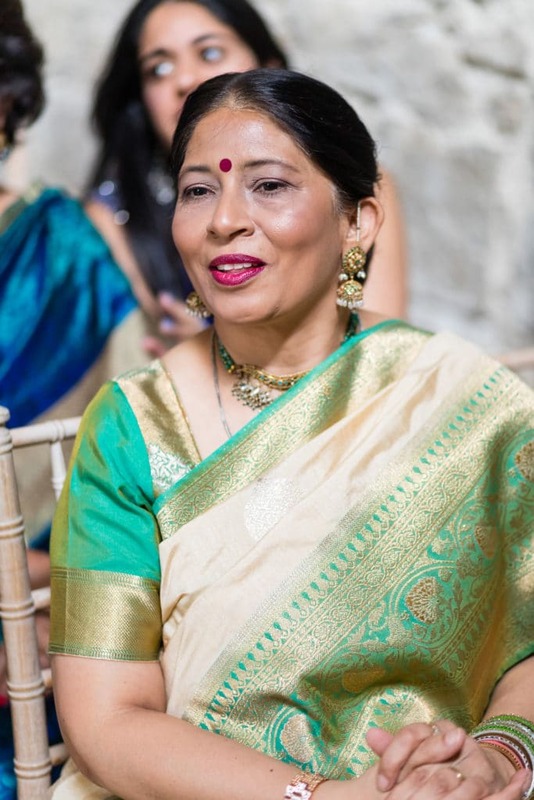 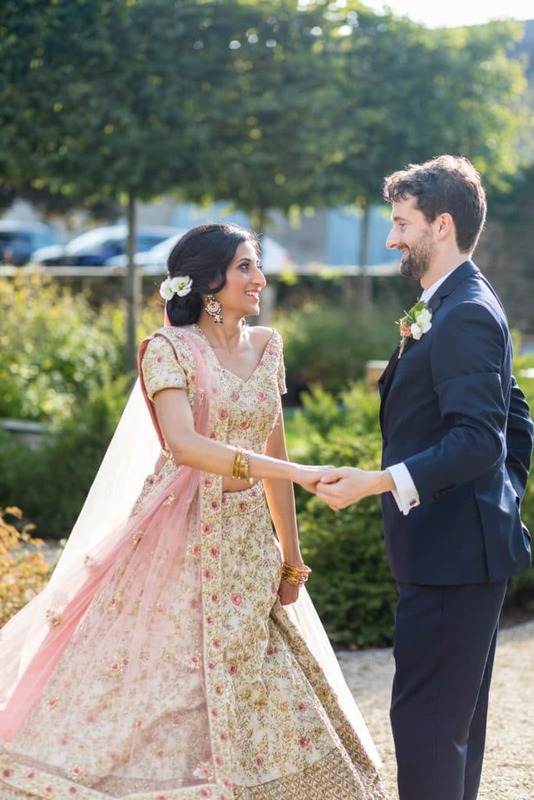 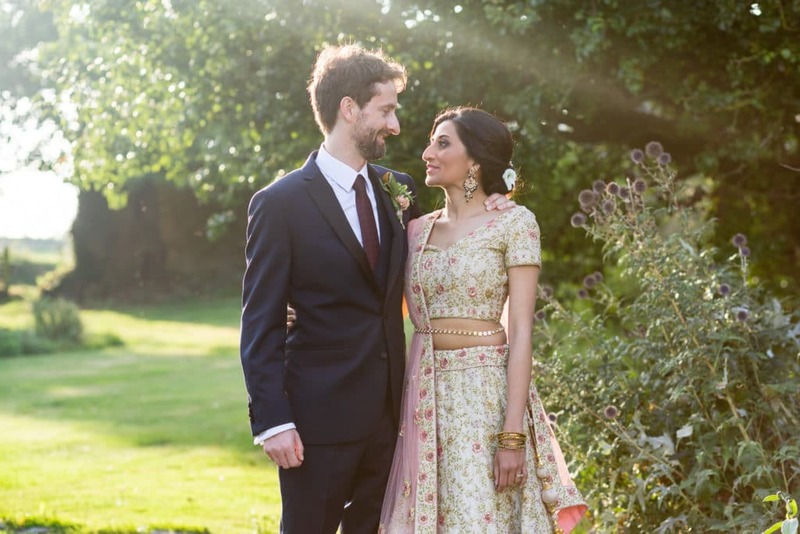 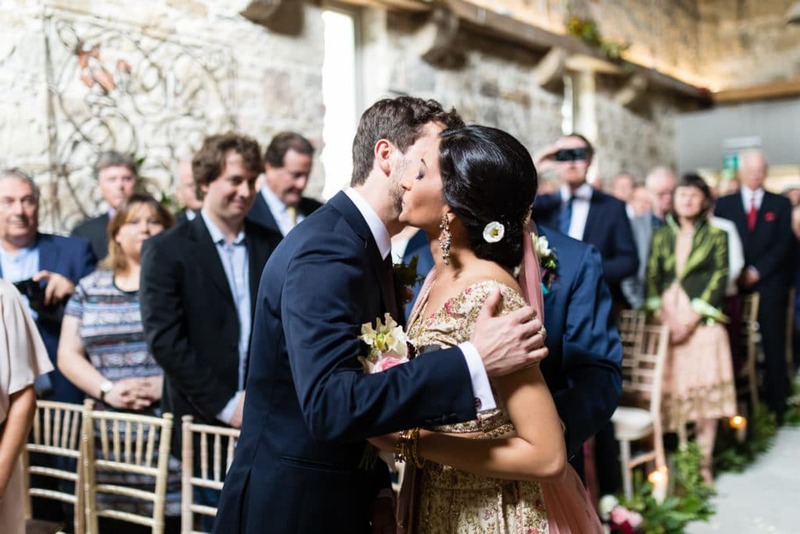 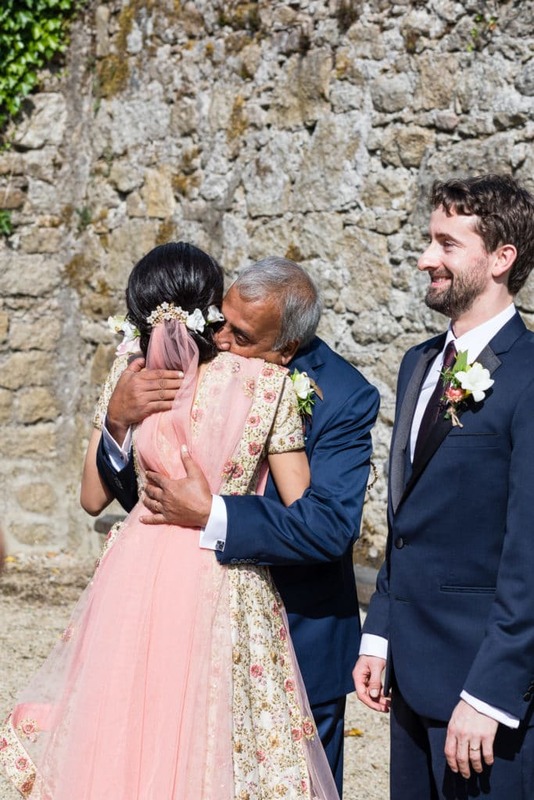 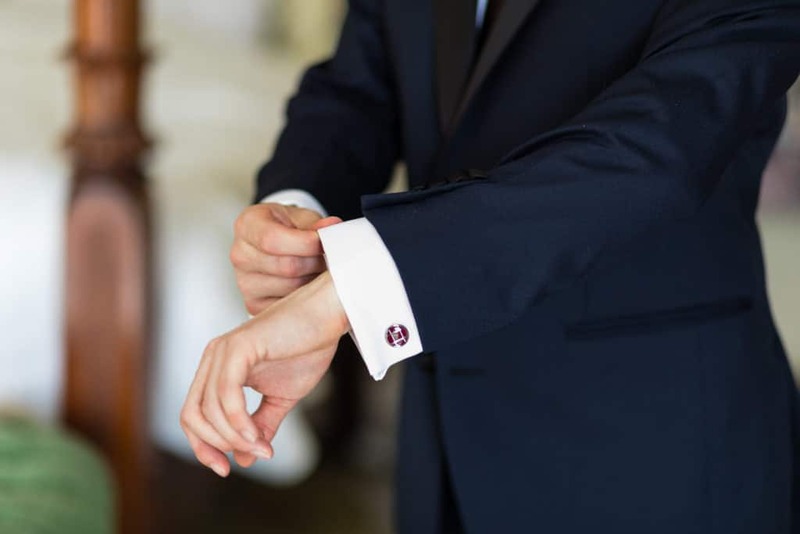 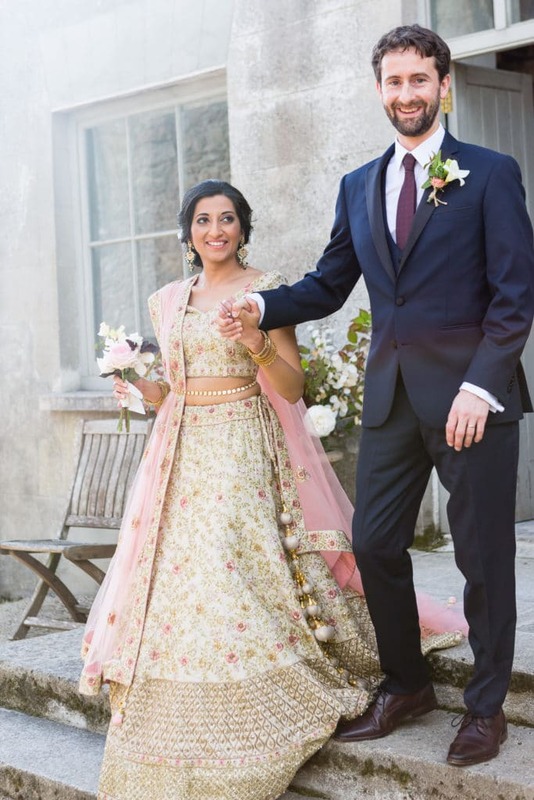 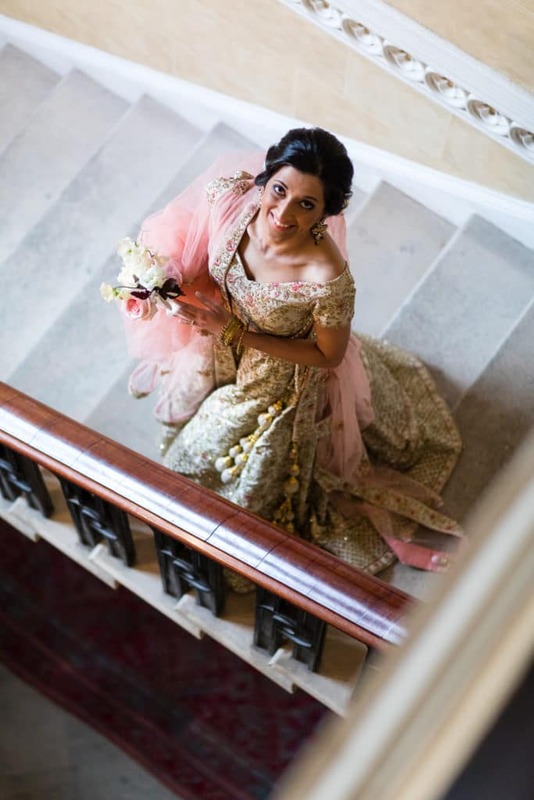 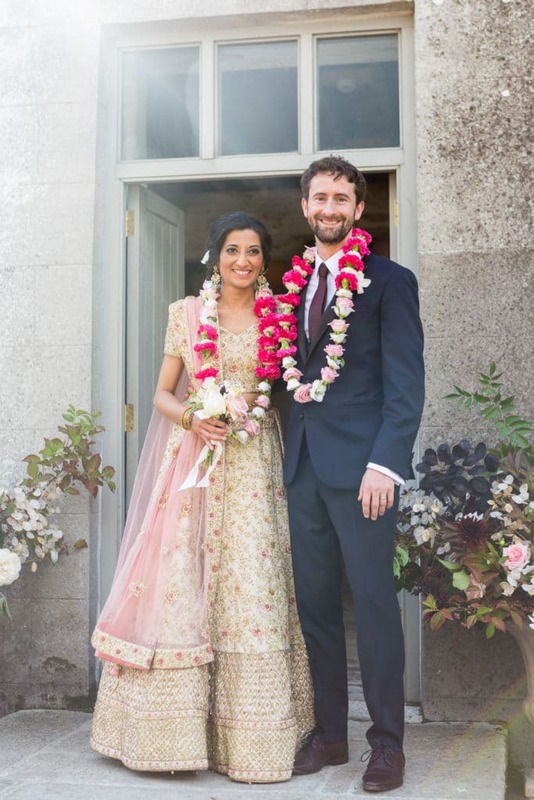 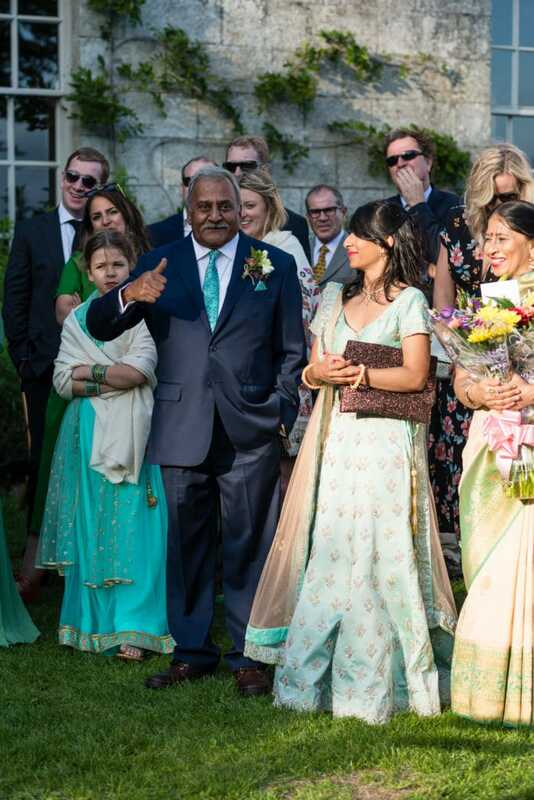 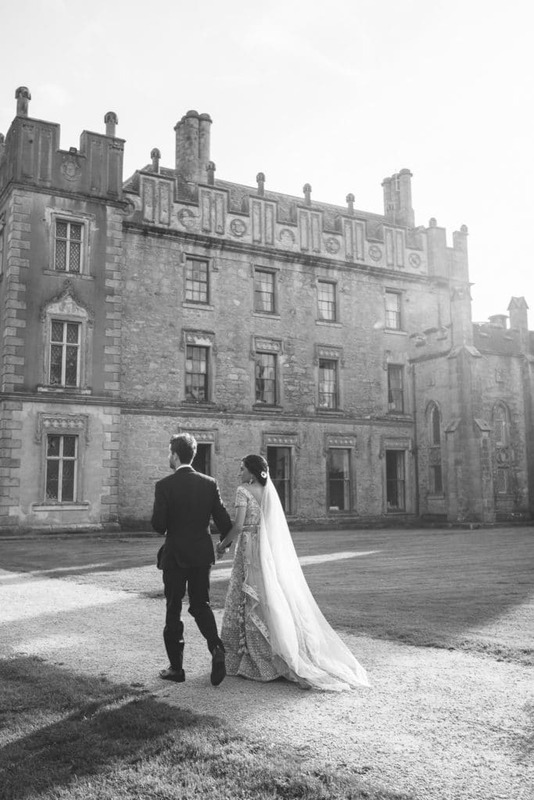 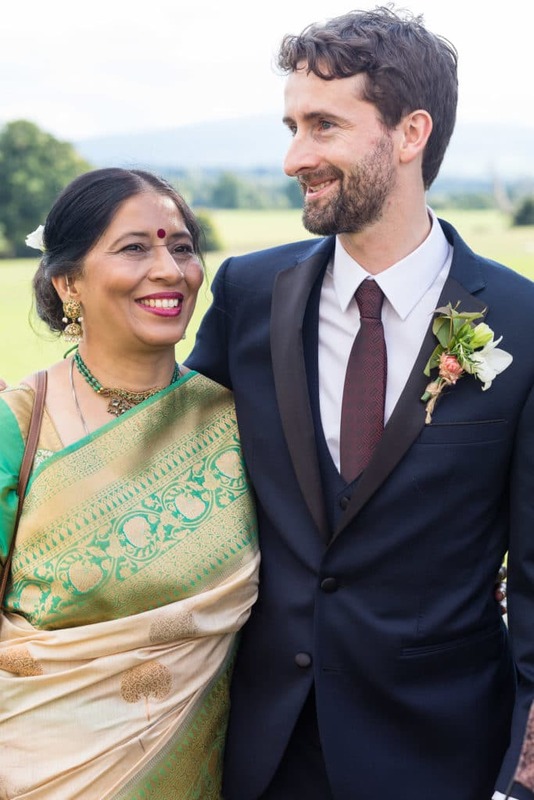 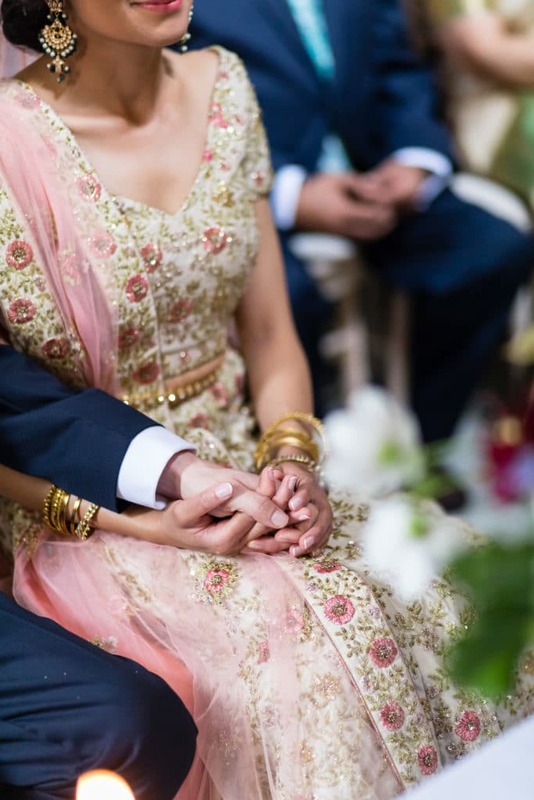 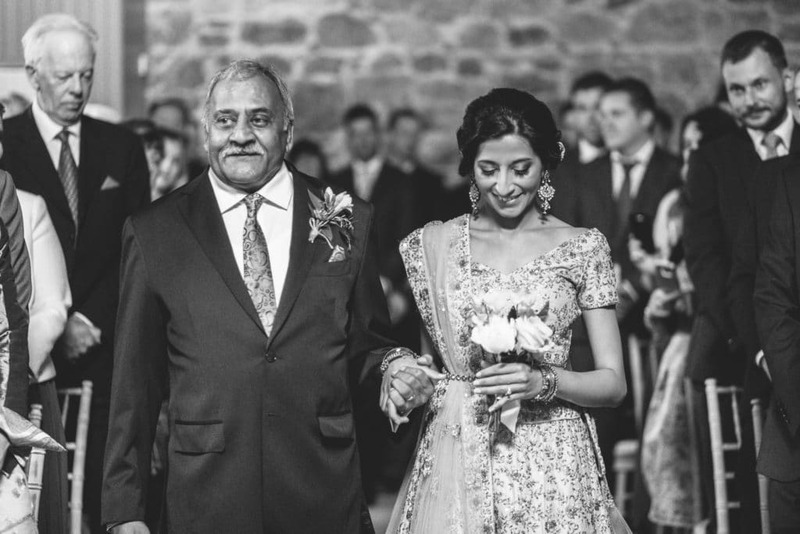 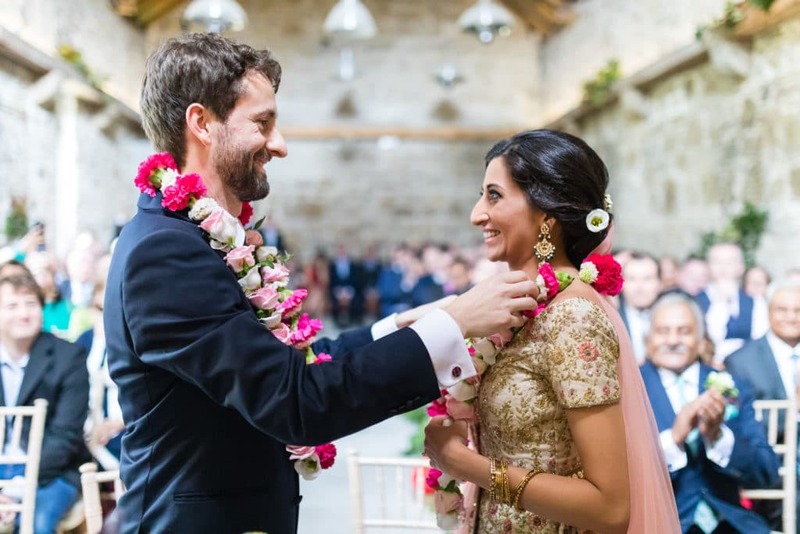 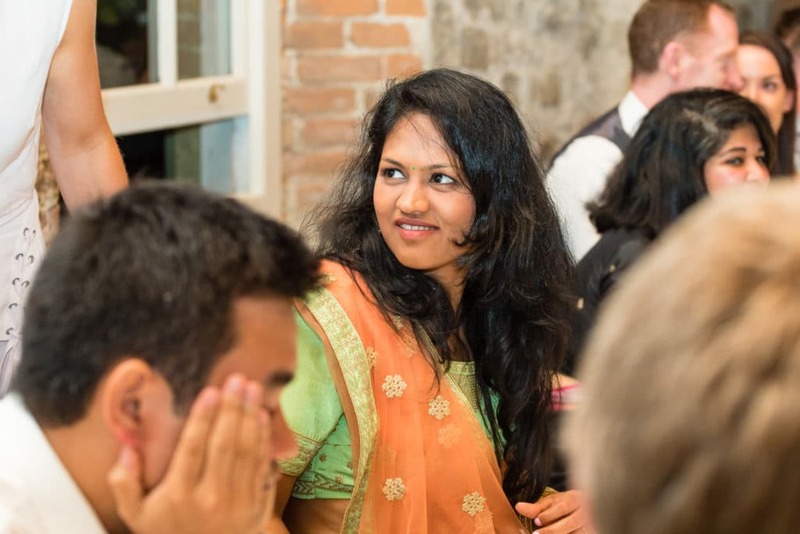 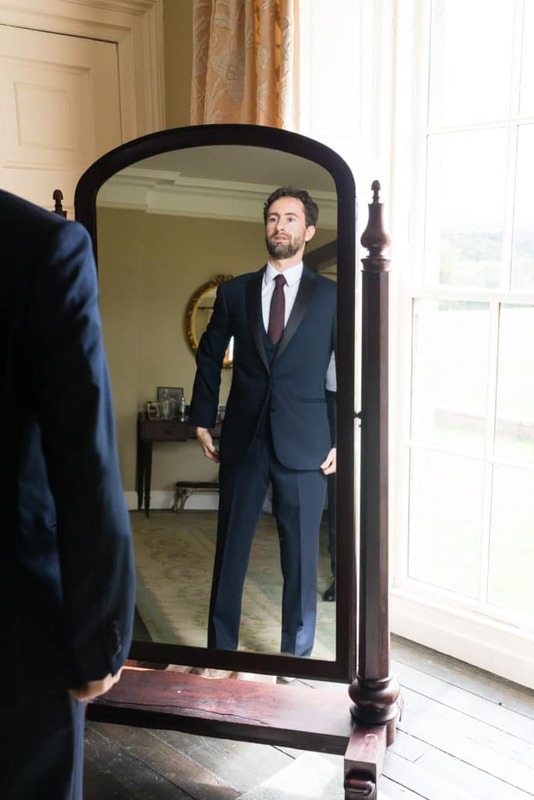 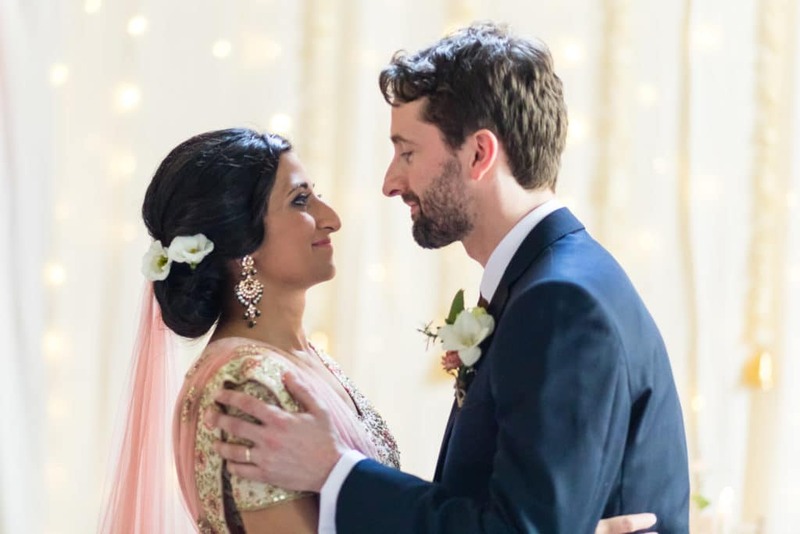 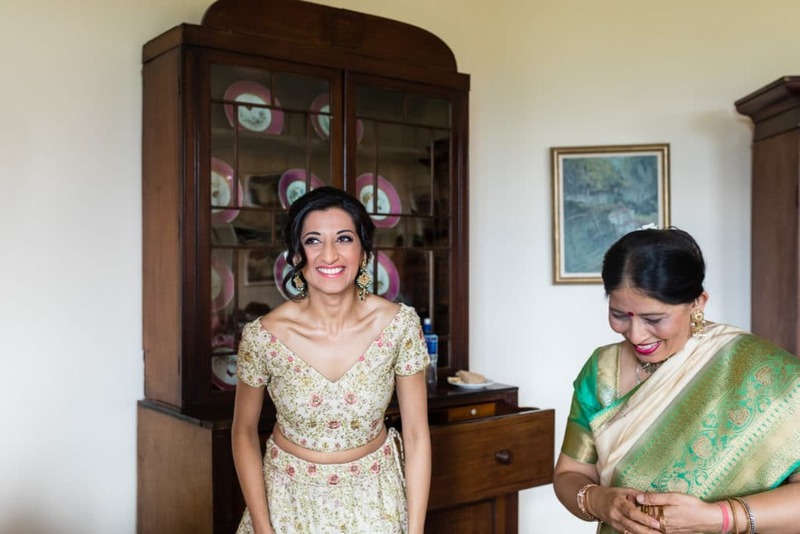 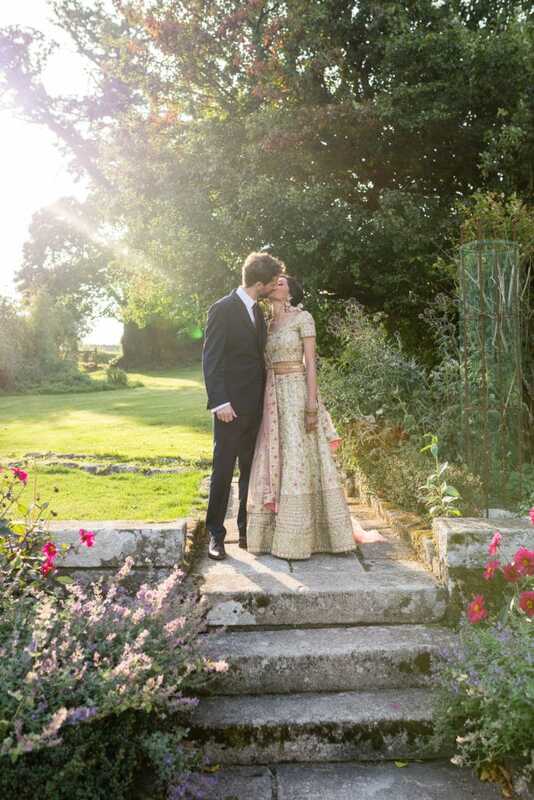 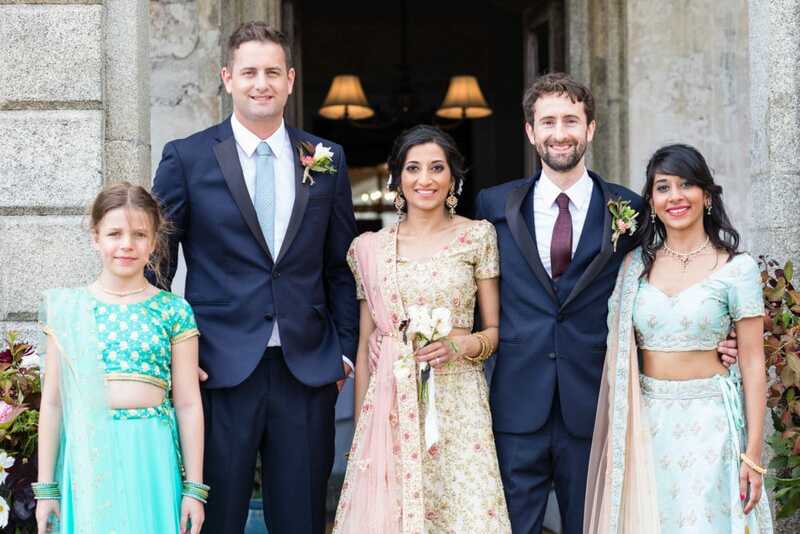 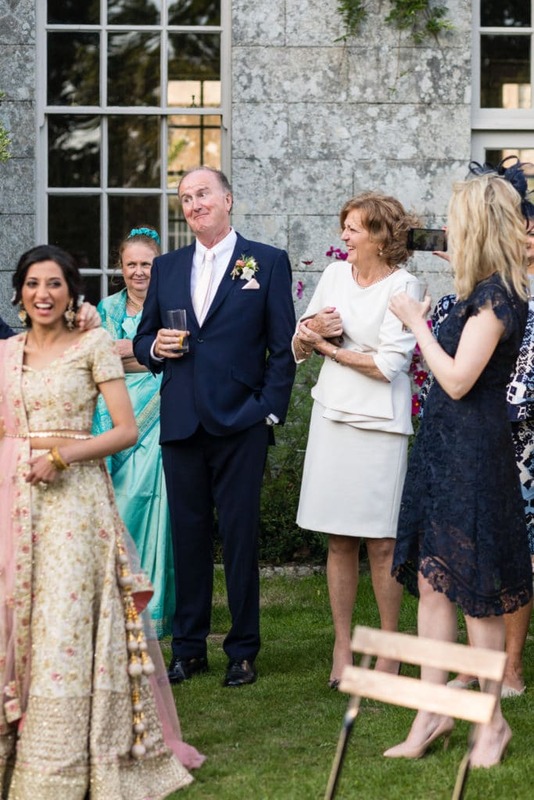 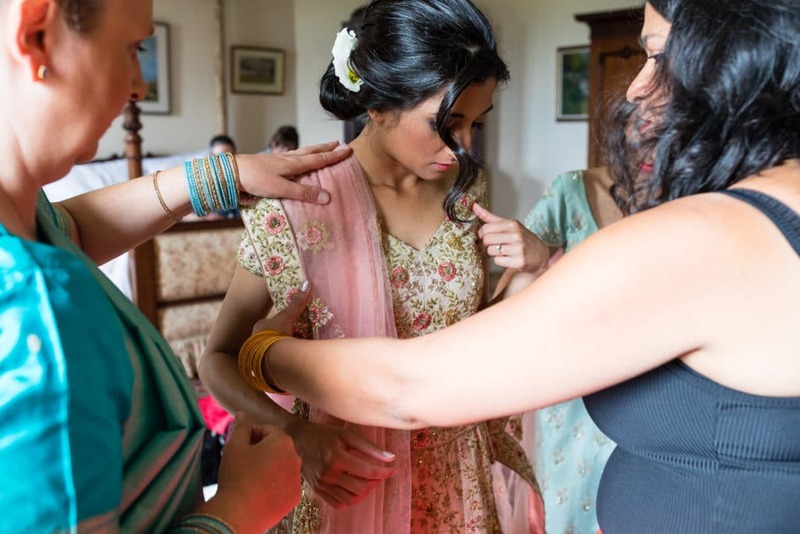 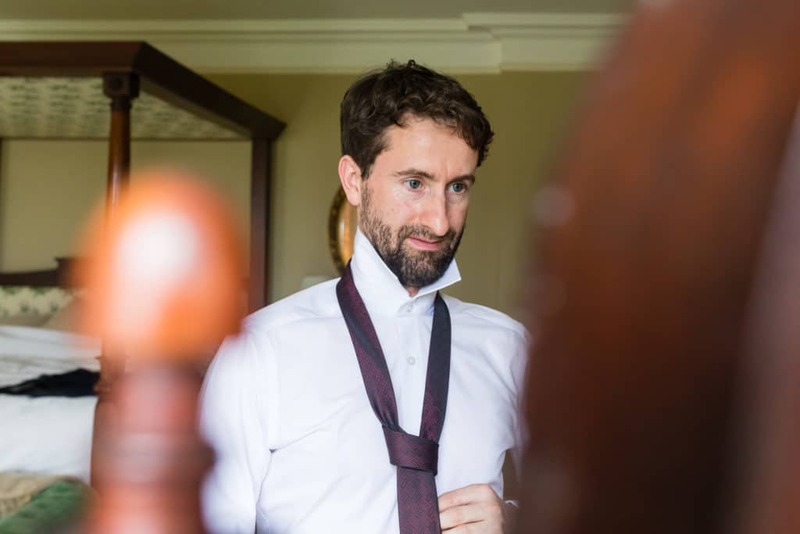 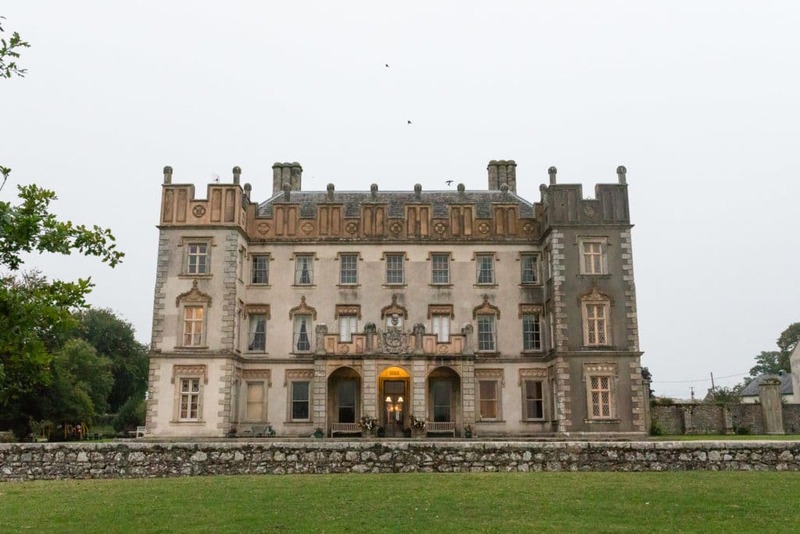 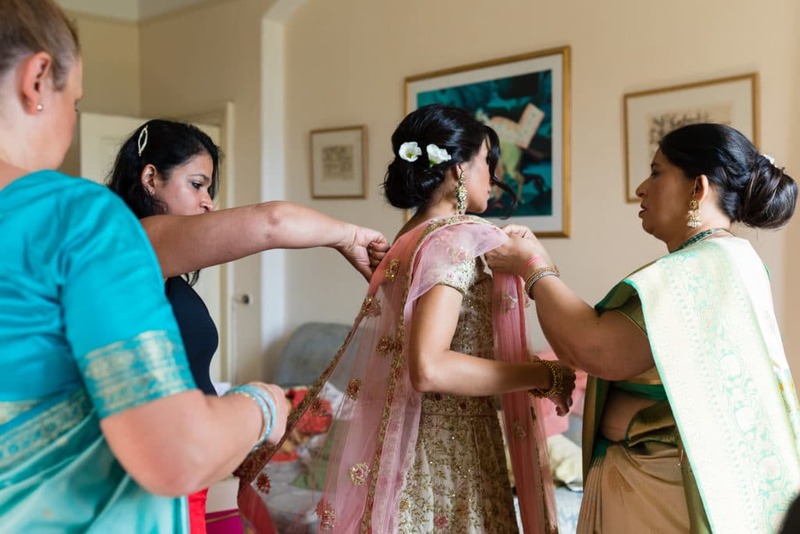 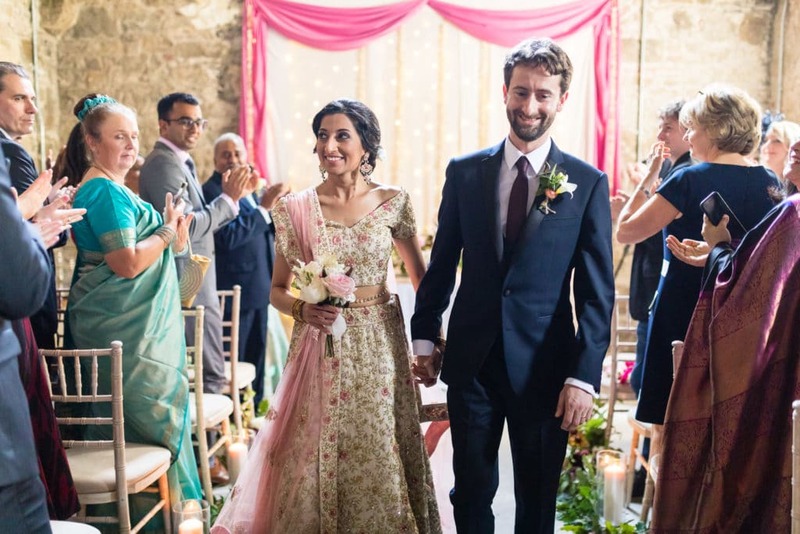 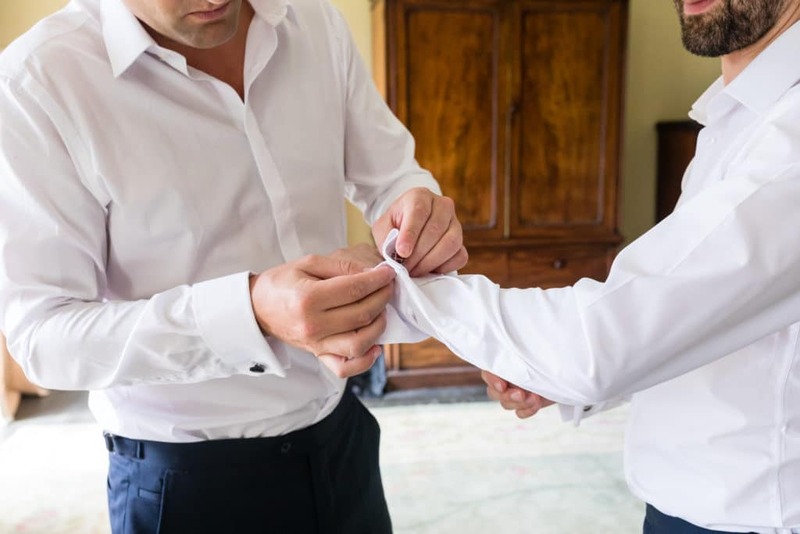 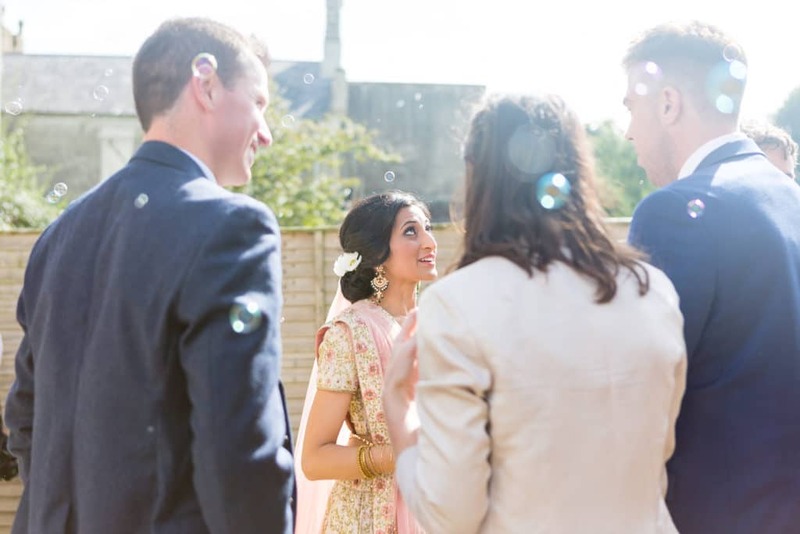 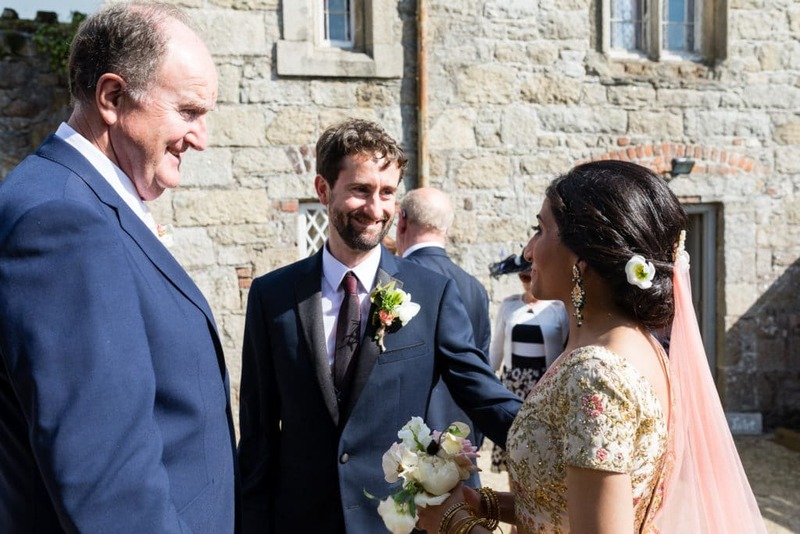 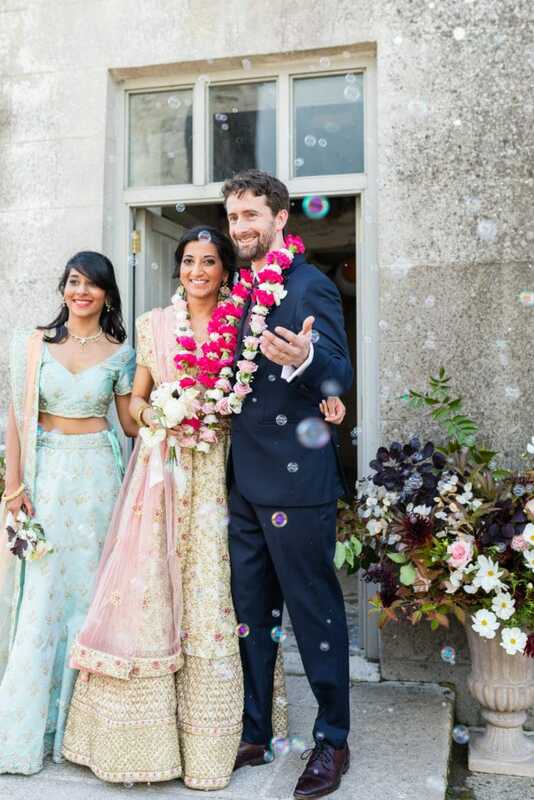 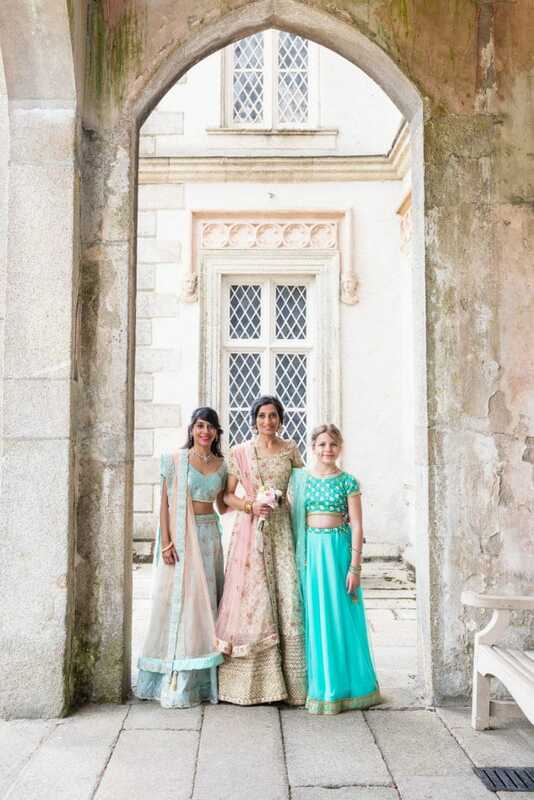 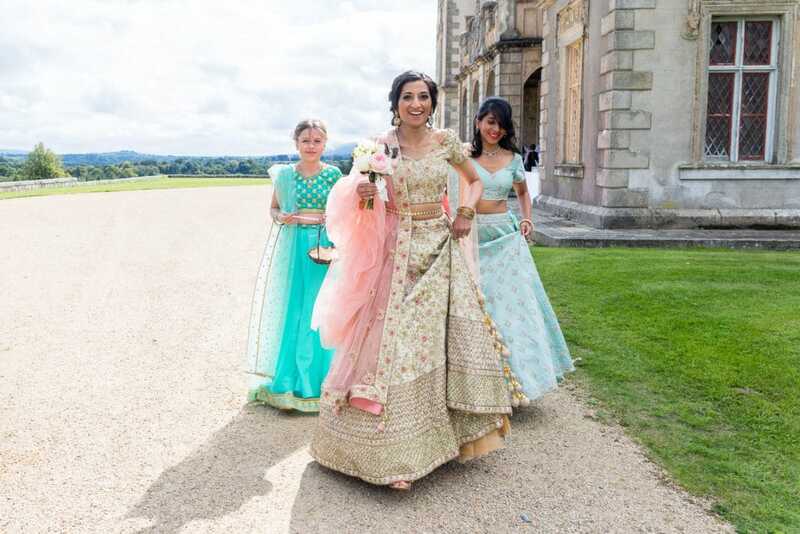 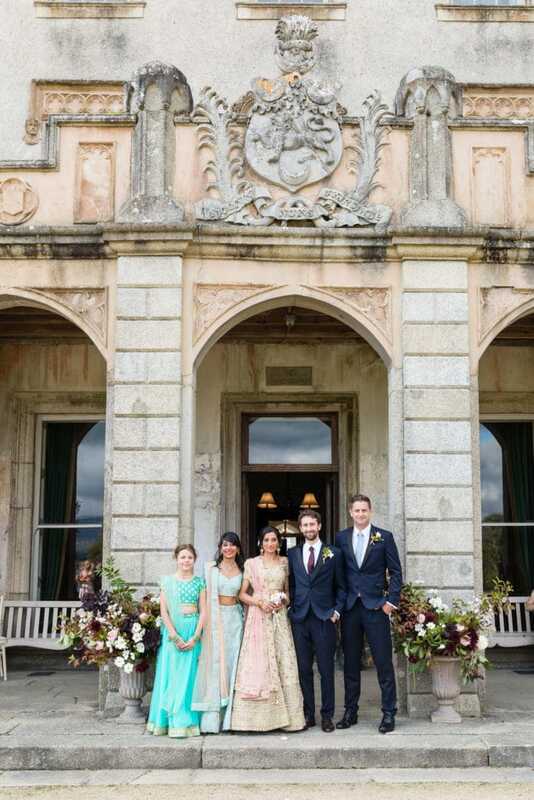 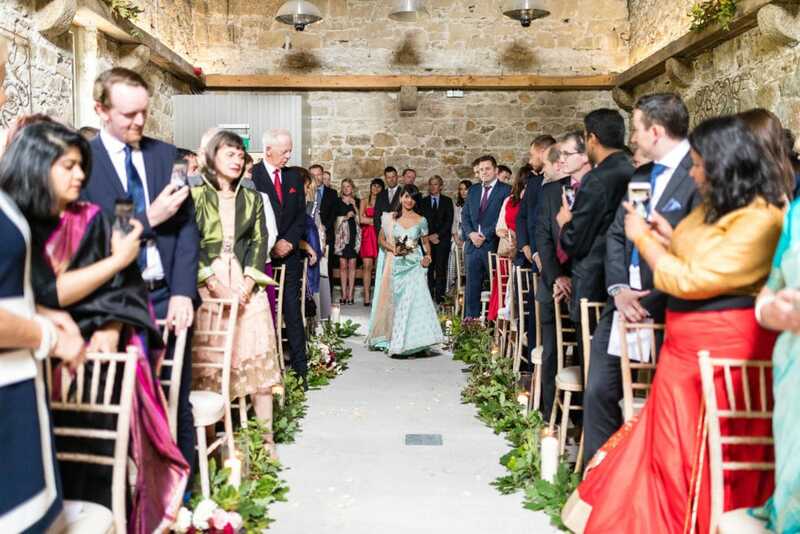 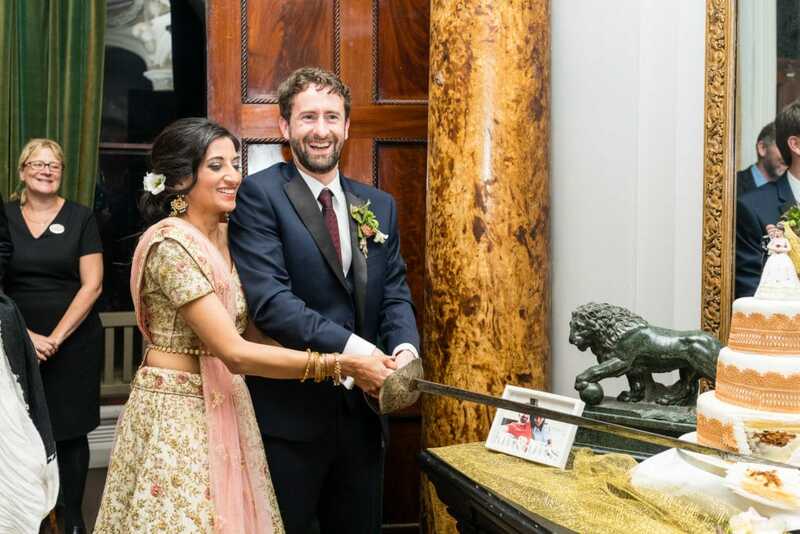 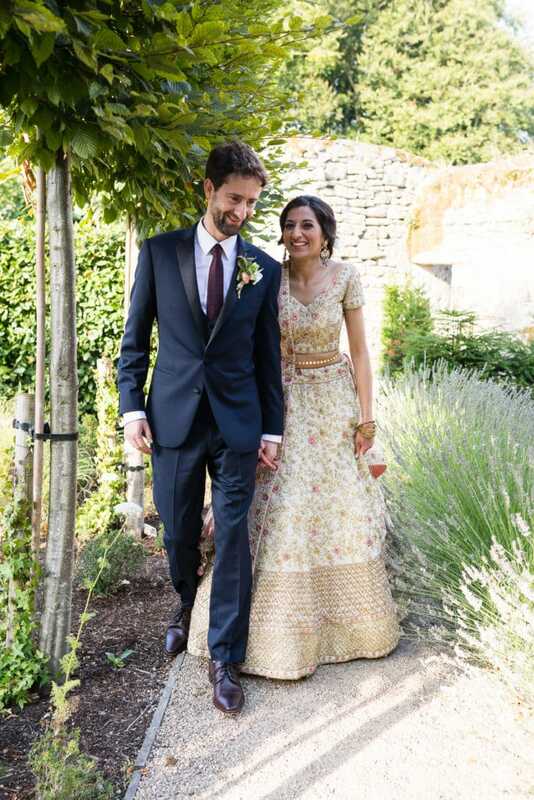 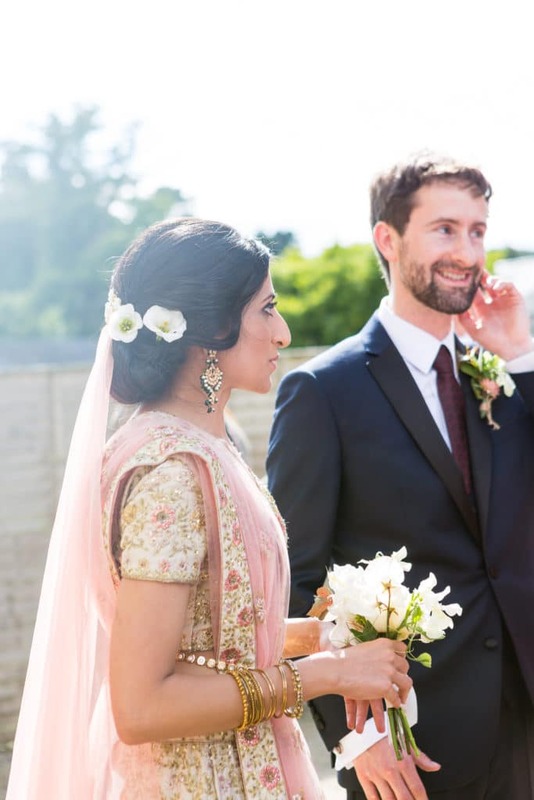 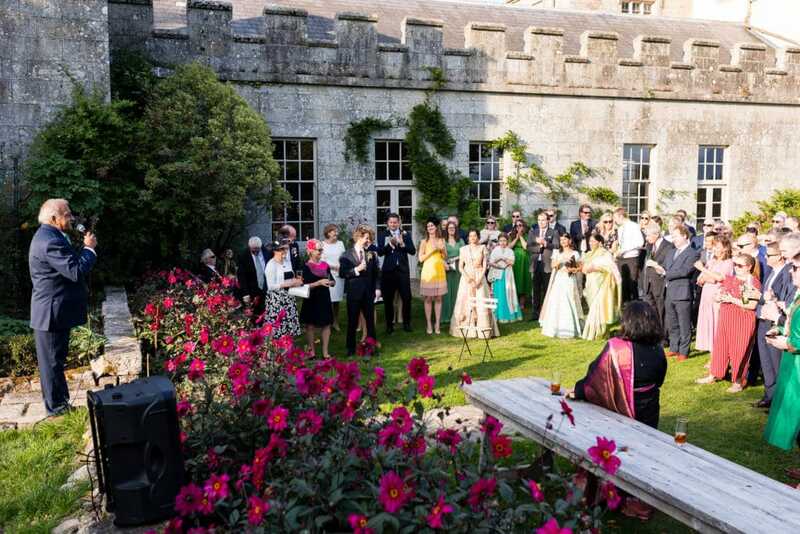 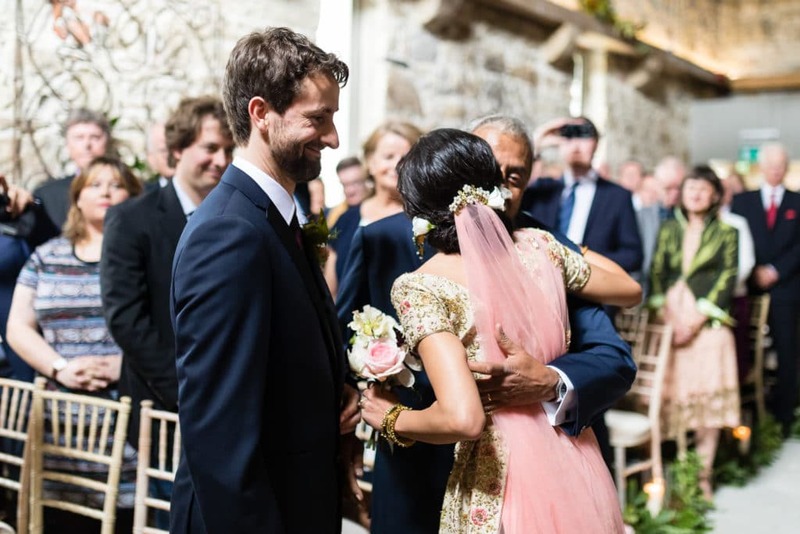 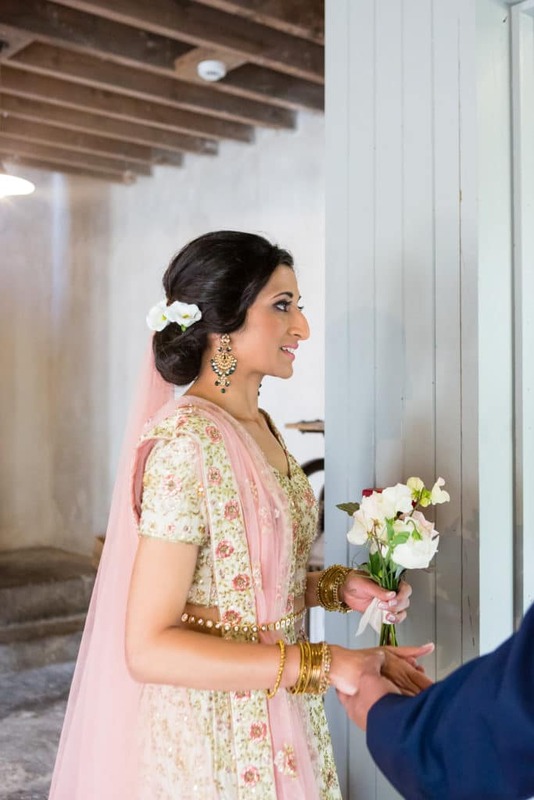 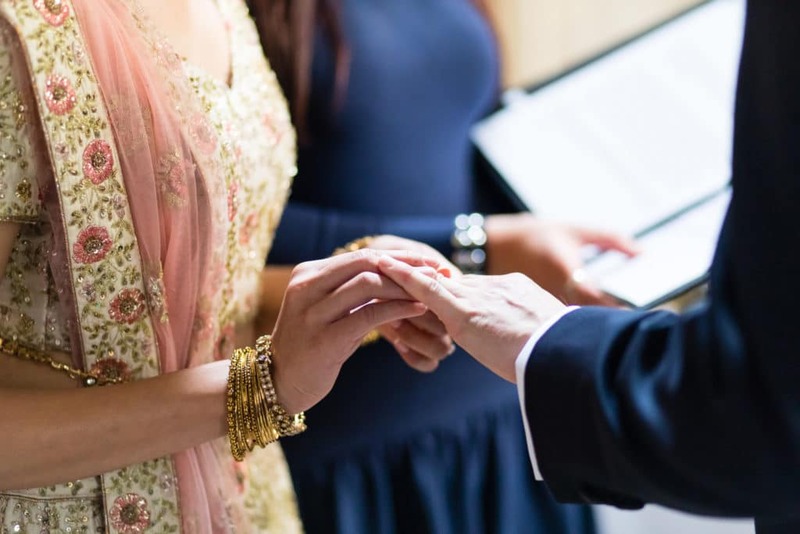 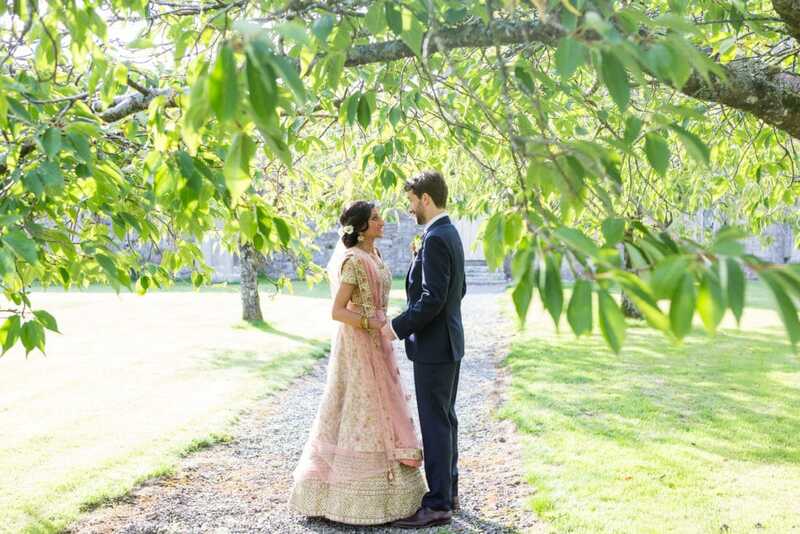 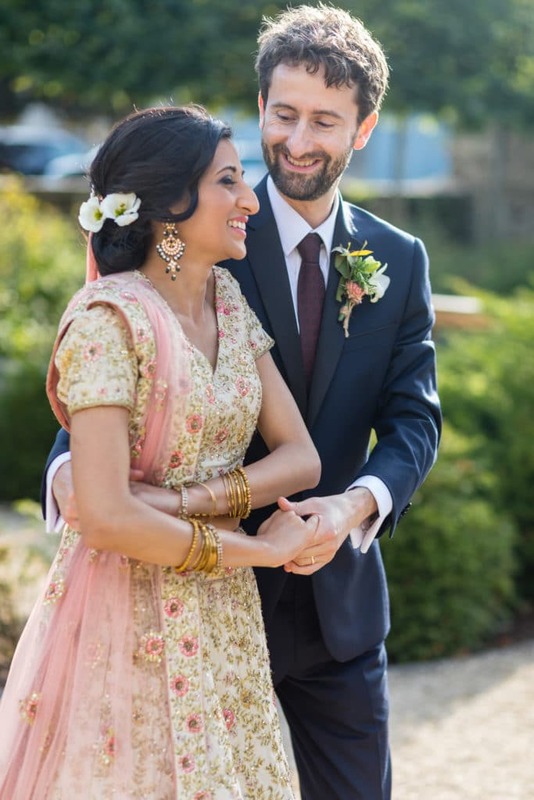 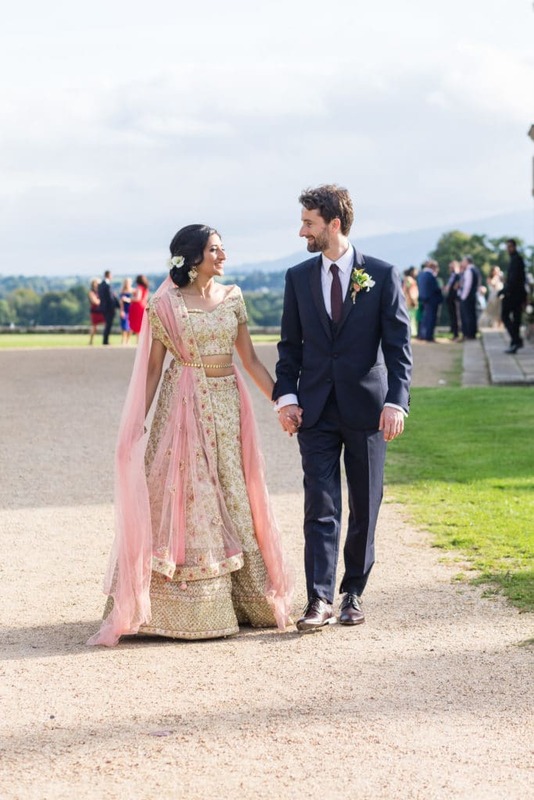 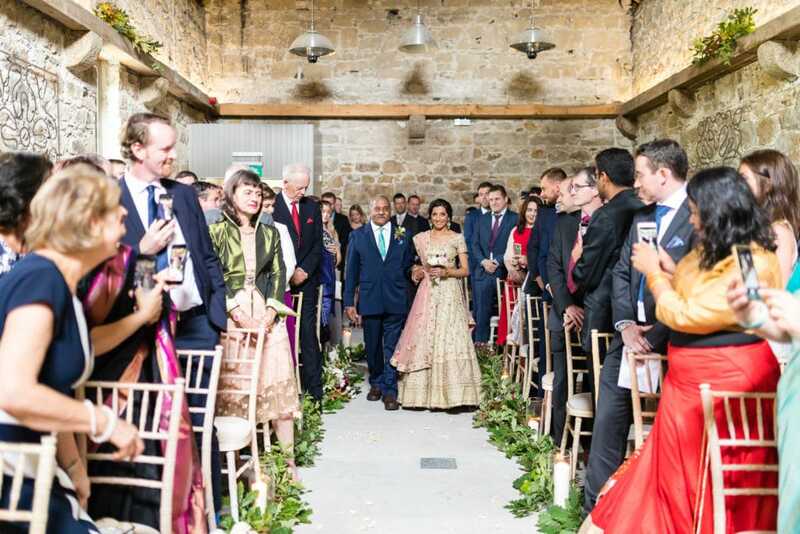 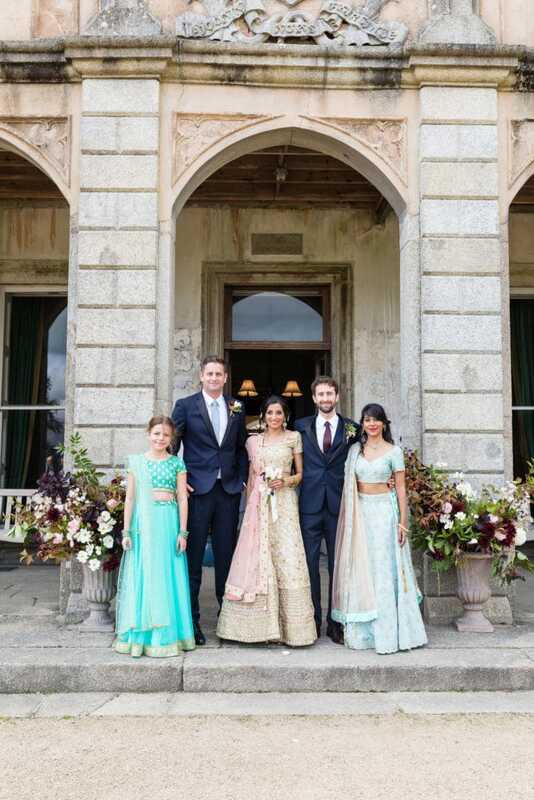 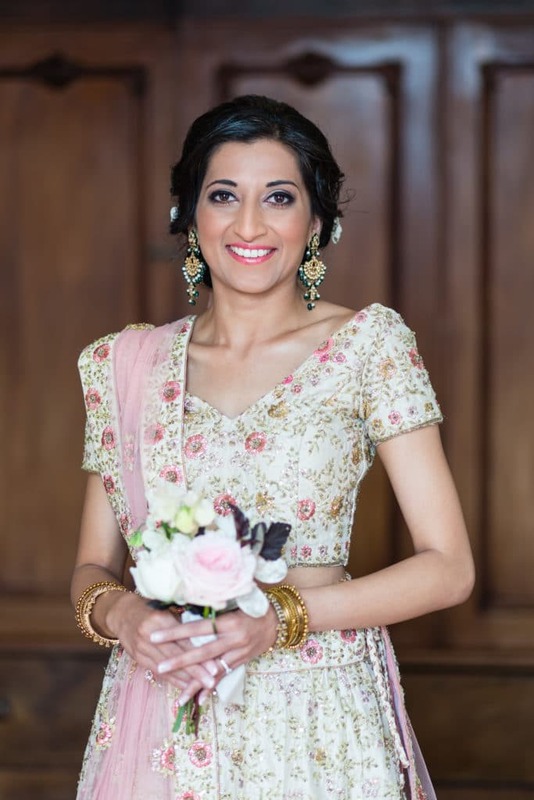 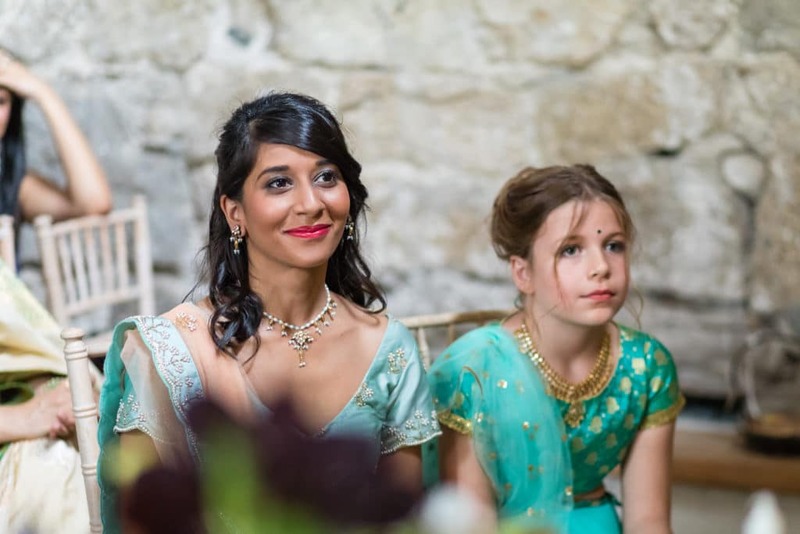 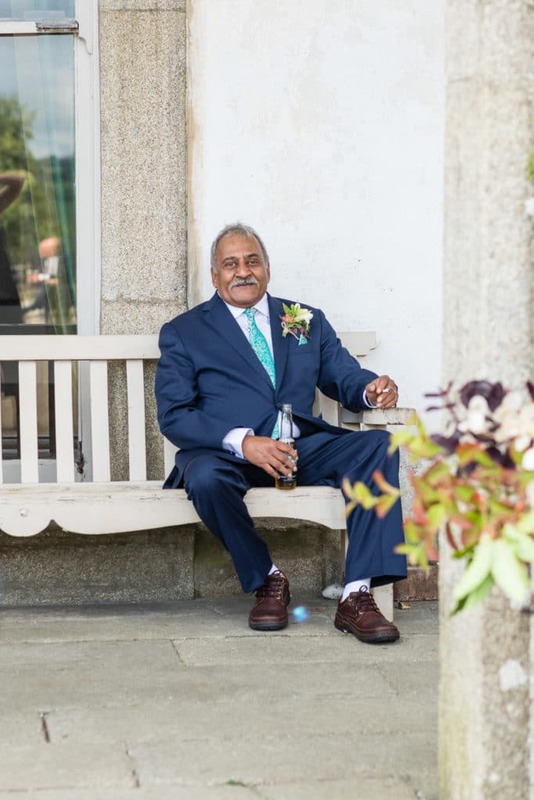 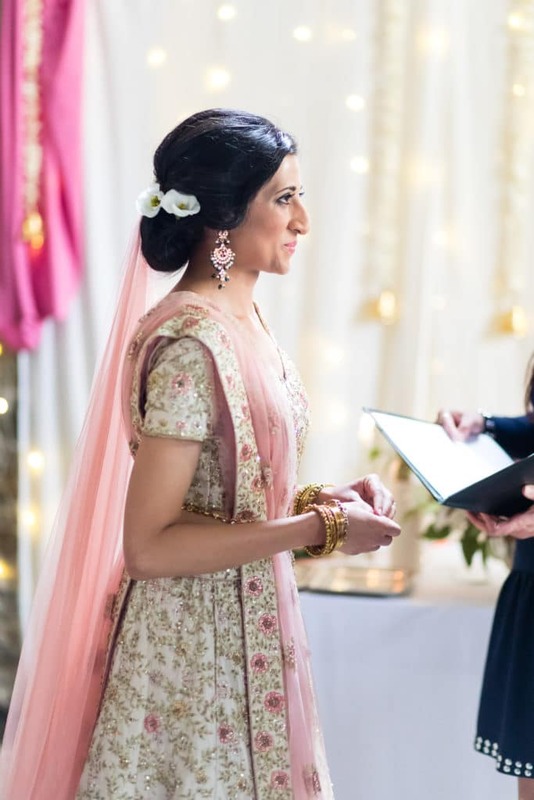 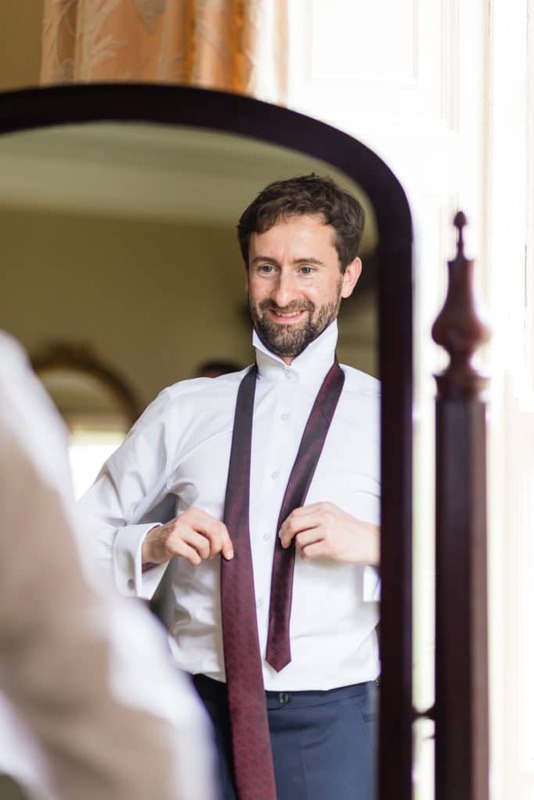 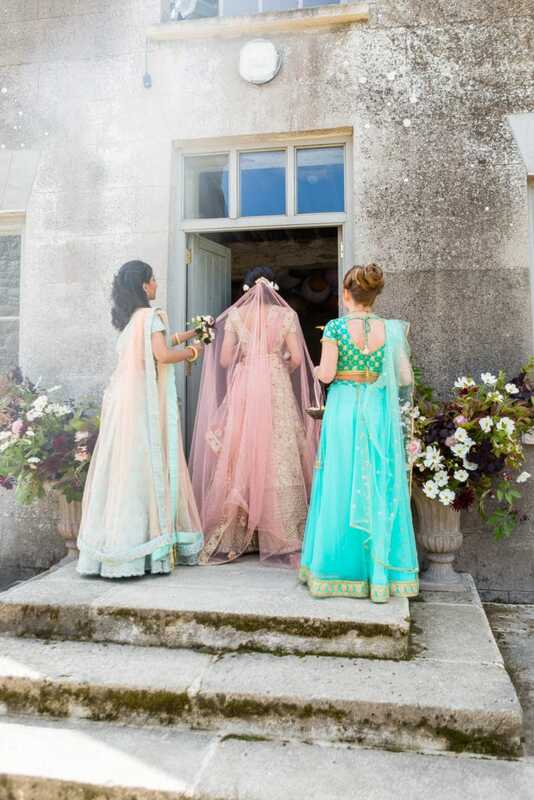 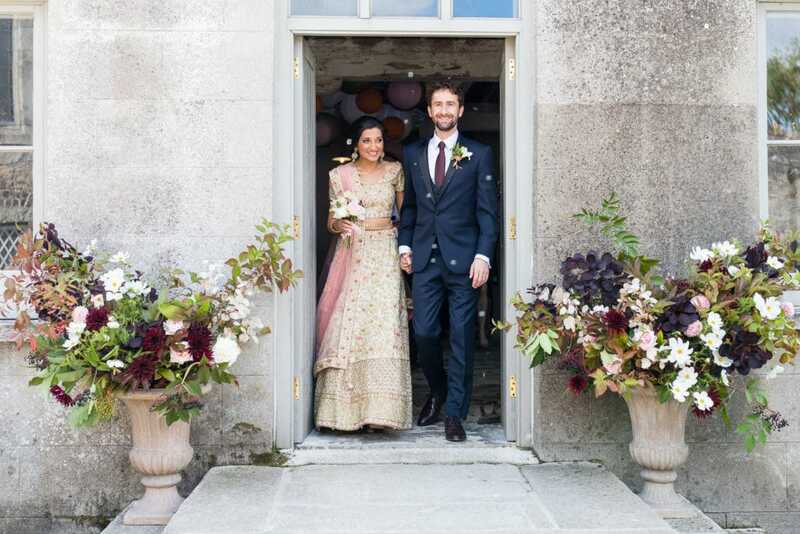 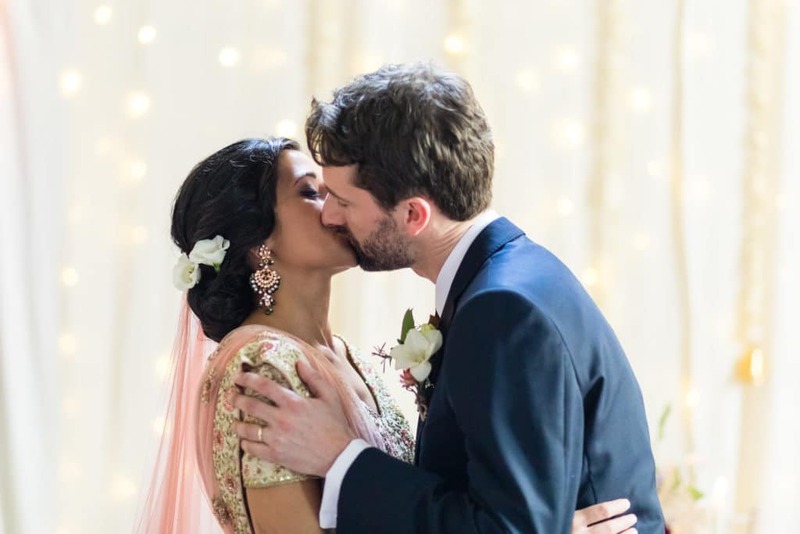 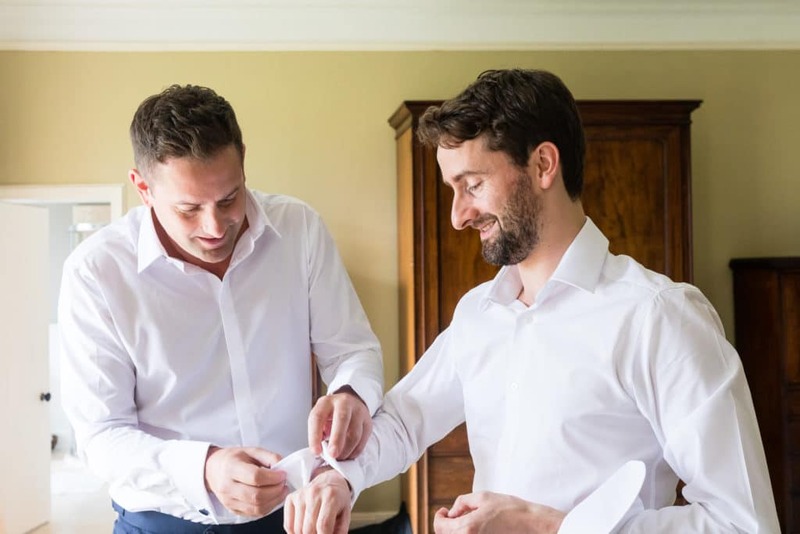 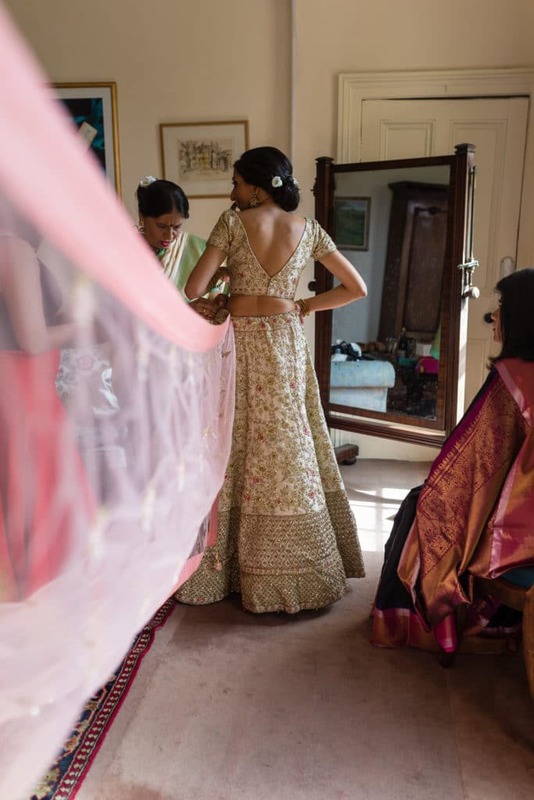 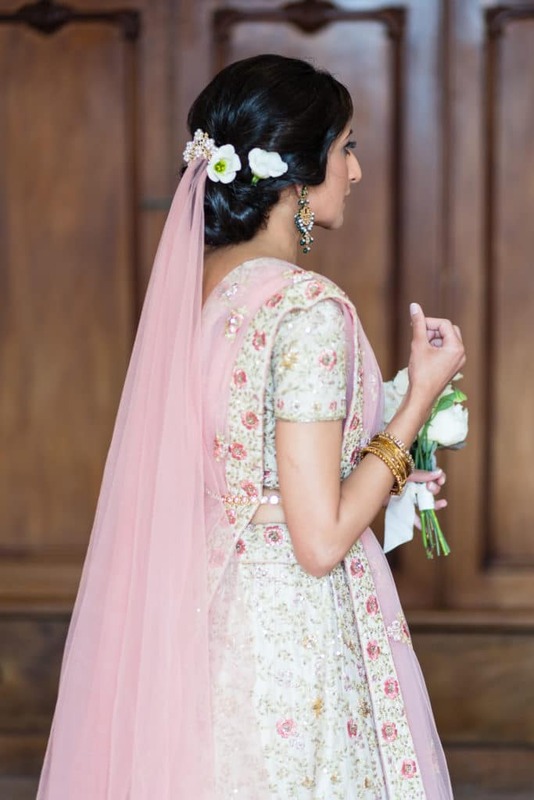 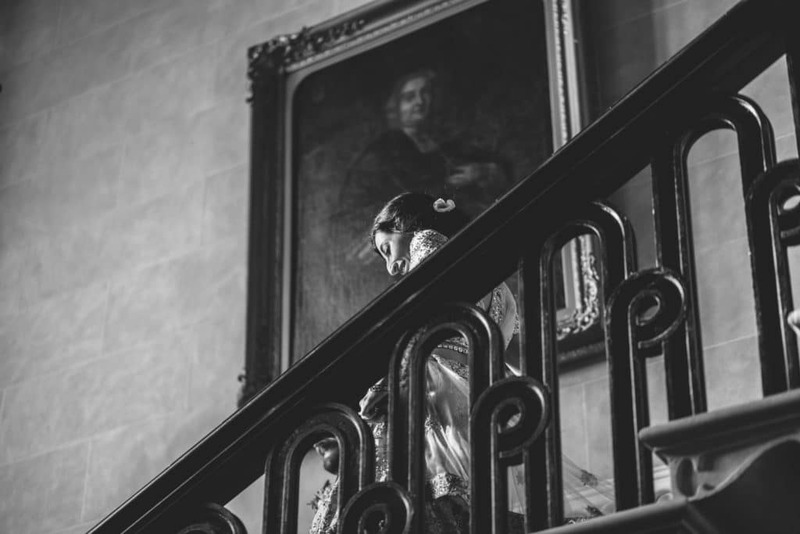 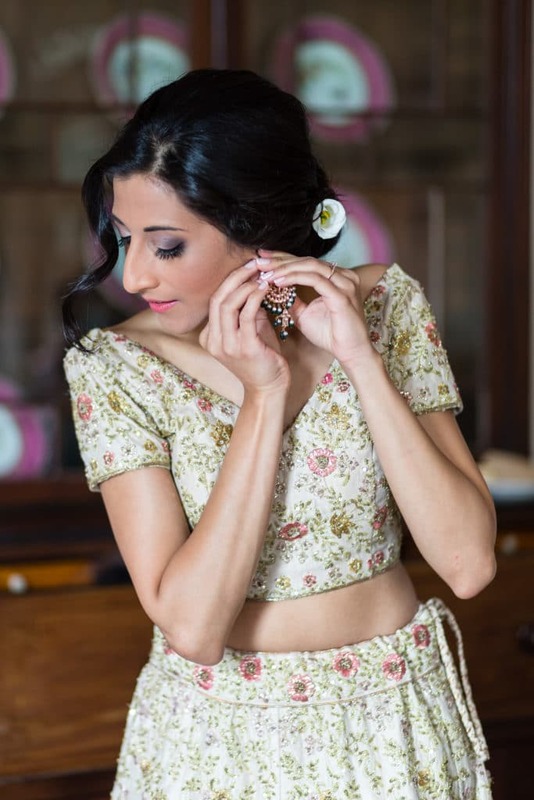 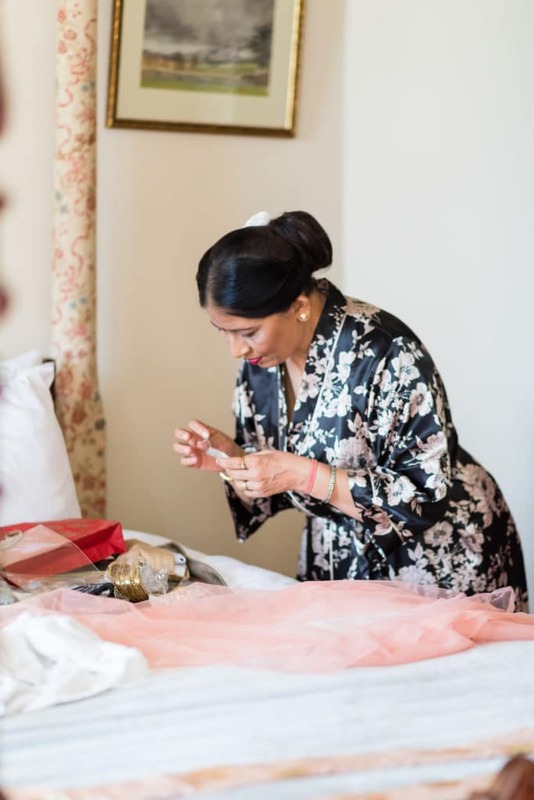 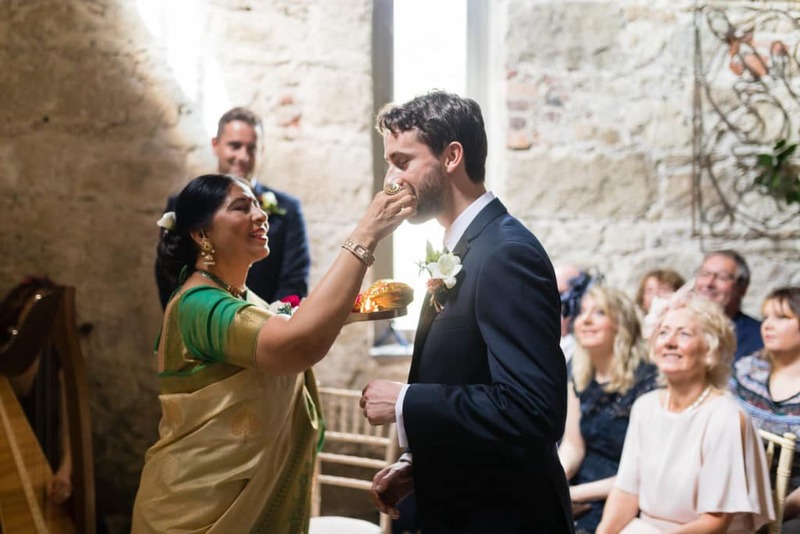 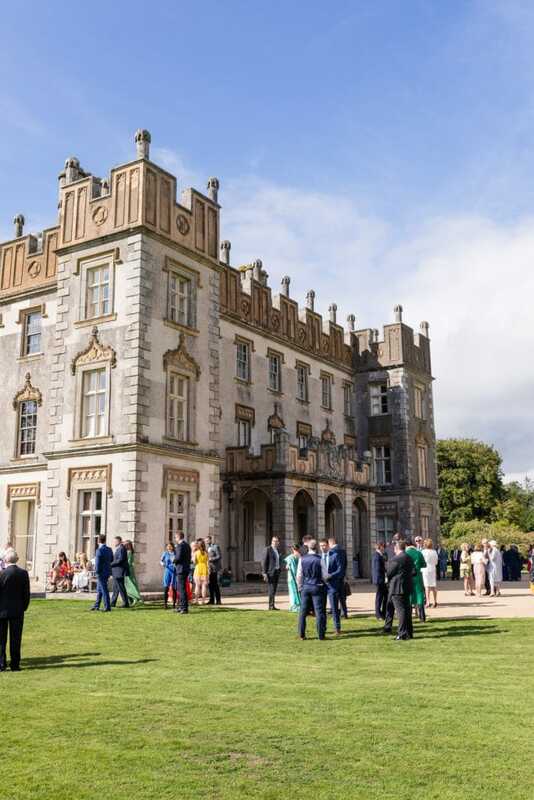 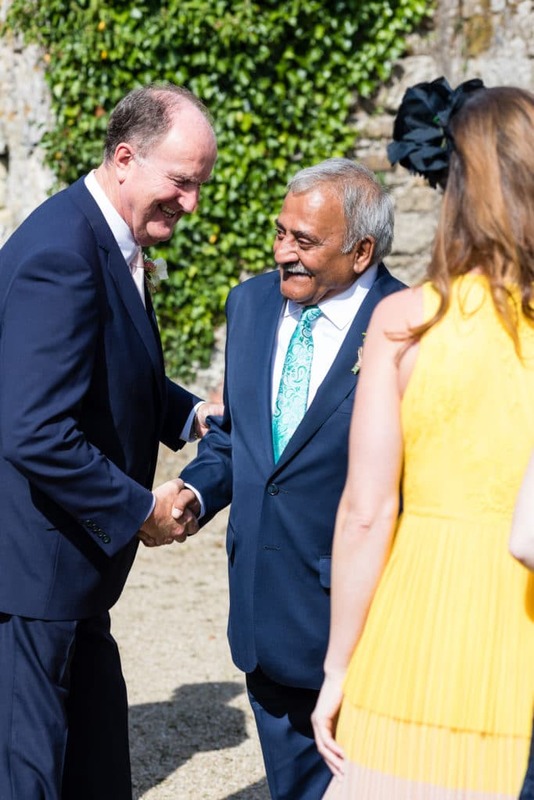 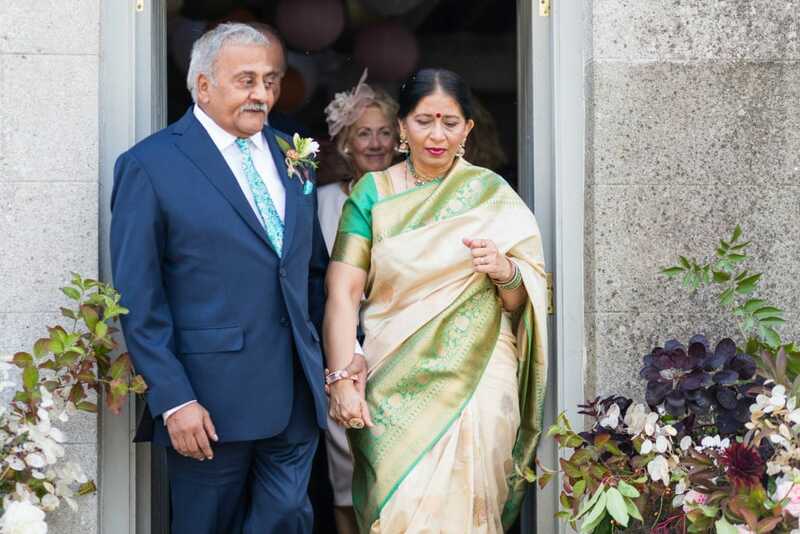 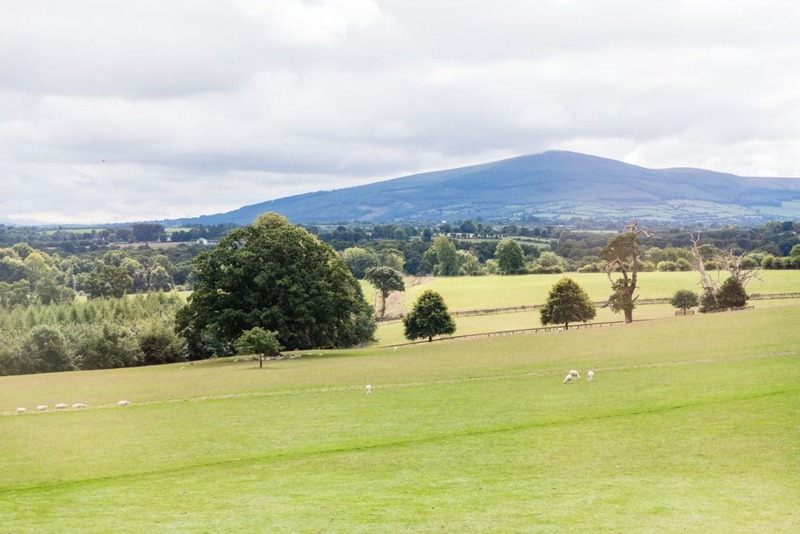 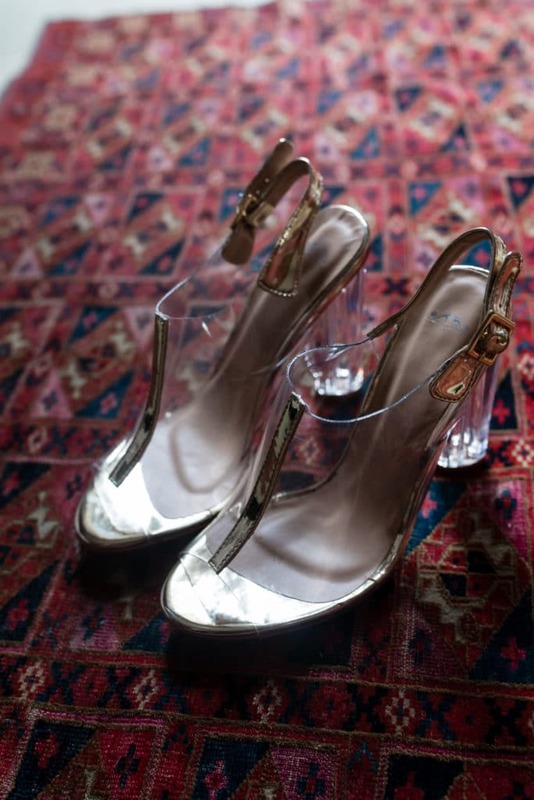 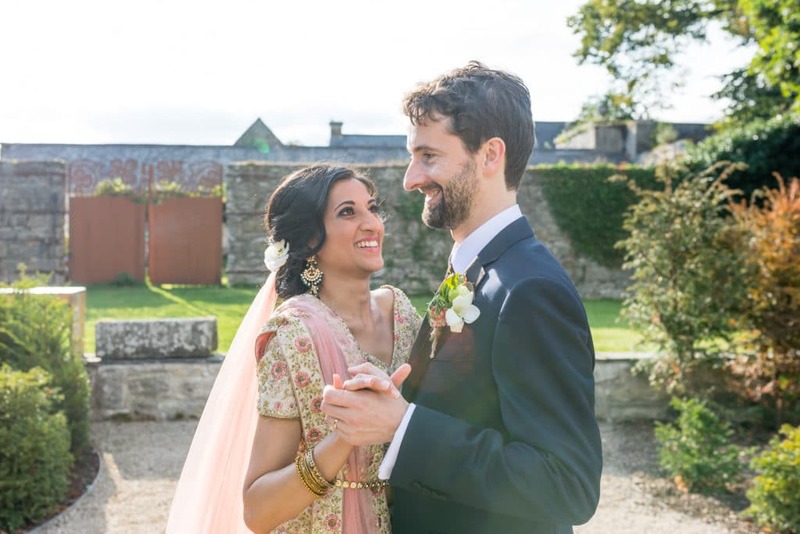 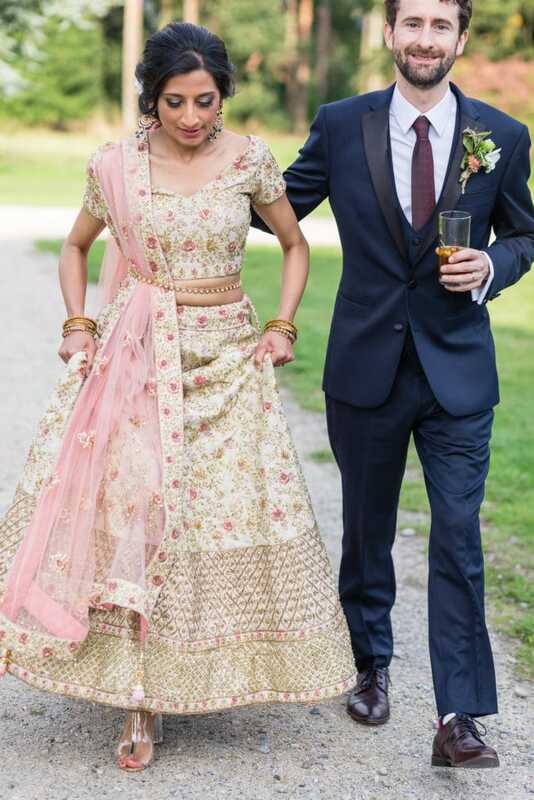 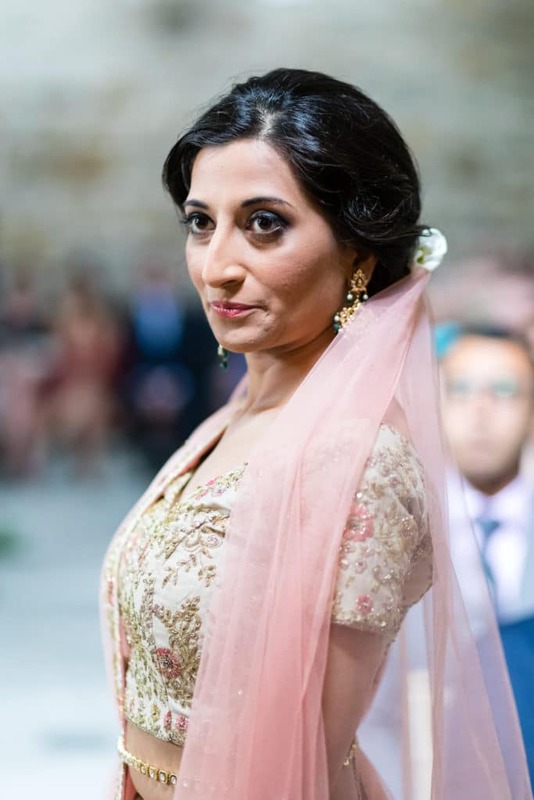 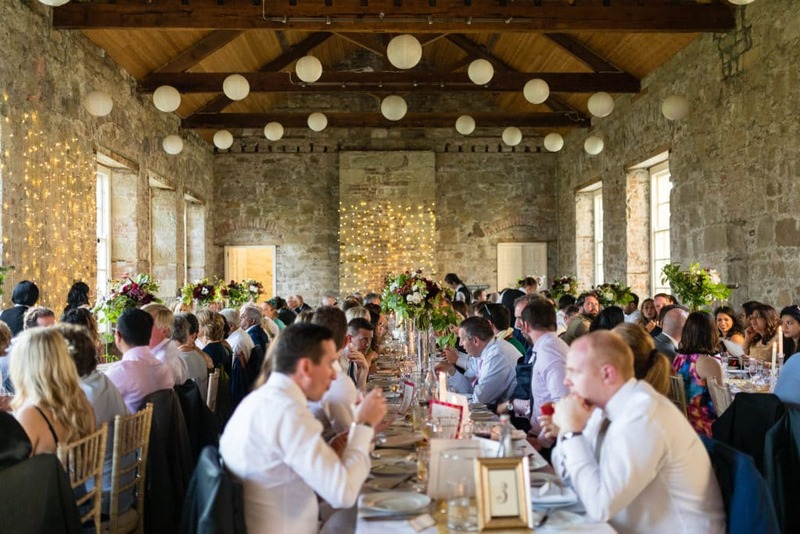 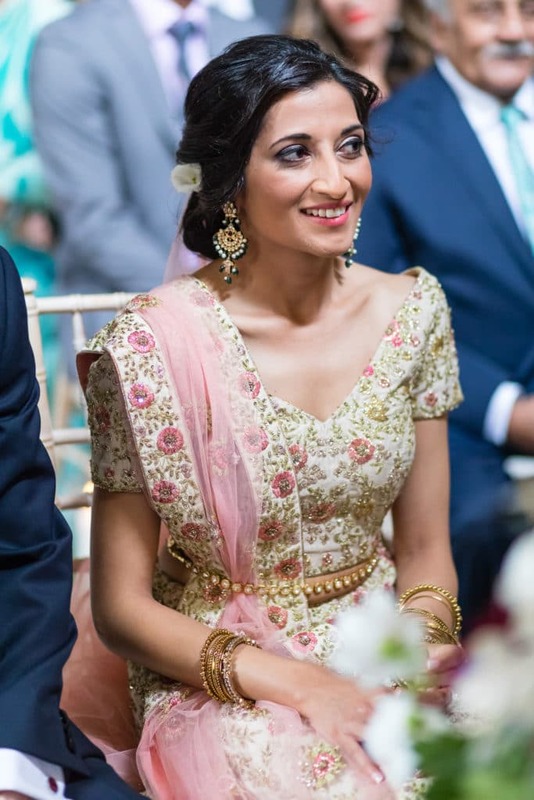 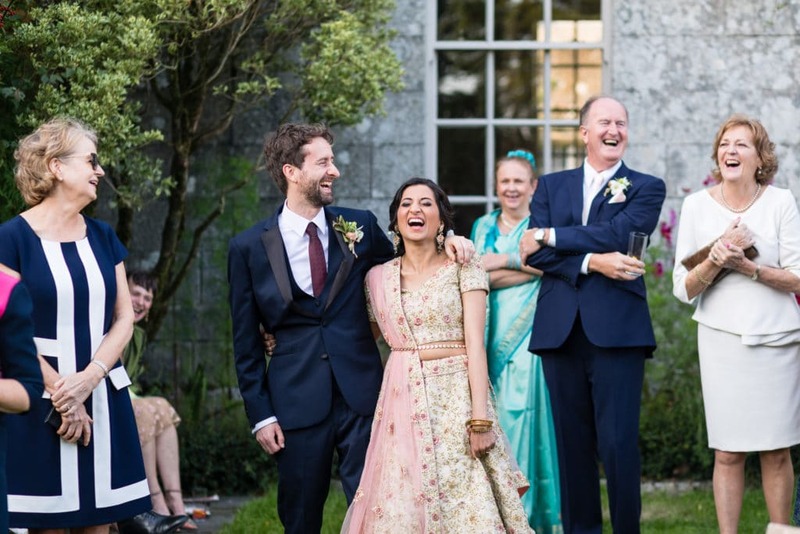 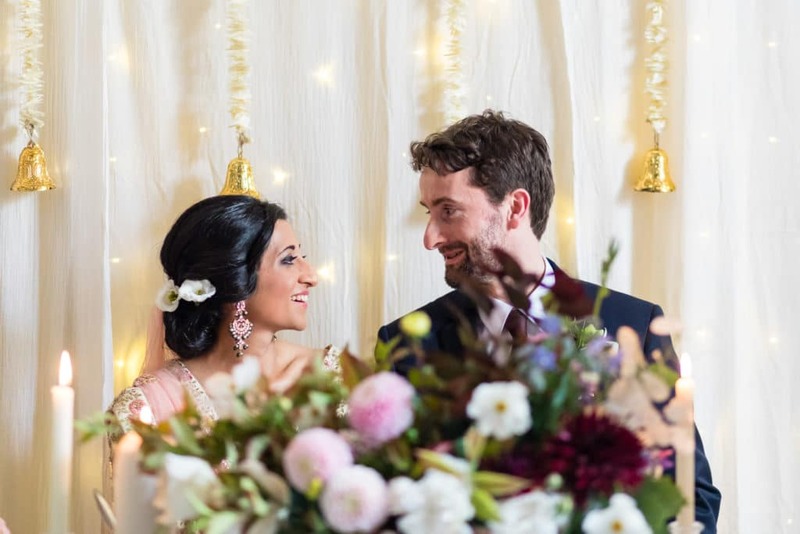 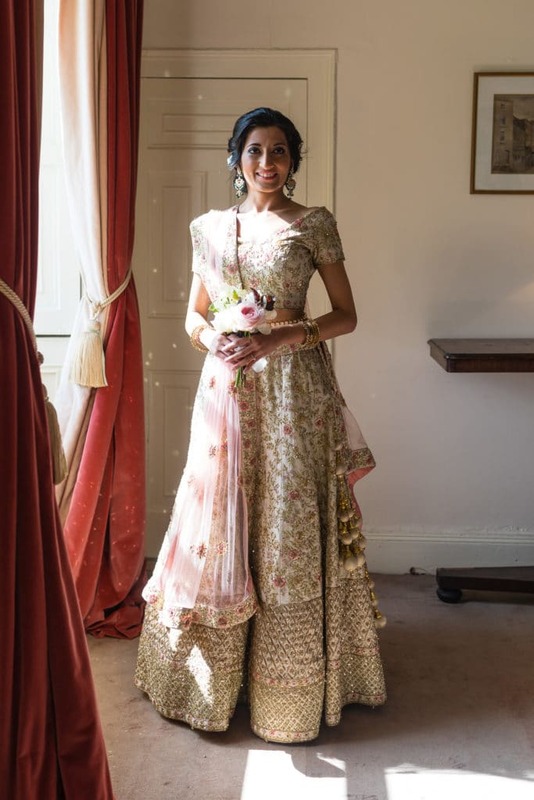 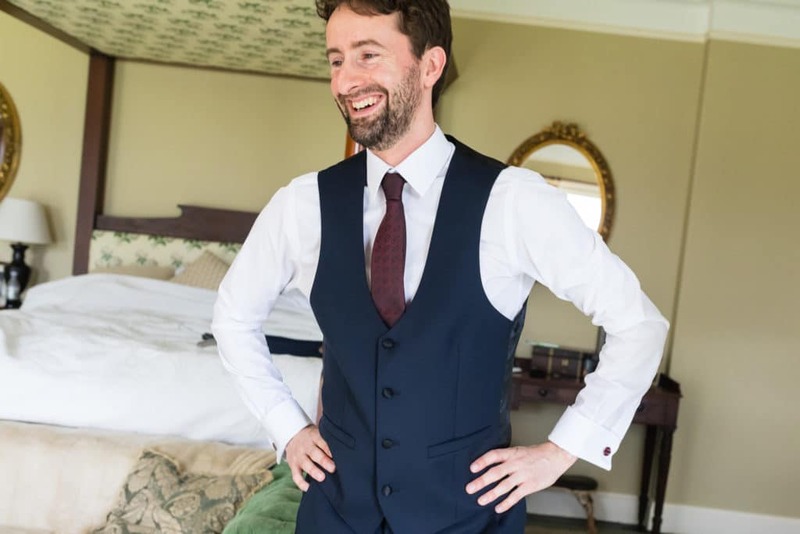 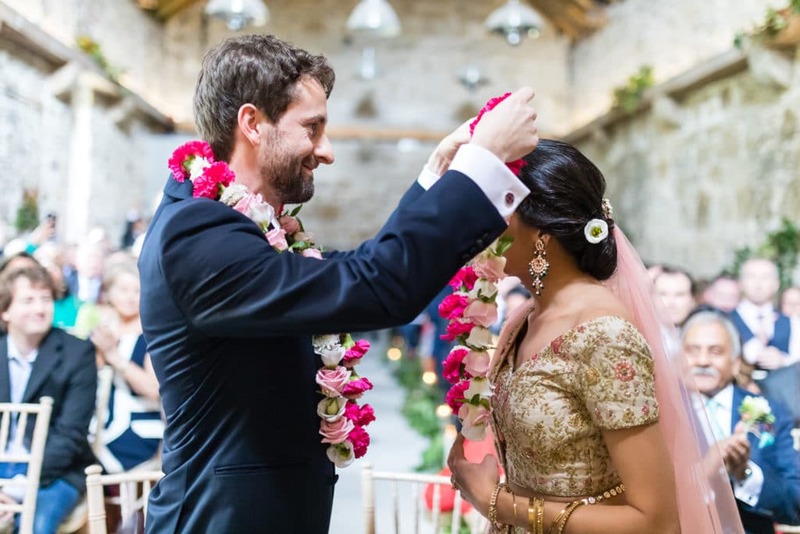 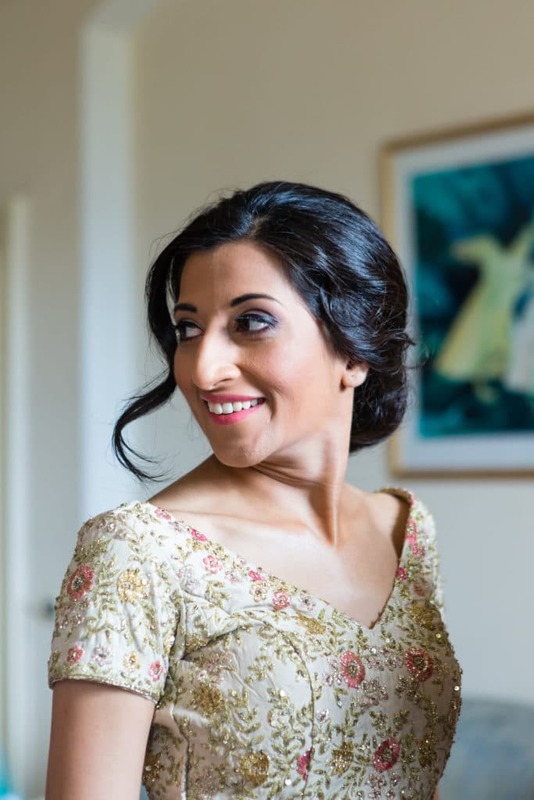 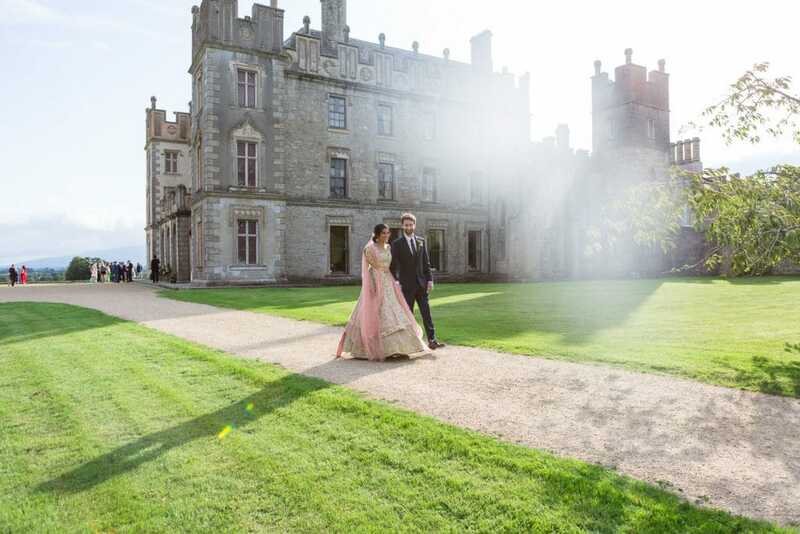 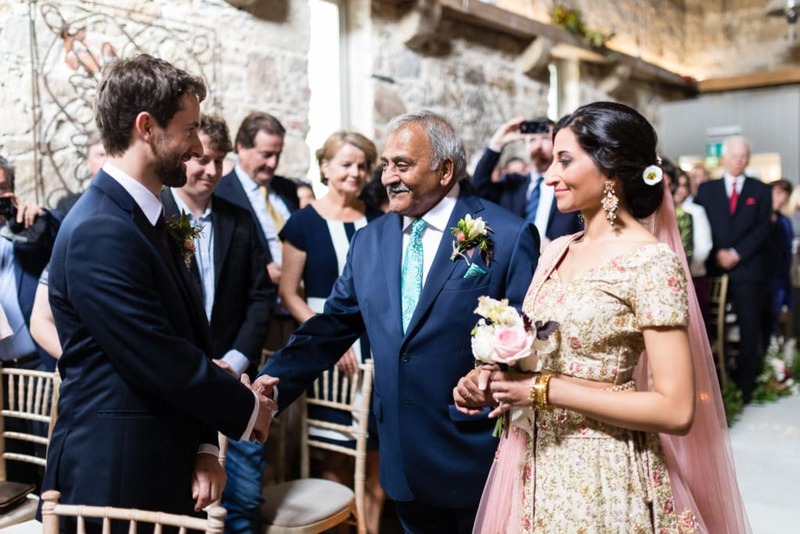 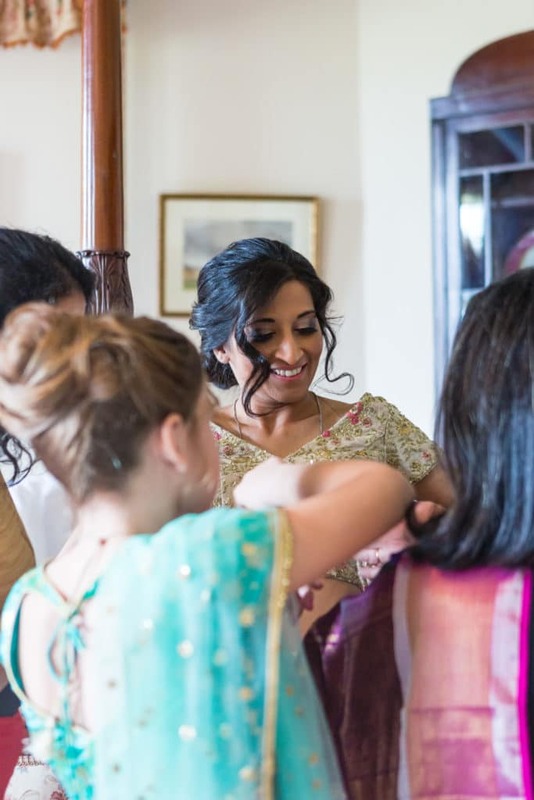 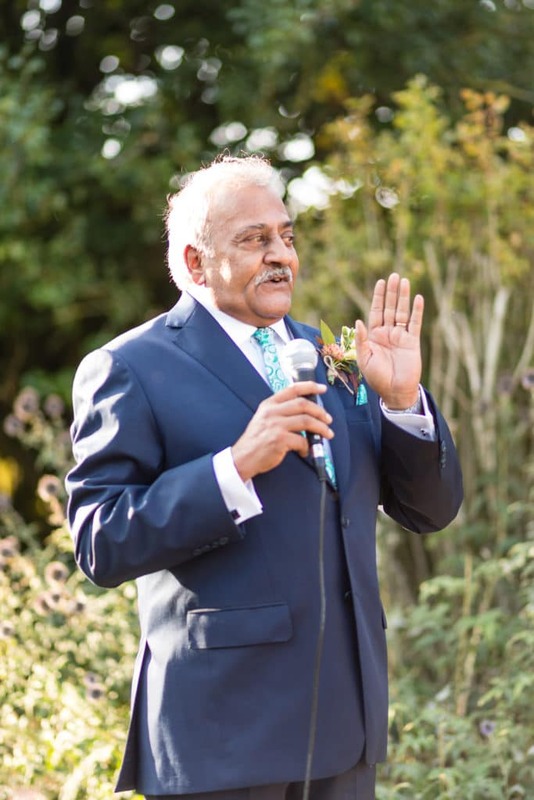 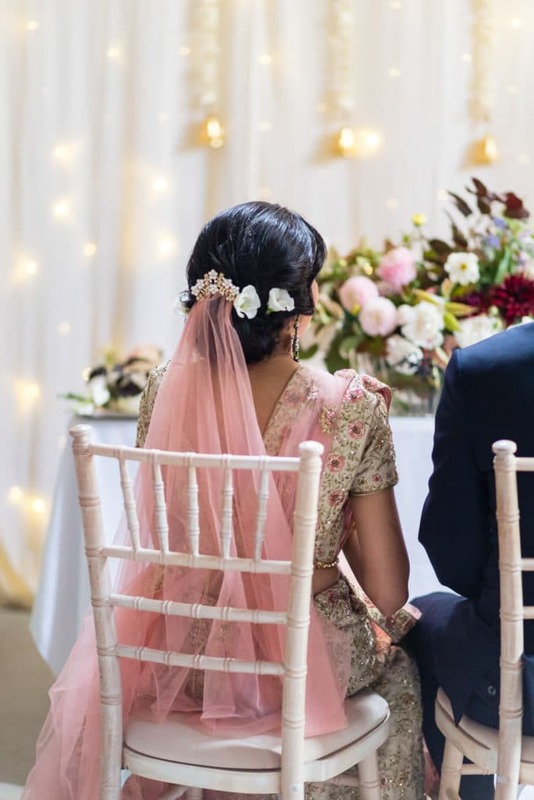 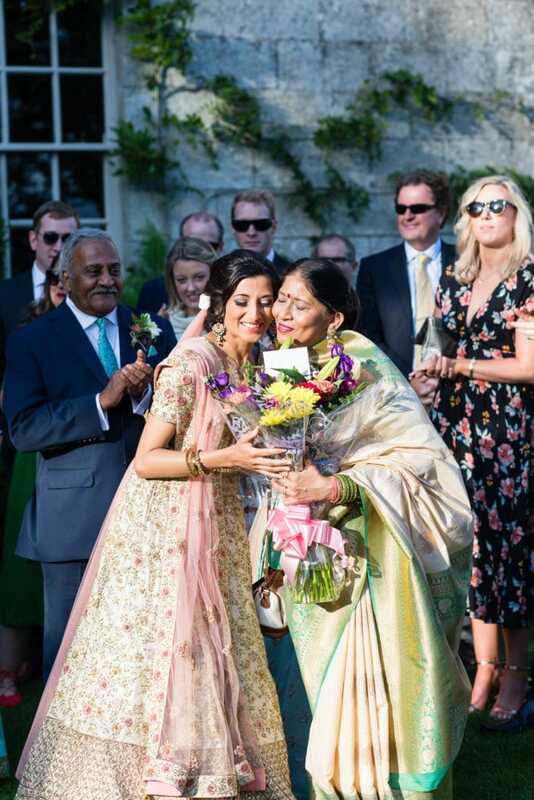 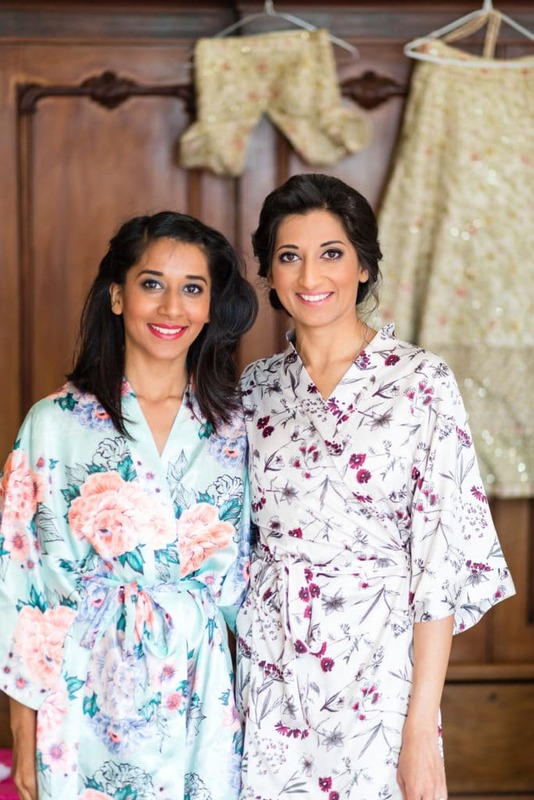 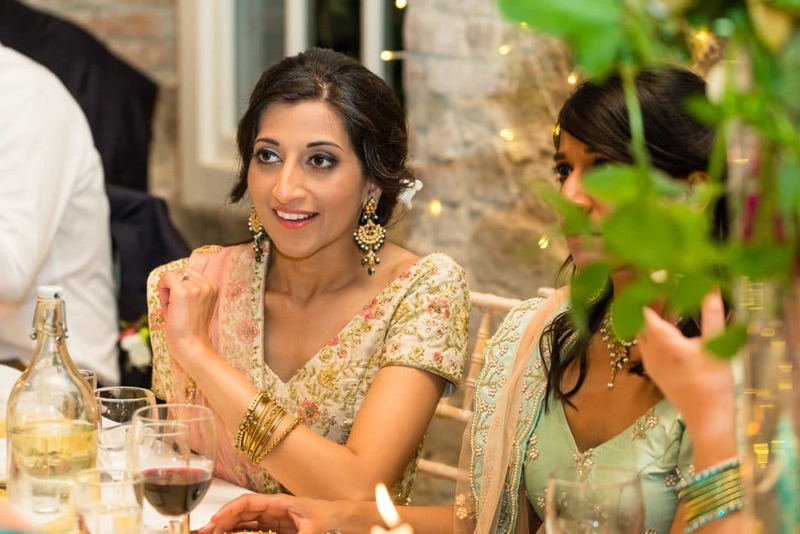 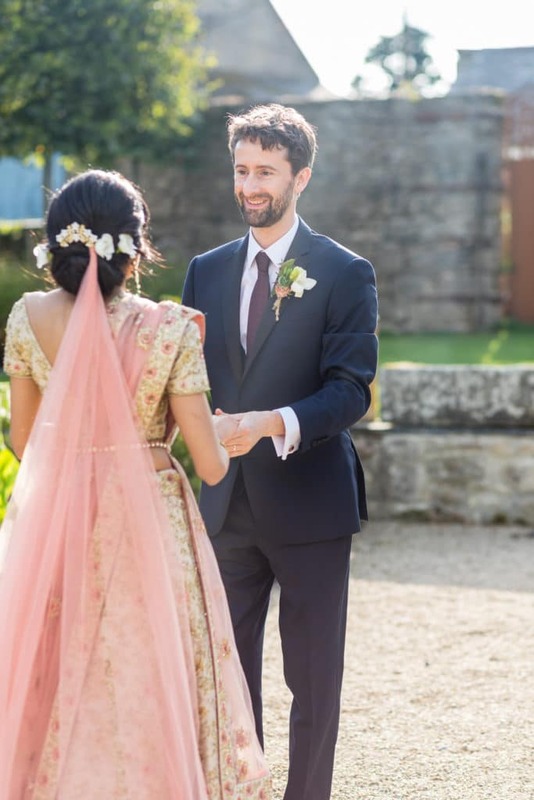 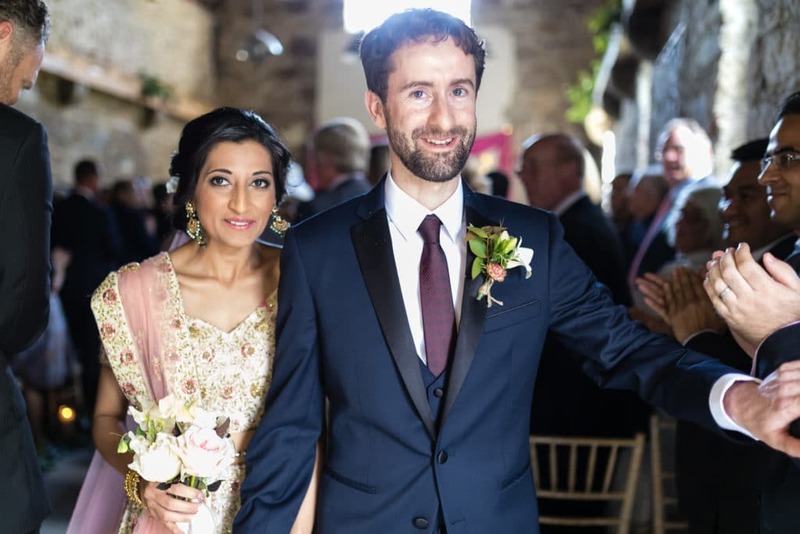 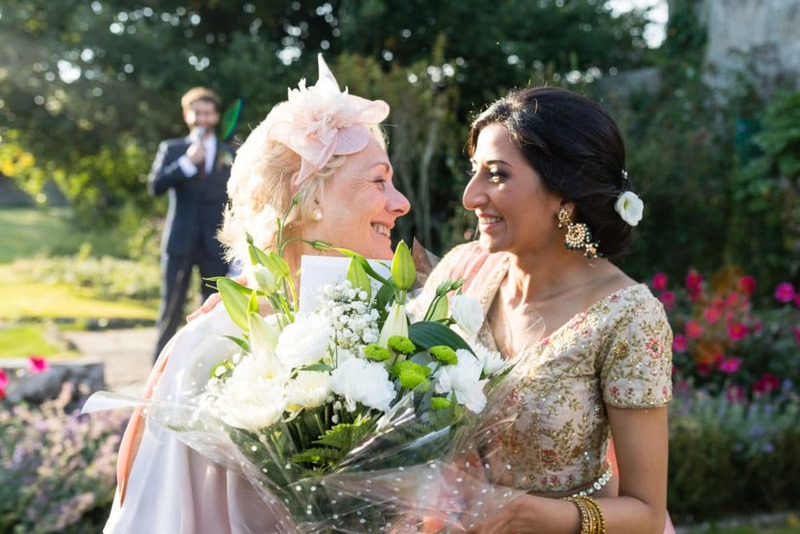 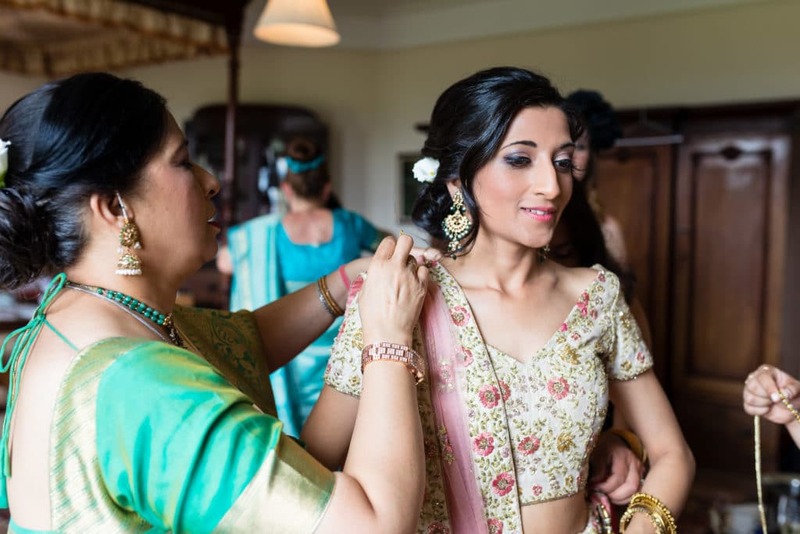 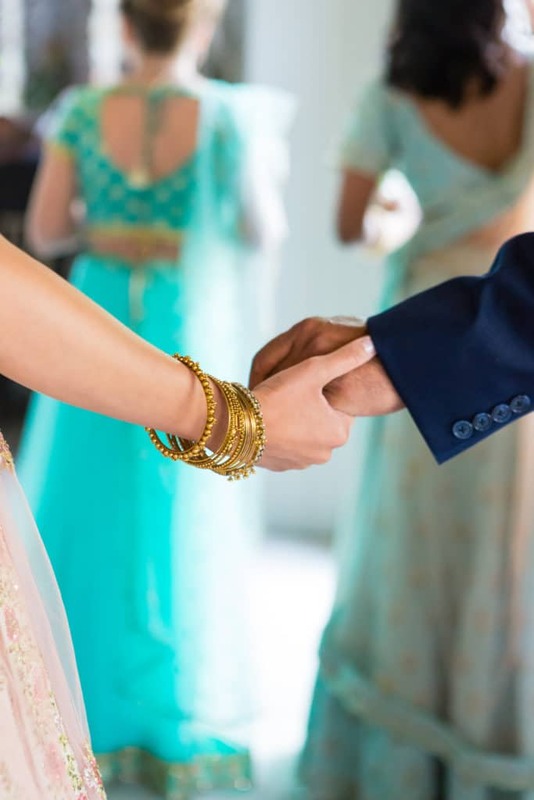 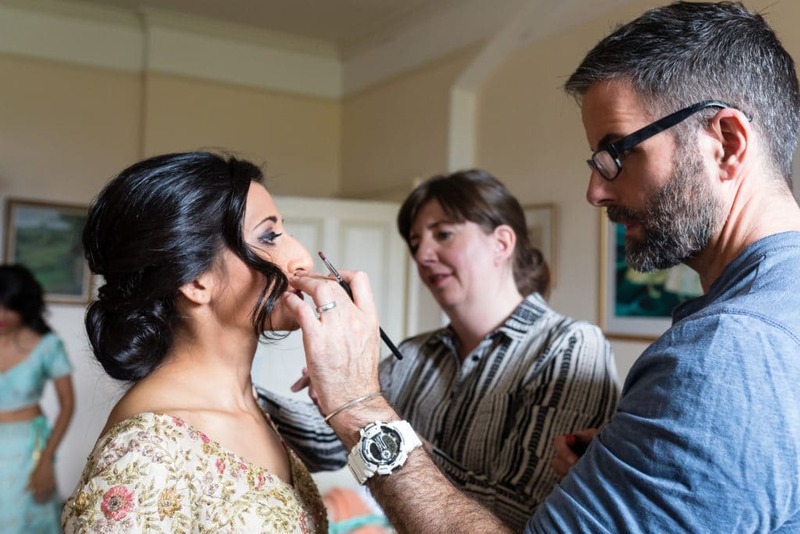 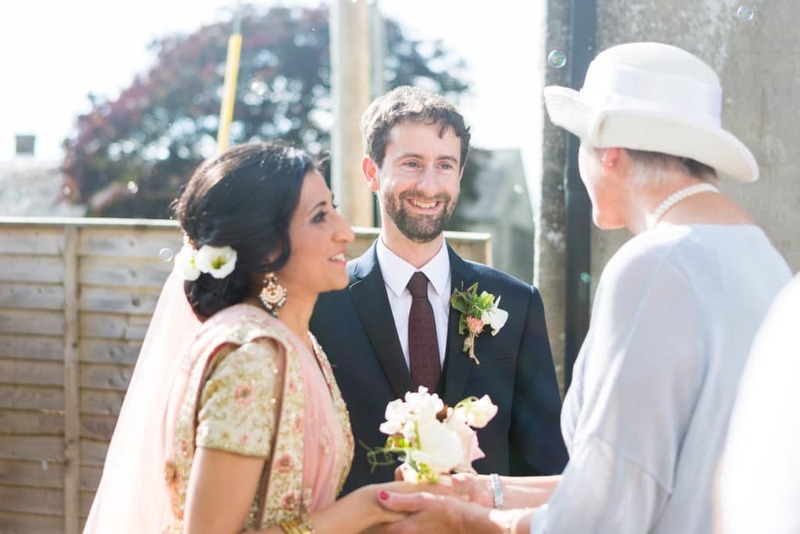 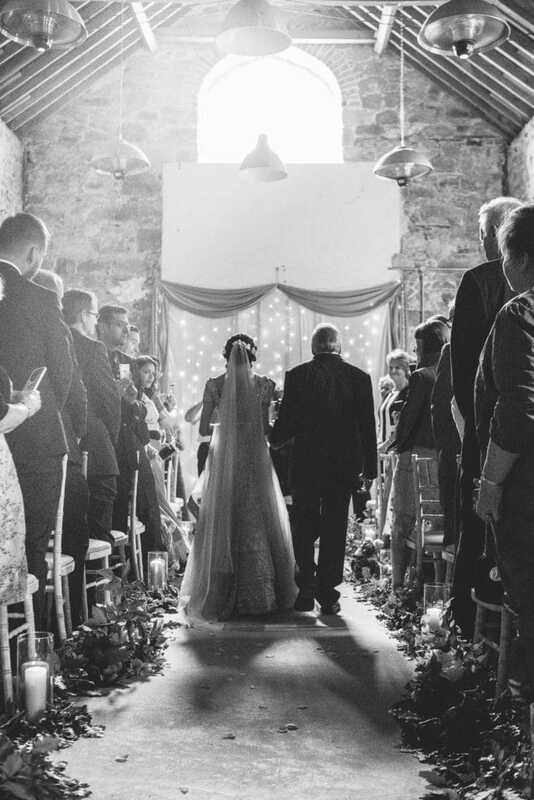 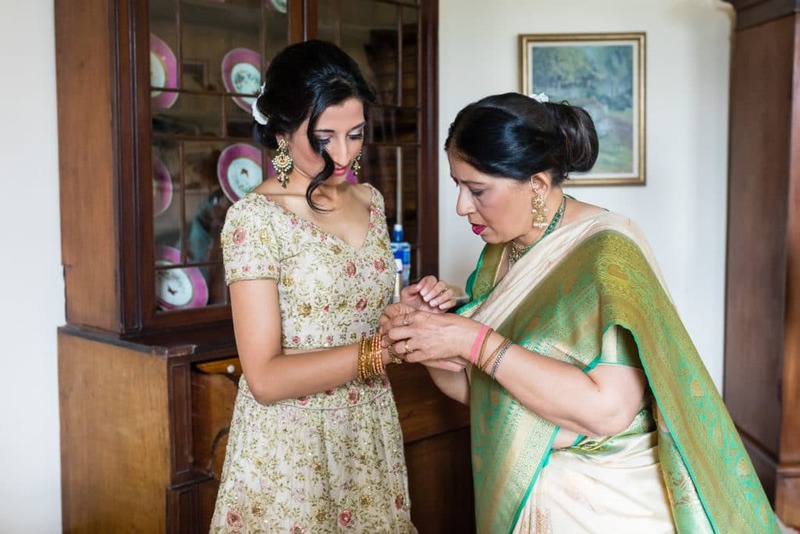 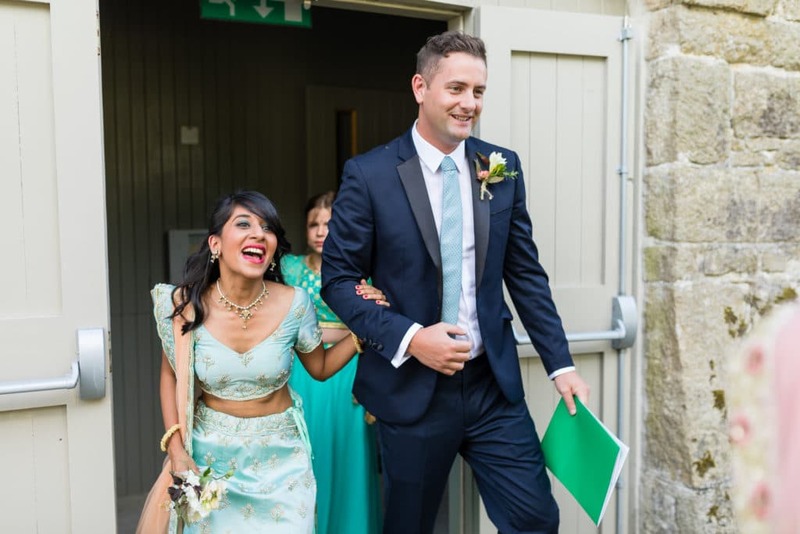 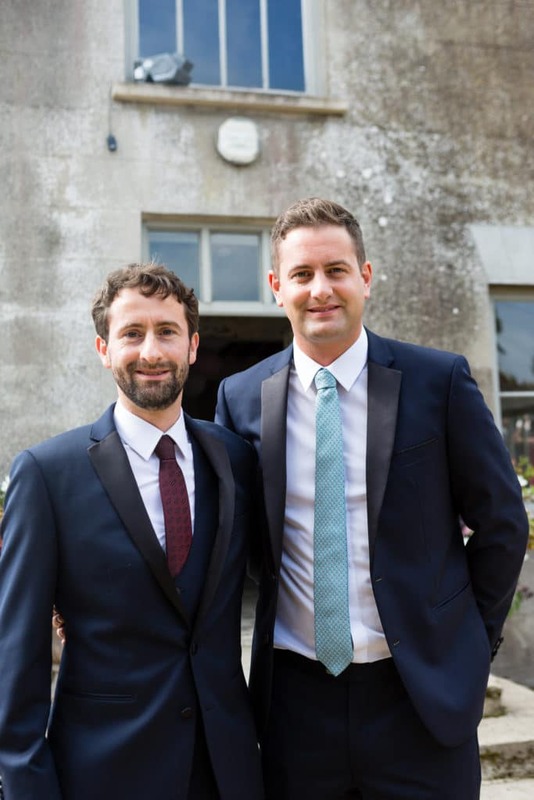 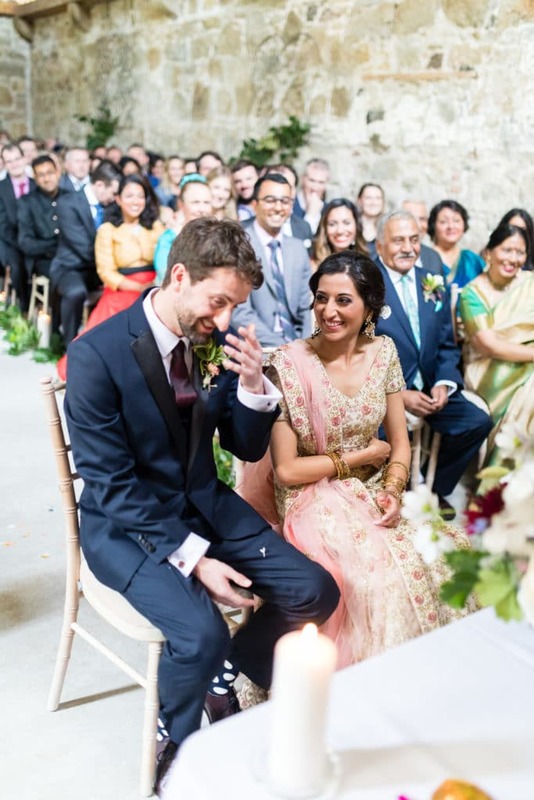 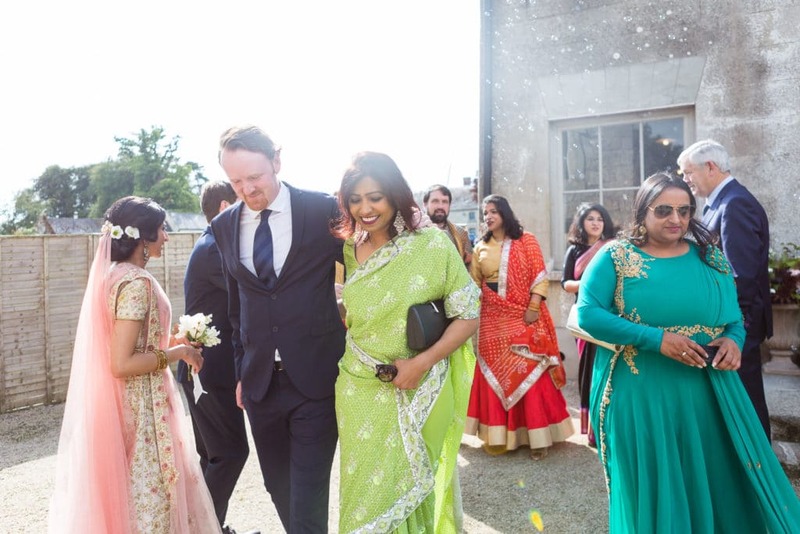 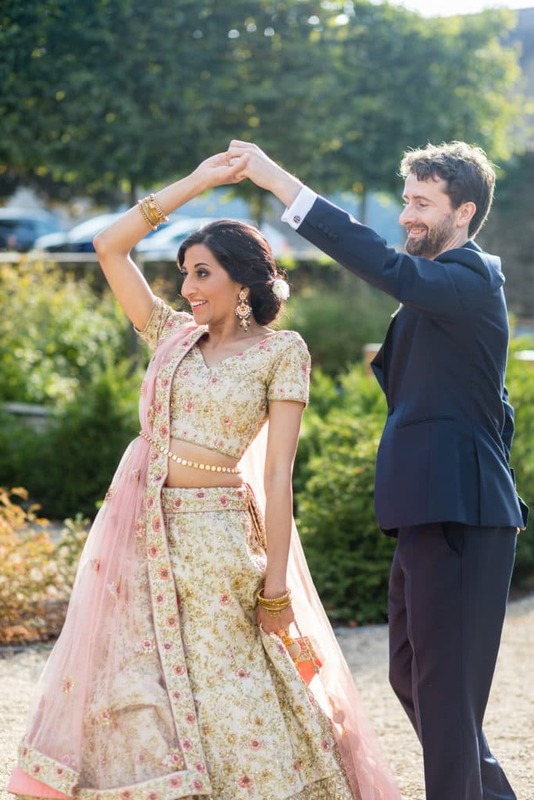 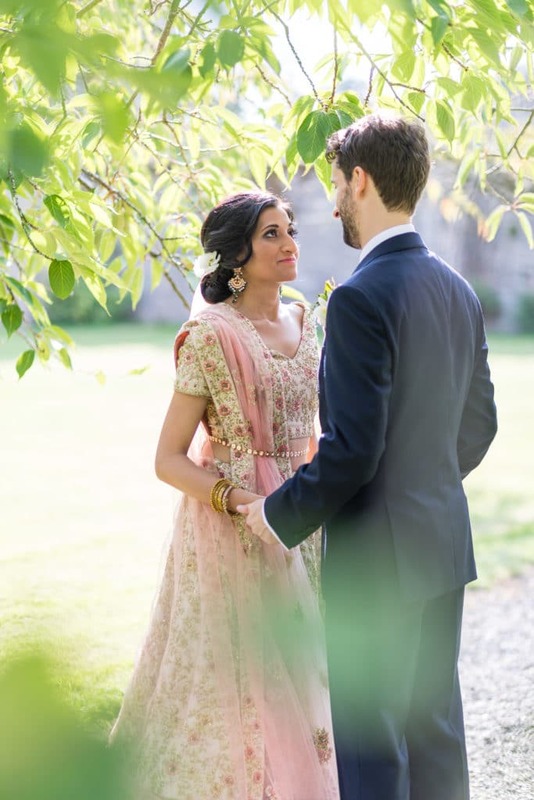 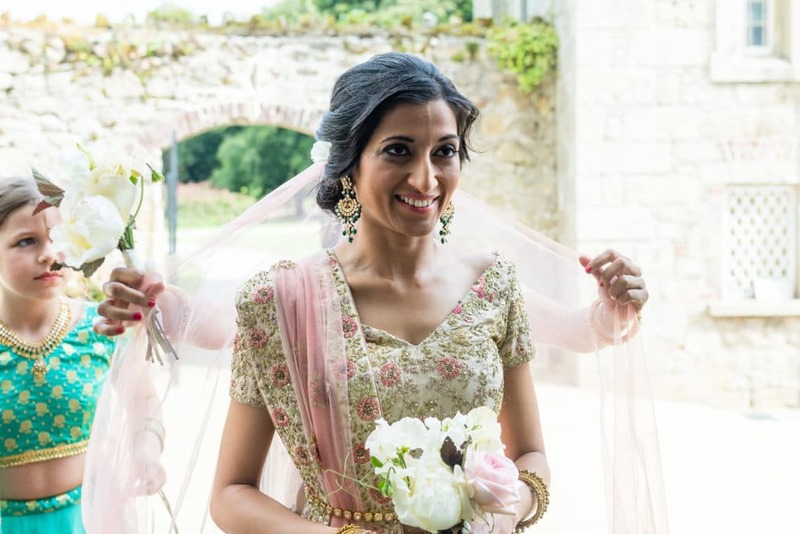 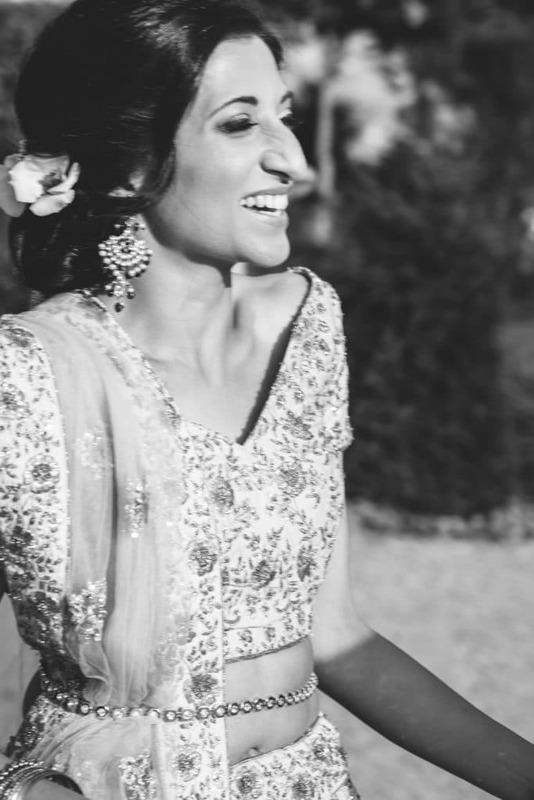 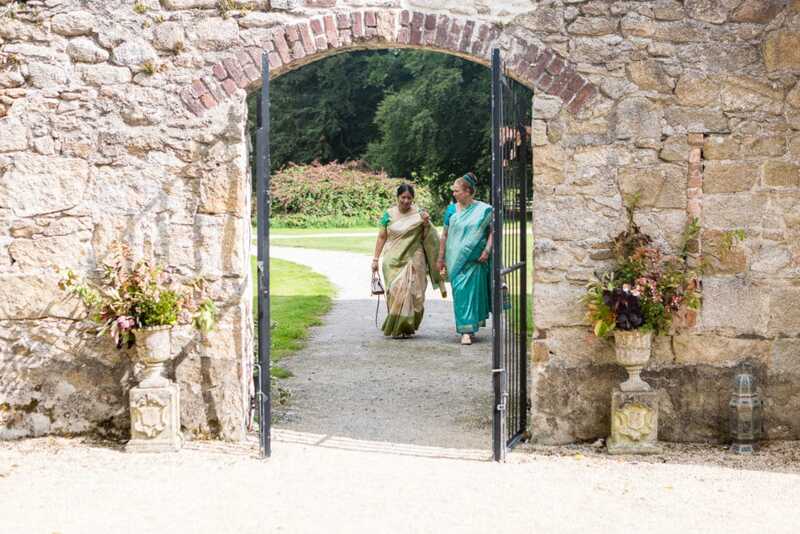 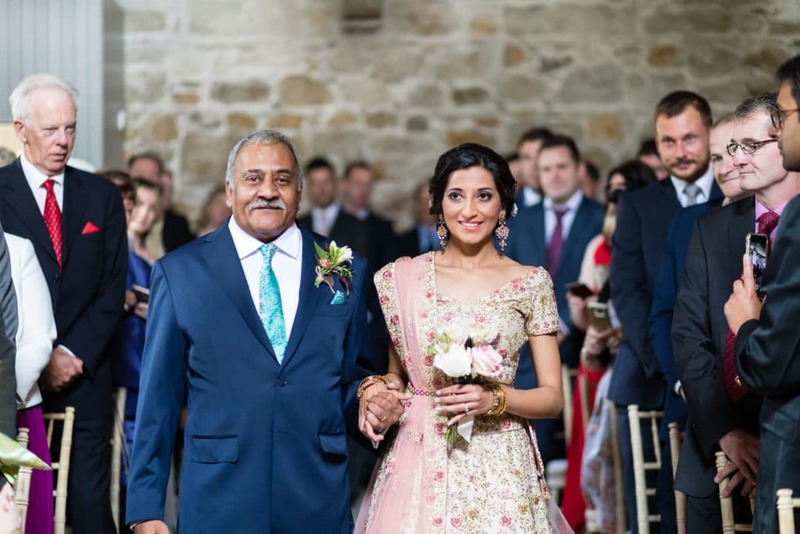 Without further ado, I give you Copal & Myles’ multicultural, Indian-Irish Borris House Wedding!